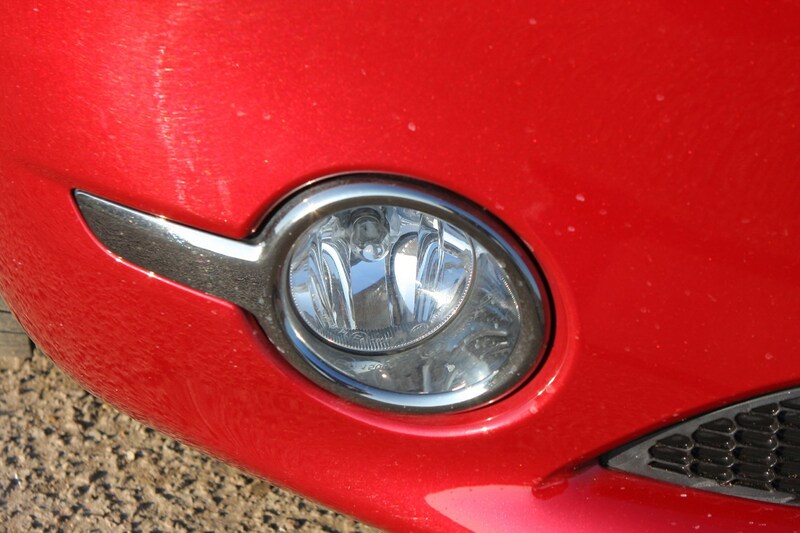 One of the highlights of this particular car – once you’ve got past that distinctive paintjob – is the brilliant 1.2-litre petrol engine. 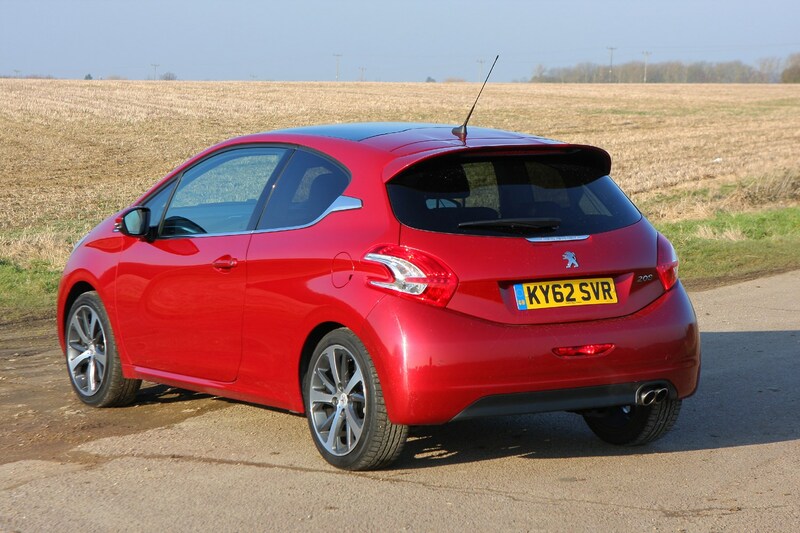 It’s a three-cylinder like many modern small cars, but in our minds it’s definitely one of the best. 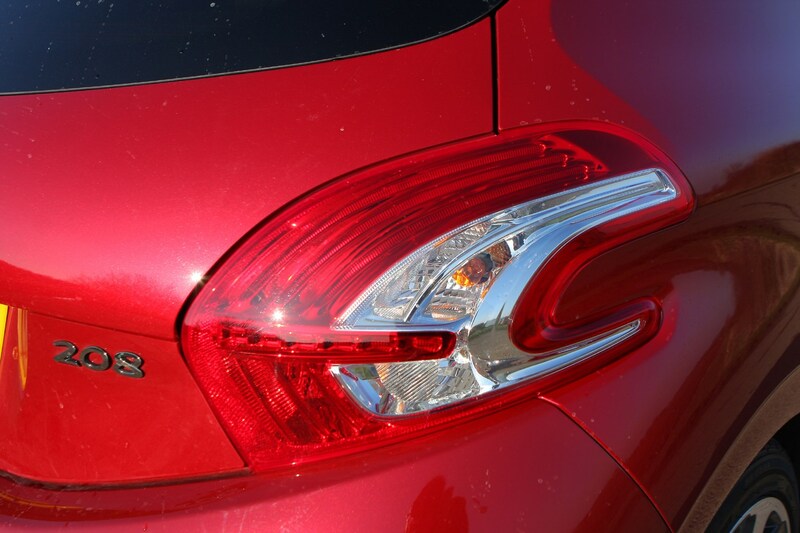 It’s not because it’s the most powerful engine on earth. 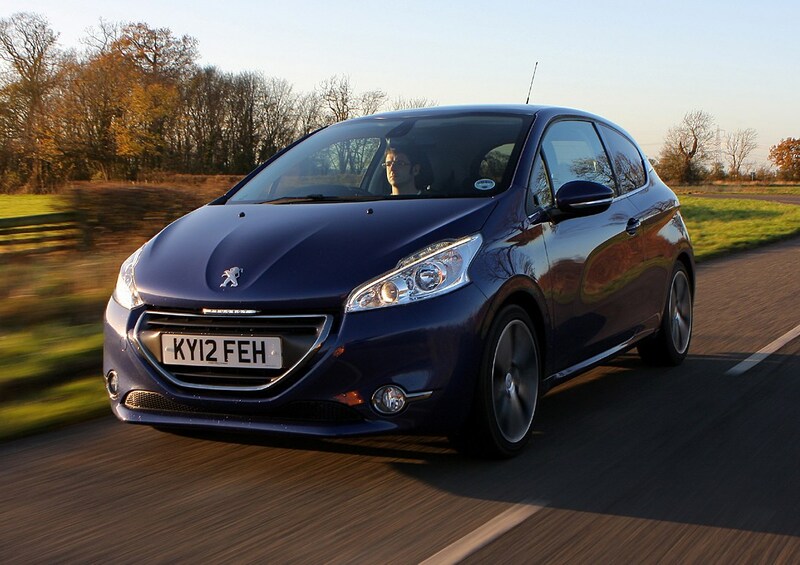 With 110hp and 205Nm, the 208 is only ever going to be modestly fast. 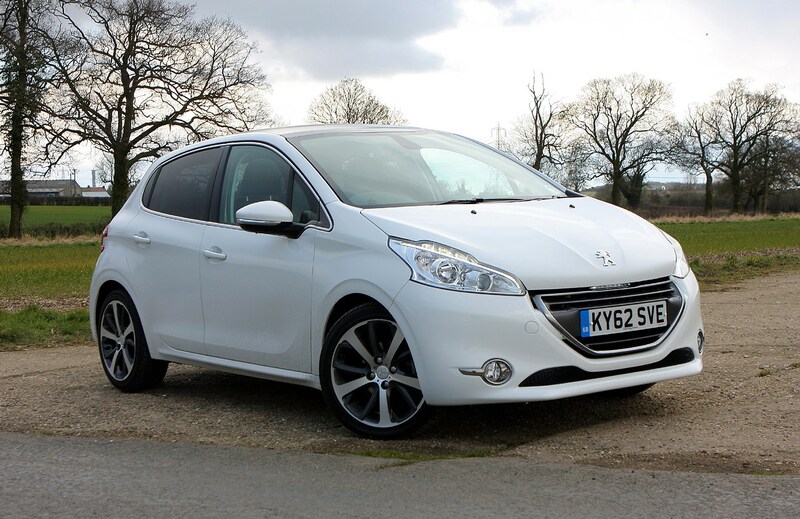 Its statistics back that up, with a 9.6-second sprint from 0-62mph and a 118mph top speed; it’s the way it generates its oomph that pleases. 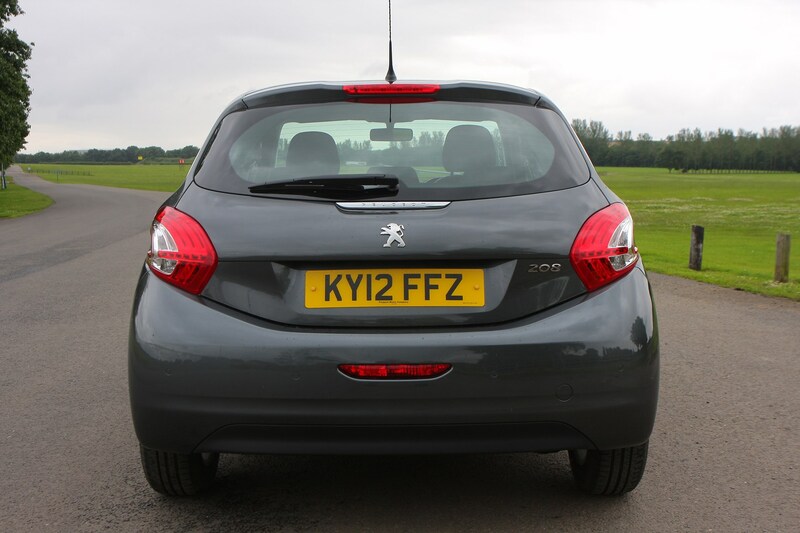 It’s very responsive and has a smooth, free-revving nature, eager to chase the red line in every gear. 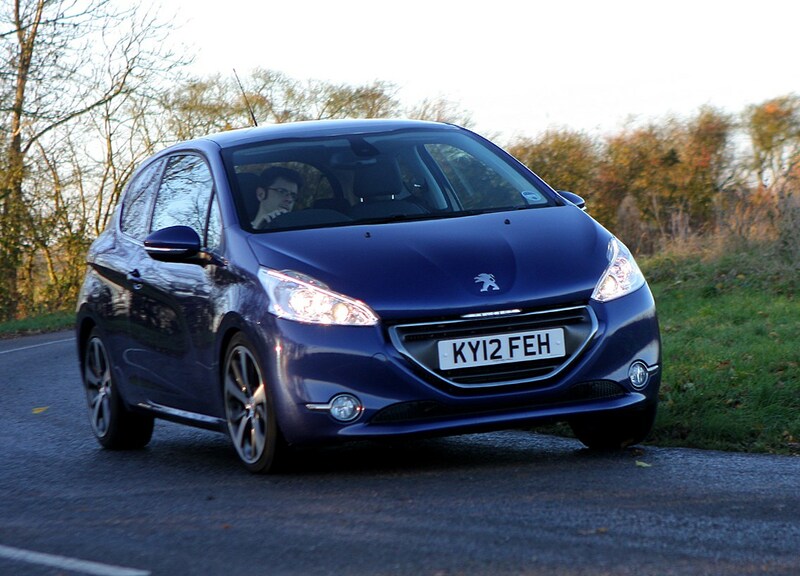 Peugeot claims fuel economy for this car is 62.8mpg, and while that’s unlikely to be achievable in the real world, 50mpg certainly isn’t out of the realms of possibility. 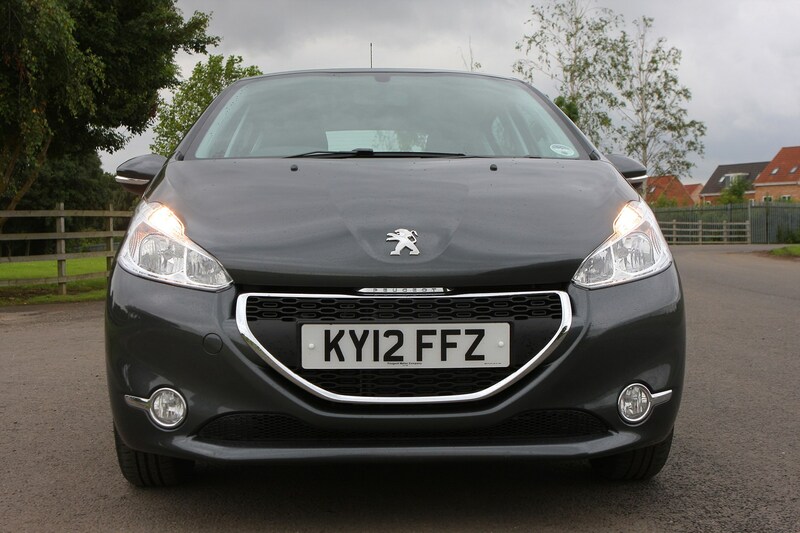 Keen Peugeot-spotters will notice the 208’s mild facelift with a re-profiled grille and revised lights. 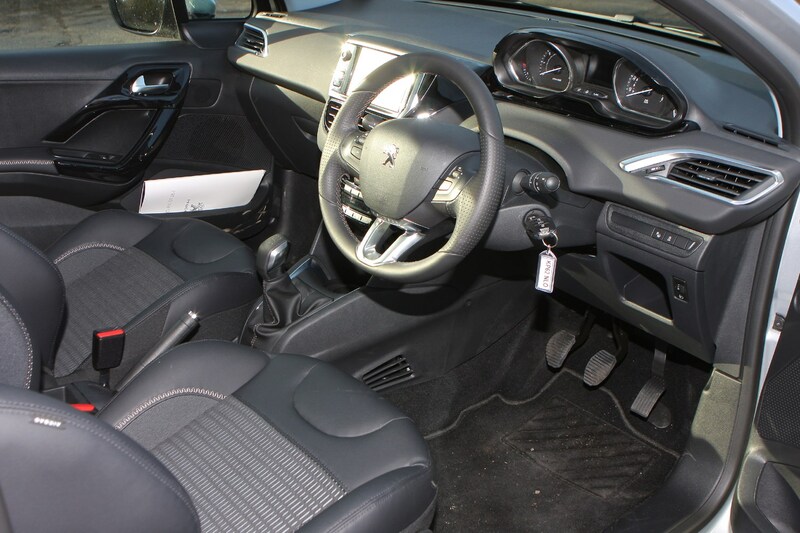 Additionally, this Allure specification 1.6-litre BlueHDi 100 comes complete with matte grey textured paint (a £645 option) and Lime Yellow detailing, inside and out, for a further £350. 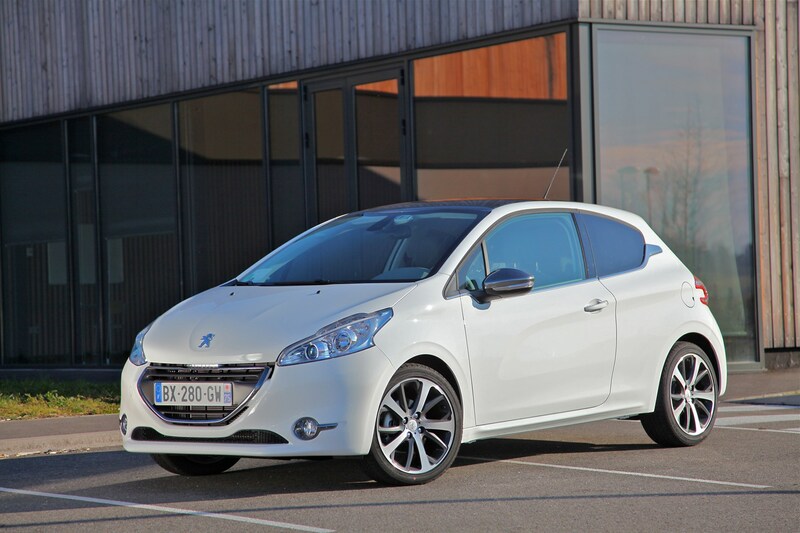 This 208 is impressively inexpensive to run, with CO2 emissions quoted at 87g/km it positively sips away at the diesel in its tank. 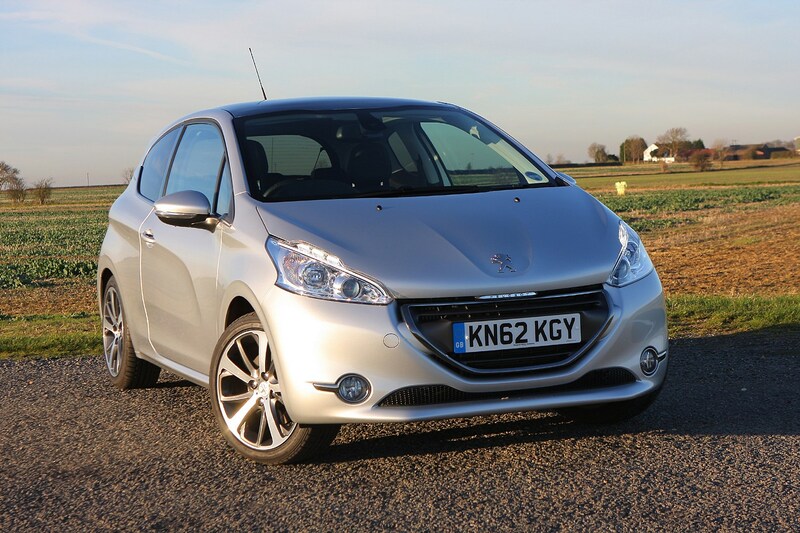 More surprising is that despite its frugality, it feels punchy on the road, delivering a turn of speed that feels quicker than 99hp should deliver and much more so than its 10.7 second 0-62mph time suggests. 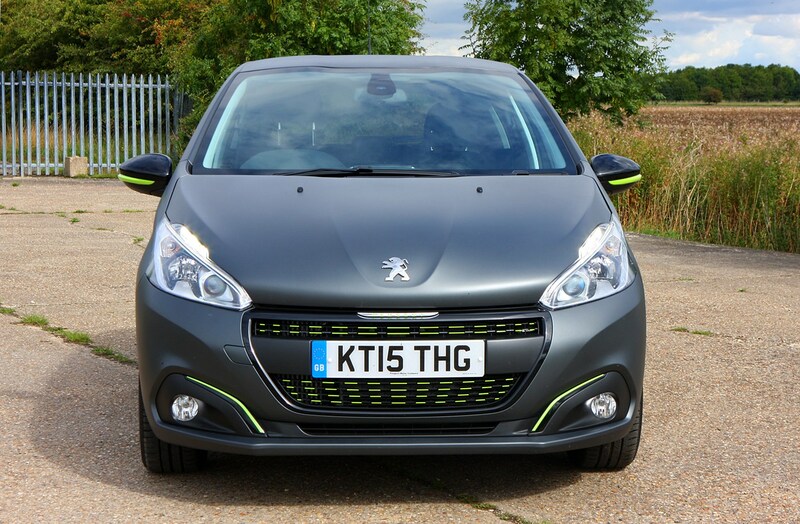 In fact, with 254Nm of torque available from just 1,750rpm, pulling away from junctions or completing overtakes, the 208 hints at a latent sportiness. 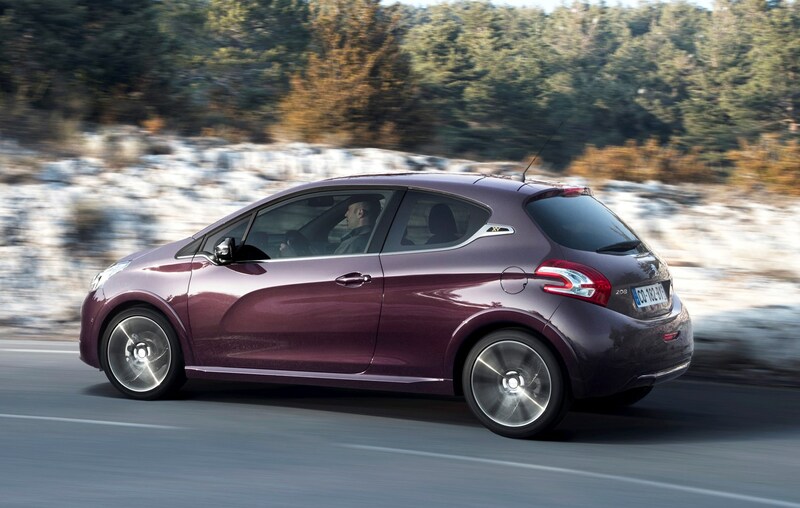 Blessing the Peugeot 208 with a short yet wide footprint makes it feel lithely agile through bends on your favourite back road as well as being really easy to manoeuvre around town. 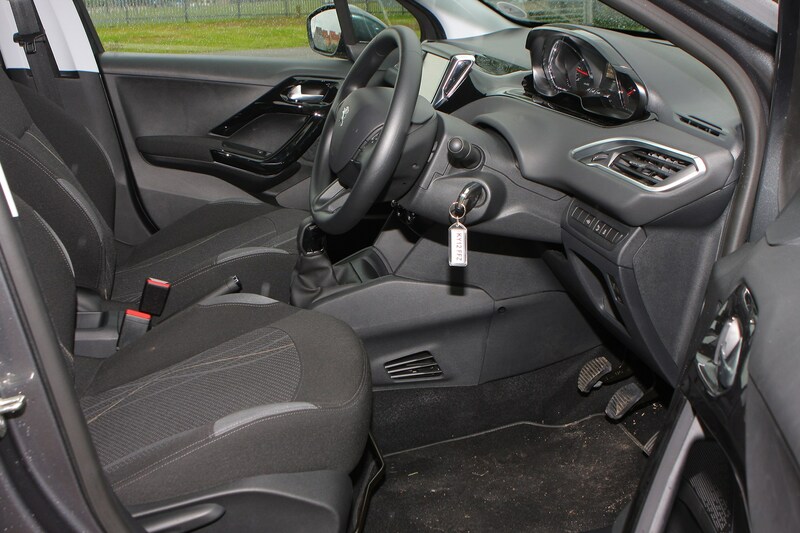 Similarly the steering feels light enough when parking in the confines of a multi-storey yet the car still feels enjoyable on open stretches of asphalt, progressively weighting up through bends. 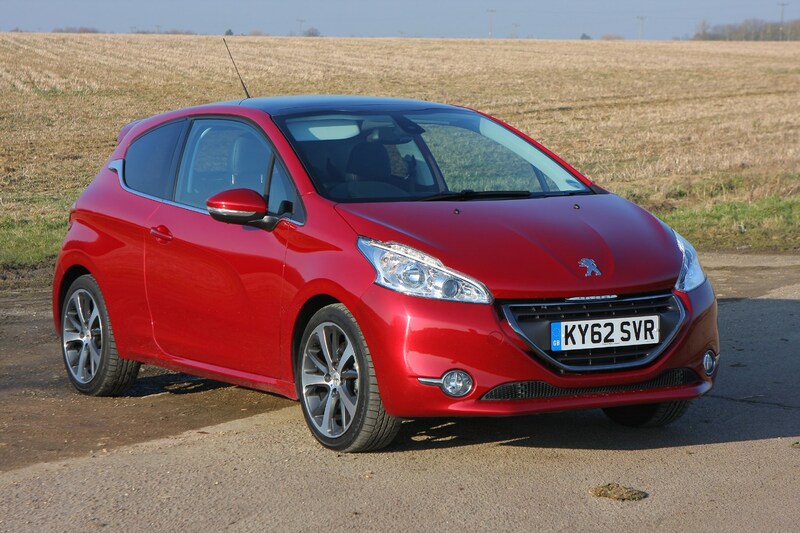 As a package the Peugeot 208 still lives in the shade of the Ford Fiesta and Volkswagen Polo but that doesn’t mean it’s not a small hatchback without a great deal of appeal. 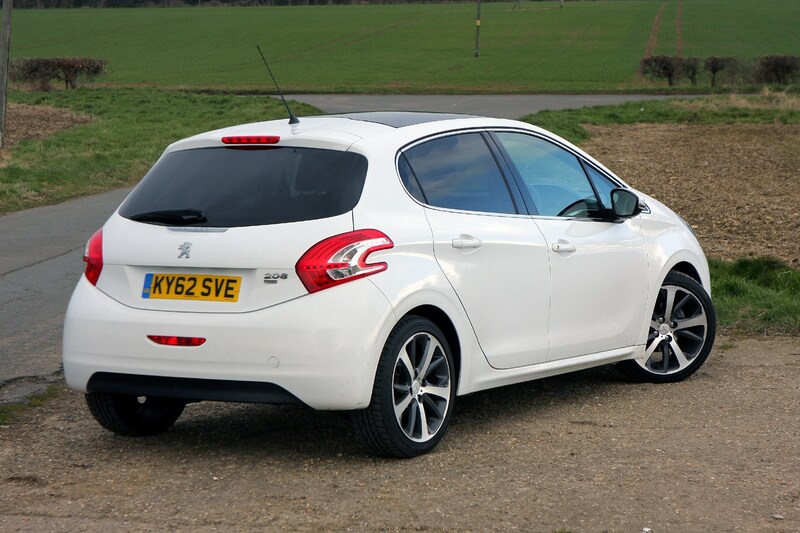 Accompanying the 2015 facelift for lesser 208s, Peugeot also revised its GTis, all benefitting from a power upgrade to 208hp. 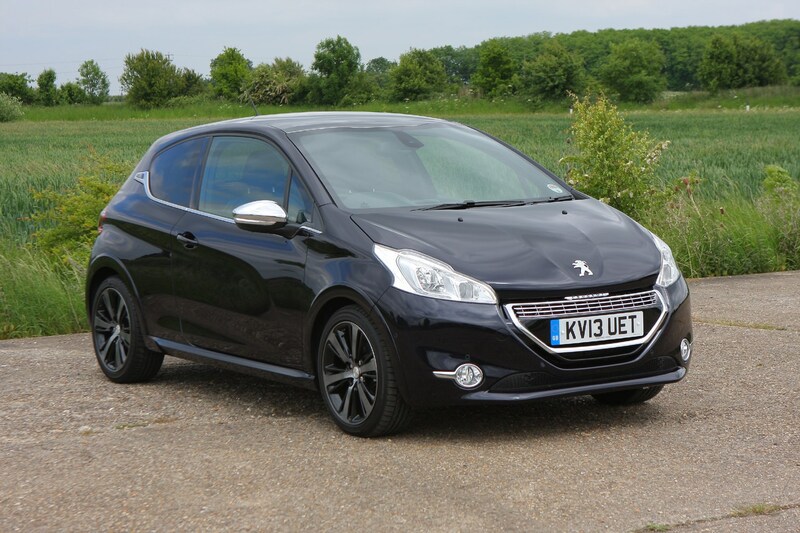 That’s not all – sitting above the standard GTi and the more generously-appointed Prestige is this model: the Peugeot 208 GTi by Peugeot Sport 1.6 THP 208, to give it its full (and somewhat repetitive) moniker. 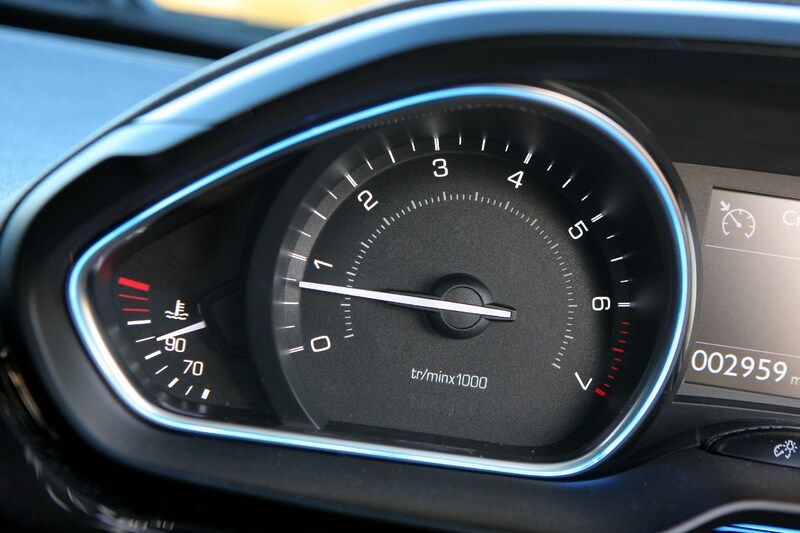 A 300Nm surge of torque’s available from 1,700rpm; high enough for you to hear the turbo whistling but still linear and flexible enough below those revs to prevent it being irksome for town driving. 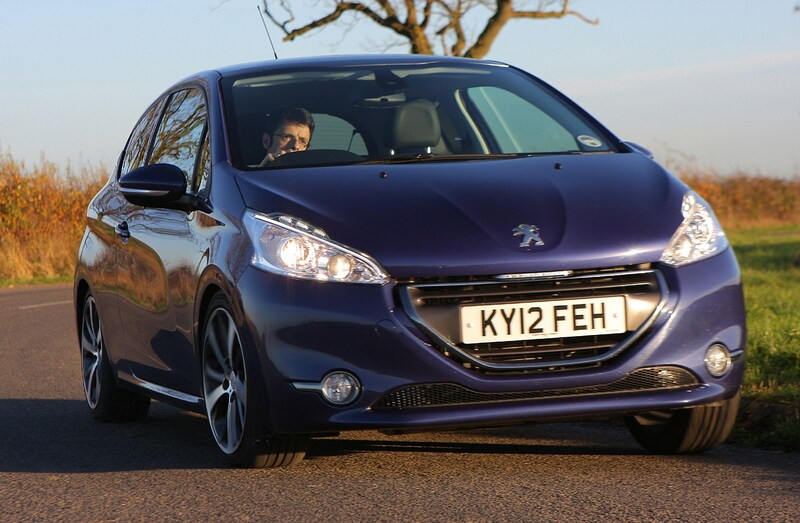 It sprints to 62mph in 6.5 seconds, so on par with the Fiesta ST when fitted with the Mountune pack. 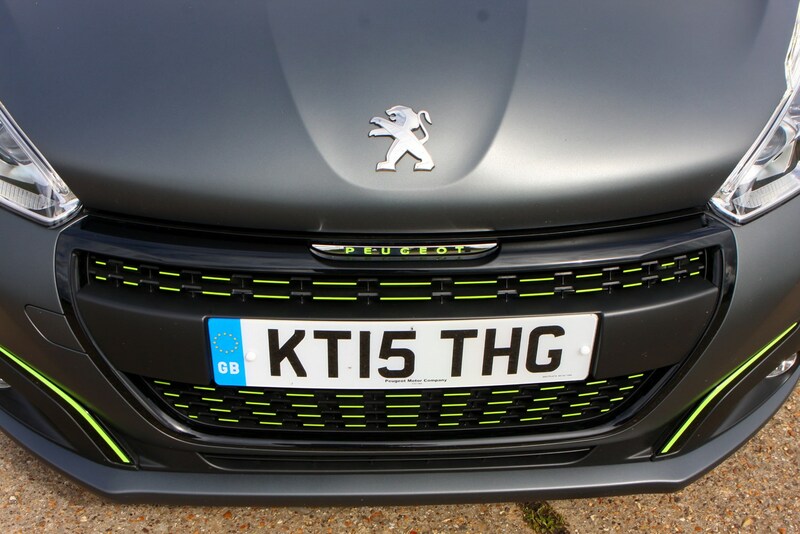 Essentially it’s a full production version of the 30th Anniversary edition, meaning those Peugeot Sport references are no sop for marketing purposes – the marque’s motorsport arm has tweaked the standard GTi set-up meaning not only does it sit 10mm squatter, with its wheels 6mm further apart to benefit handling, there’s also a Torsen differential installed. 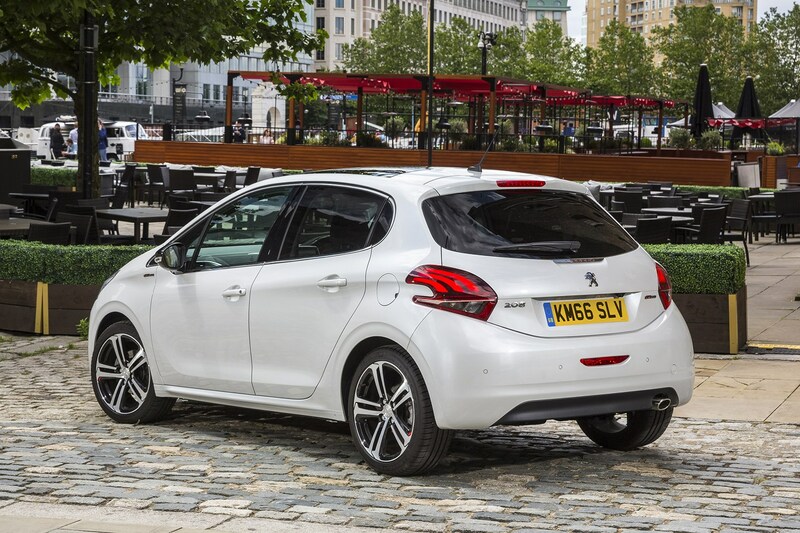 Corner in the 208 GTi by Peugeot Sport and the diff’s impact is obvious as it quells power delivery to the inside wheel, allowing the outside one to pull the car around corners tighter and quicker. 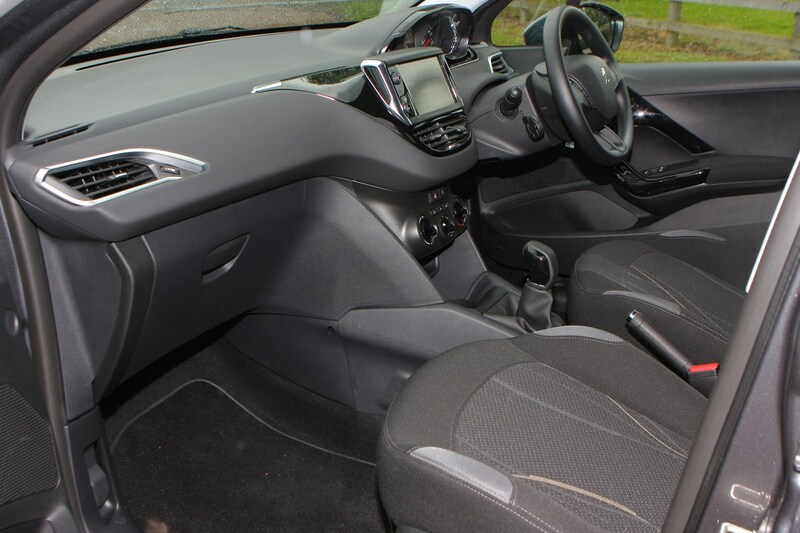 There’s perforated leather with red accents for the tiny steering wheel, making it feel great to hold, although the Fiesta’s ST’s much more communicative about its cornering business. 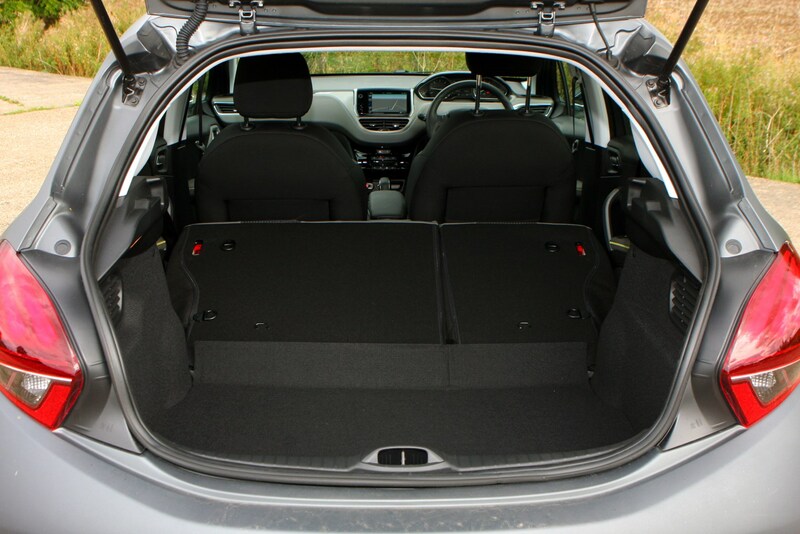 The conduit between the engine and front wheels is a six-speed manual gearbox, which offers a precise action, albeit one with a longer-than-ideal throw – the Fiesta’s ’box feels snappier and more pleasurable. 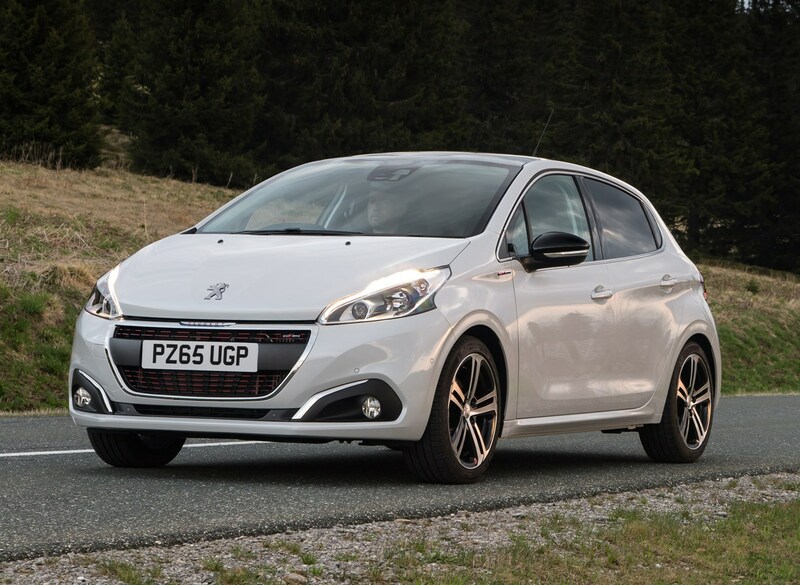 Petite GTis are necessarily firm in the suspension department, but there’s an inherent suppleness to the 208 by Peugeot Sport’s arrangement that makes the Fiesta ST feel unnecessarily rigid by comparison, in spite of those matt black 18-inch alloy rims at each corner. 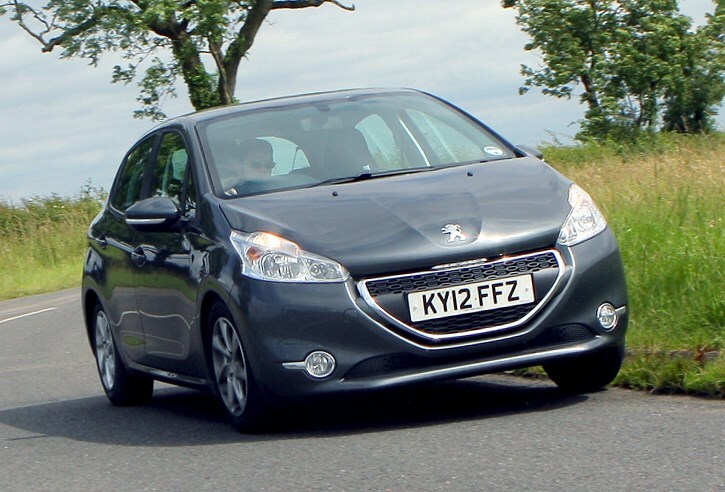 Positively the Peugeot’s relative softness doesn’t impede swift progress along undulating B-roads, quite the opposite in fact as you’re happier to press on knowing your spine’s not going to be jarred as a badge of honour for every road ripple. 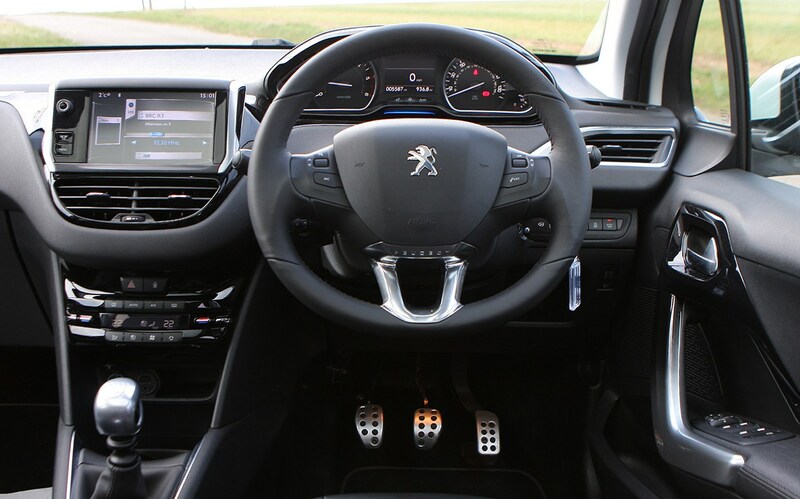 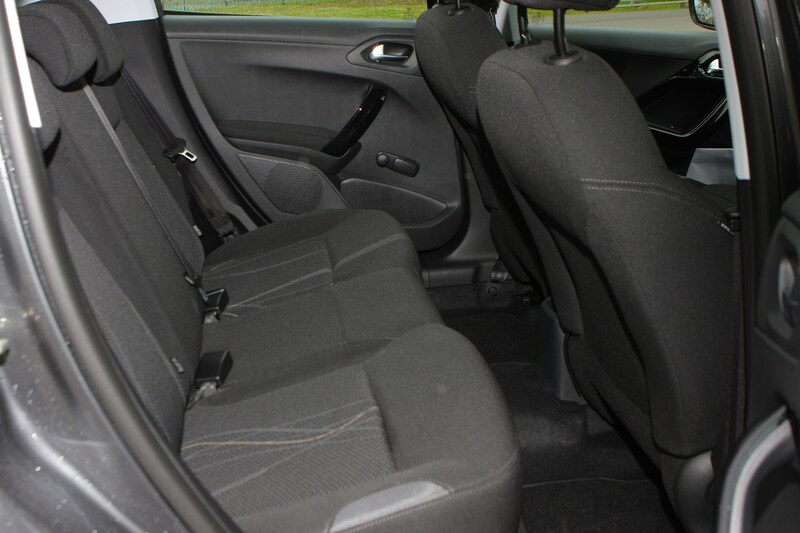 Its front seats also play their part, all winged and bolstered, but an in-house Peugeot Sport design as opposed to the familiar Recaros in the Ford. 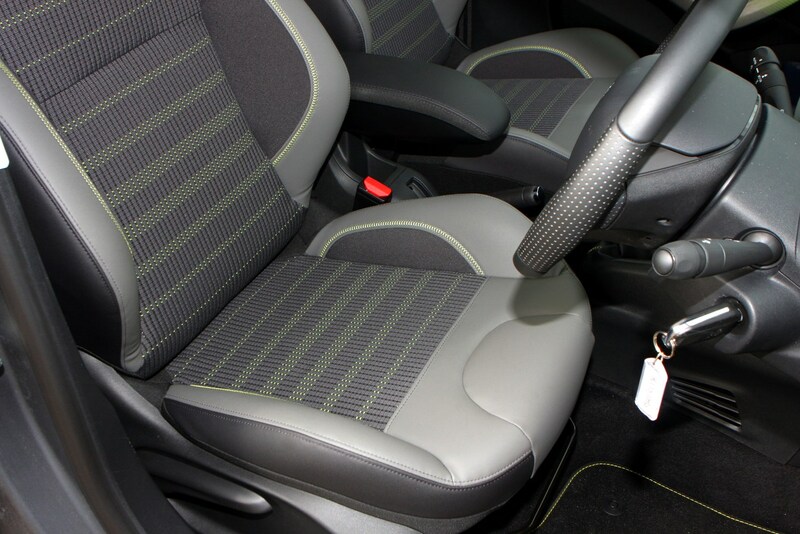 Swathed in Alcantara faux suede you feel planted and supported, yet never constrained. 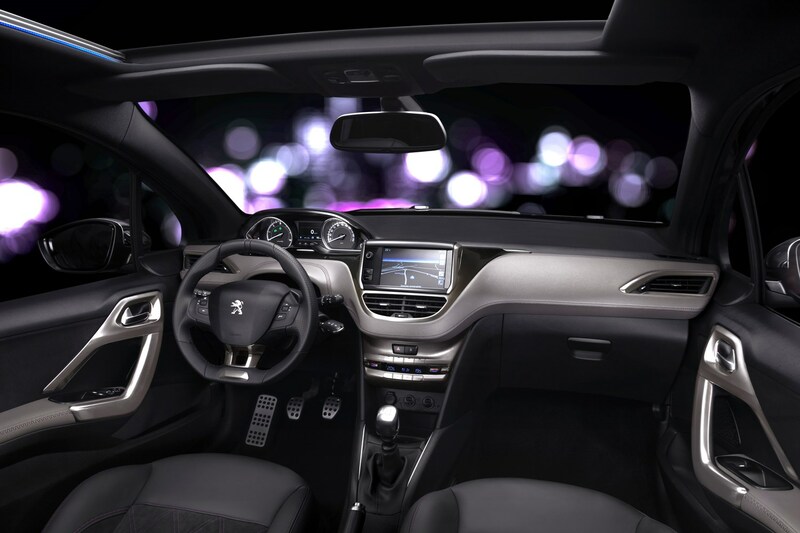 While the Peugeot 208 cabin might not be the last word in high quality materials and exemplary finish, the GTi by Peugeot Sport’s interior feels significantly more special than its Ford rival’s. 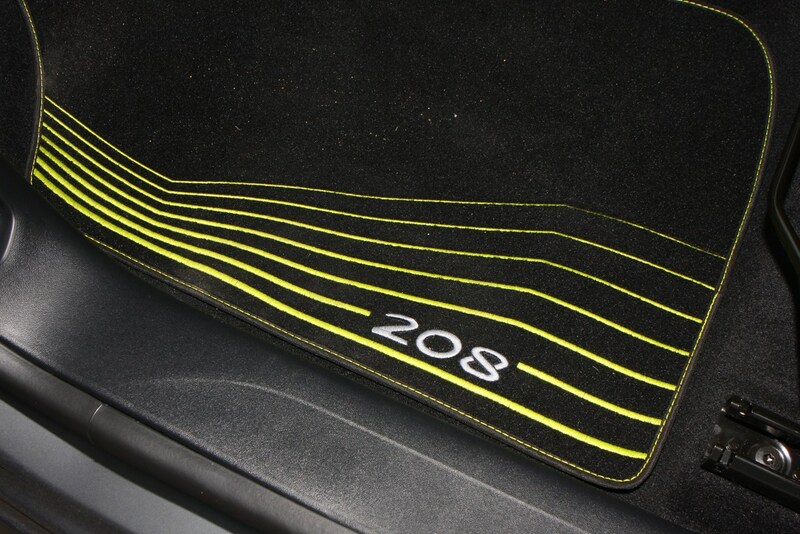 Scarlet stitching seemingly everywhere, red glows around the instruments and numerous other touches make it feel like its makers have gone to more effort to remind you you’re in something a cut above other 208s. 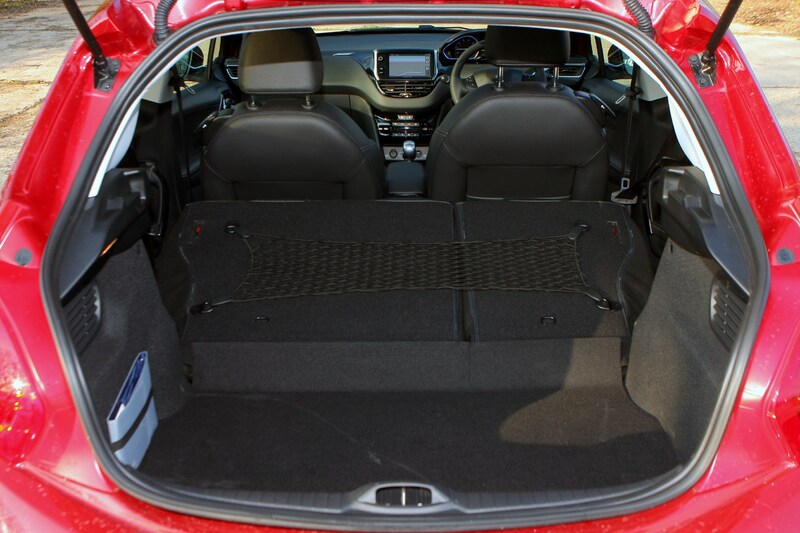 The petrol units available at launch have been joined by a new 1.2-litre turbo, and Feline trim has been superseded by the GTi-aping GT Line specification. 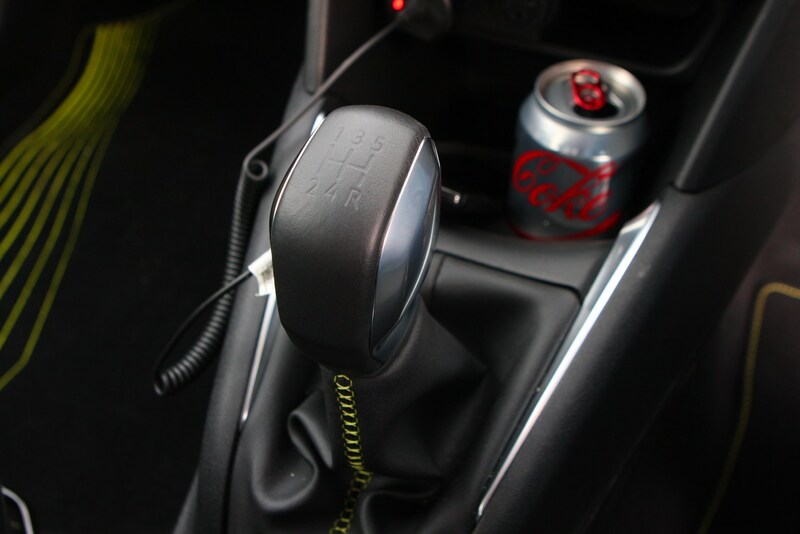 This is the combination here, complete with a fast-shifting six-speed automatic gearbox. 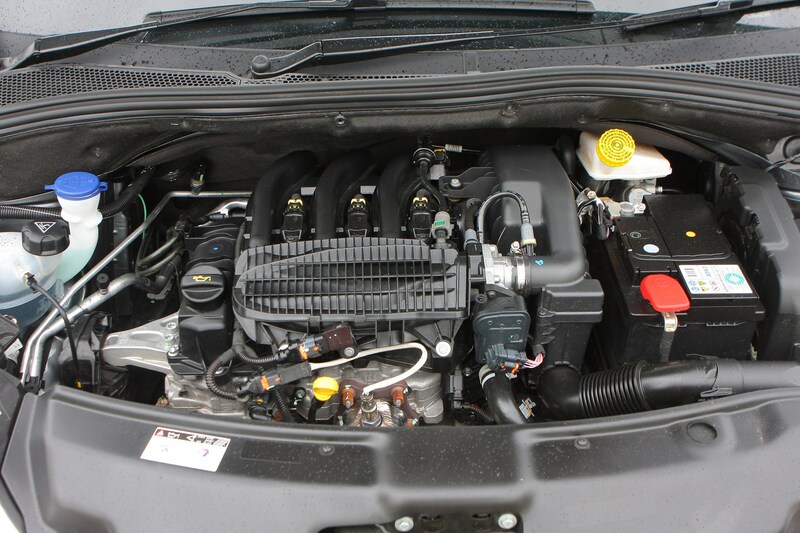 This three-cylinder unit promises 62.8mpg yet it offers 110hp and plenty of torque from low down in the rev range. 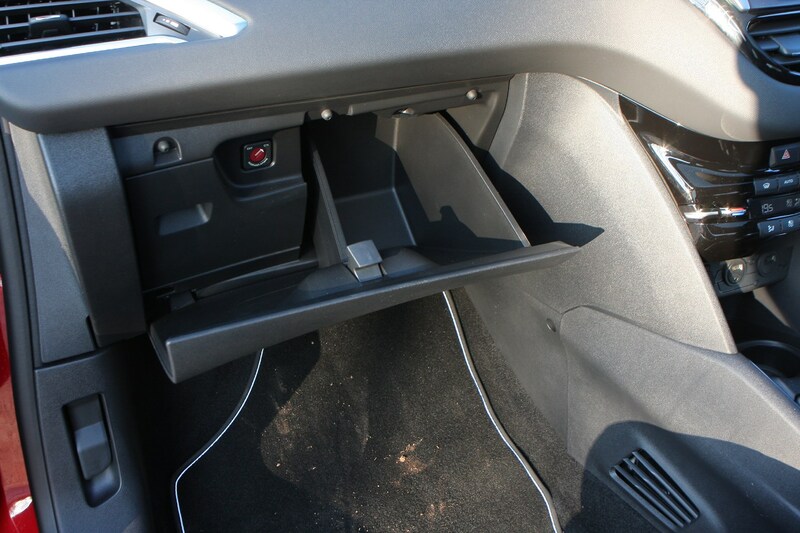 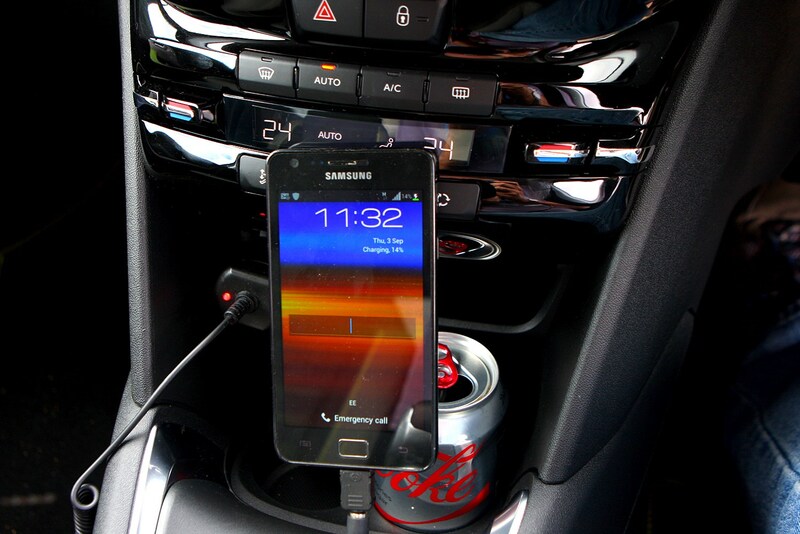 The automatic ‘box changes gears quickly and smoothly, on the whole, so it feels far from slow. 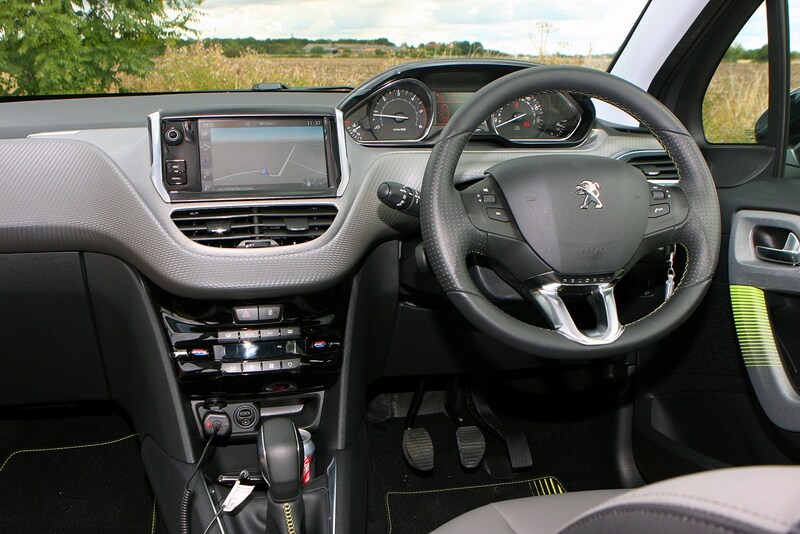 A small steering wheel points towards sharp handling but in truth the 208 is too comfortable to offer go-kart precision, with the springs giving in to a bit of body roll on a windy road. 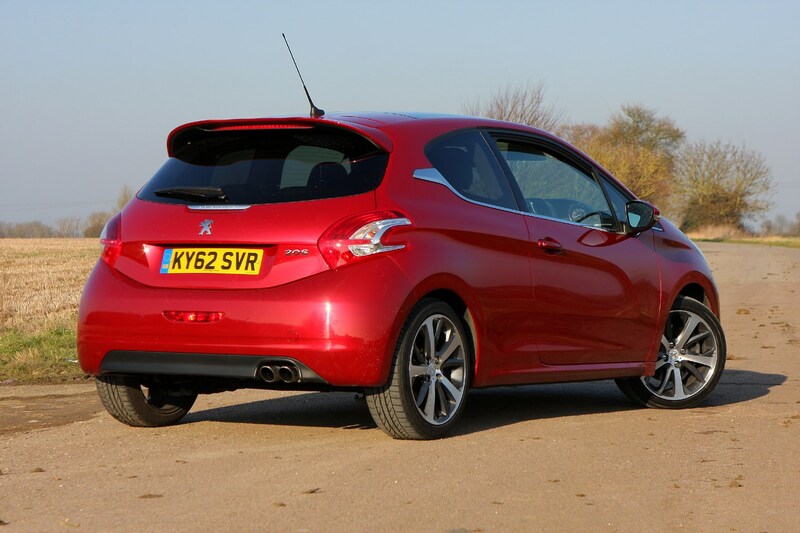 If you like the look of the Peugeot 208 GTi but can’t justify the extra costs of a powerful engine then the GT Line is a fine compromise. 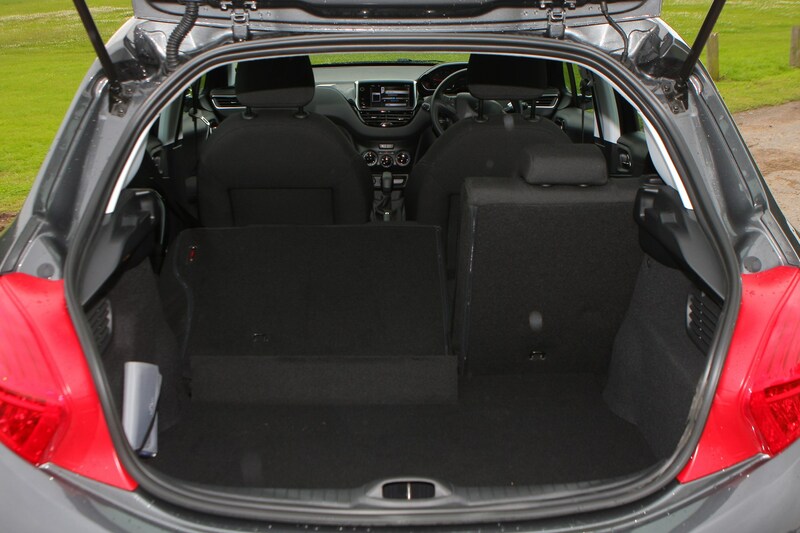 The 1.2-litre petrol engine is certainly poky enough to give you a sensation of performance, particularly when accelerating from low speeds, and the automatic gearbox is a good match. 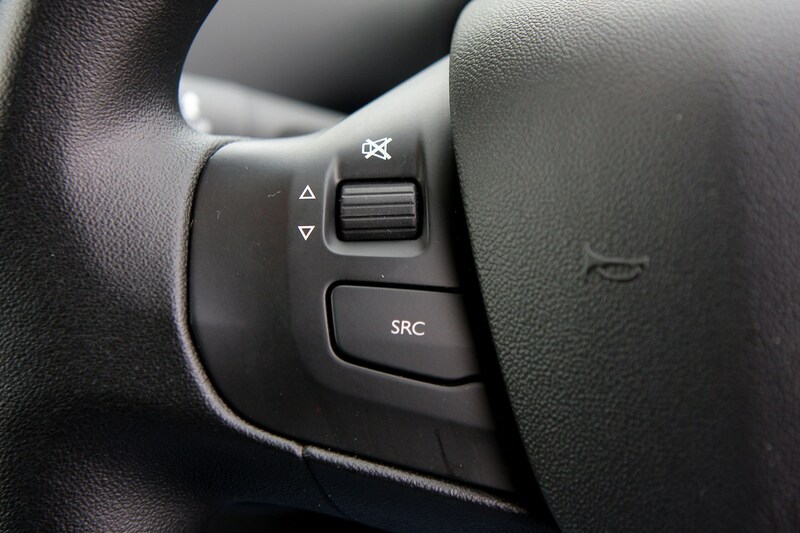 Having driven the manual option too, it’s the auto we’d choose. 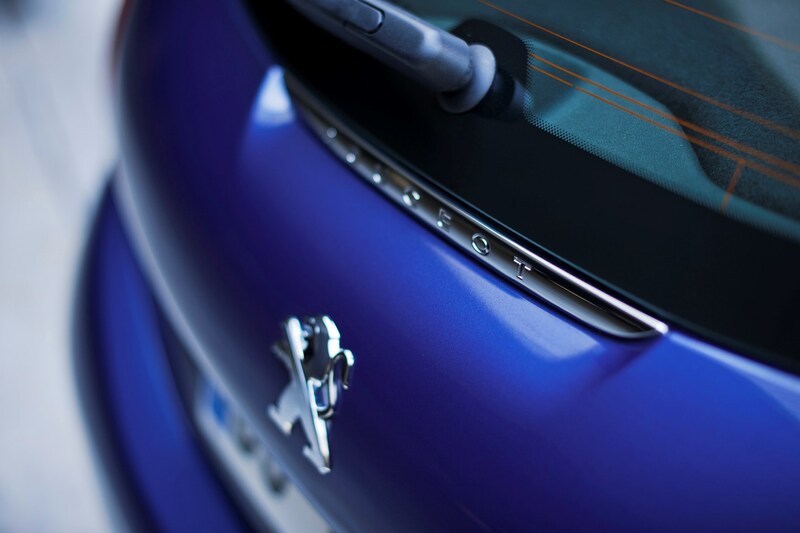 Special editions are frequently launched to inject a little superficial pizzazz into an otherwise ordinary car, tempting buyers into showrooms on the proviso they’re about to buy something produced in limited numbers that’s a cut above the rest. 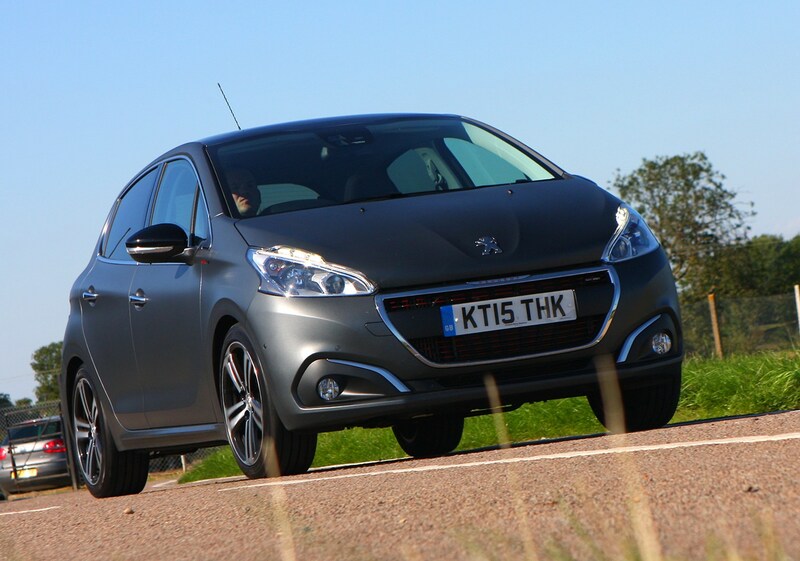 Then there are special editions like this Peugeot 208 GTi 30th – ones that truly are, well, special. 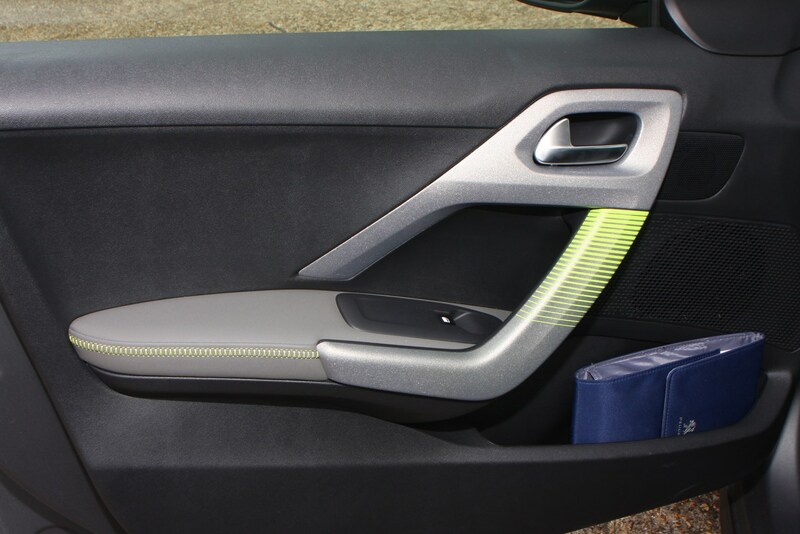 Only a few corners are needed to highlight how impactful the changes bestowed on the 30th anniversary edition have been, confirming this is no Laurence Llewelyn-Bowen showy-style posturing, but a sporty little hatchback with genuine engineering integrity behind it. 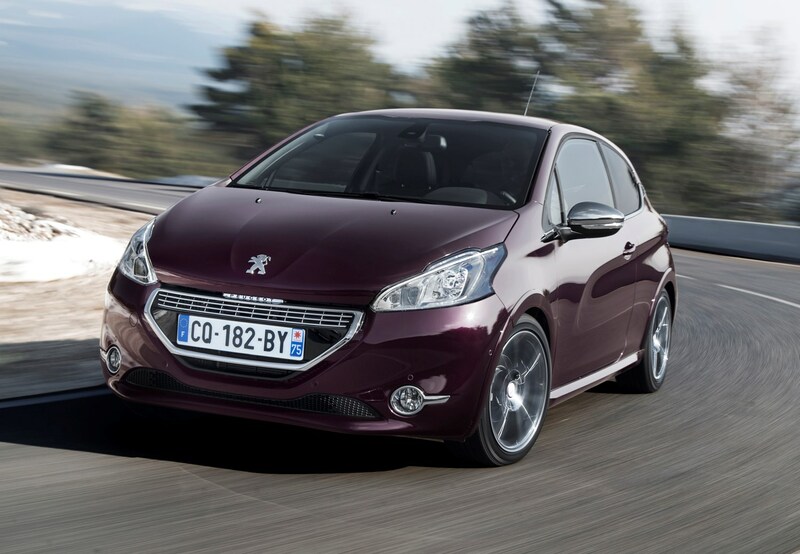 Fettled by a dedicated team at Peugeot Sport, the latest 1.6-litre turbocharged engine is shared with the 308 GT and produces 208hp, up from the regular GTi’s 200hp. 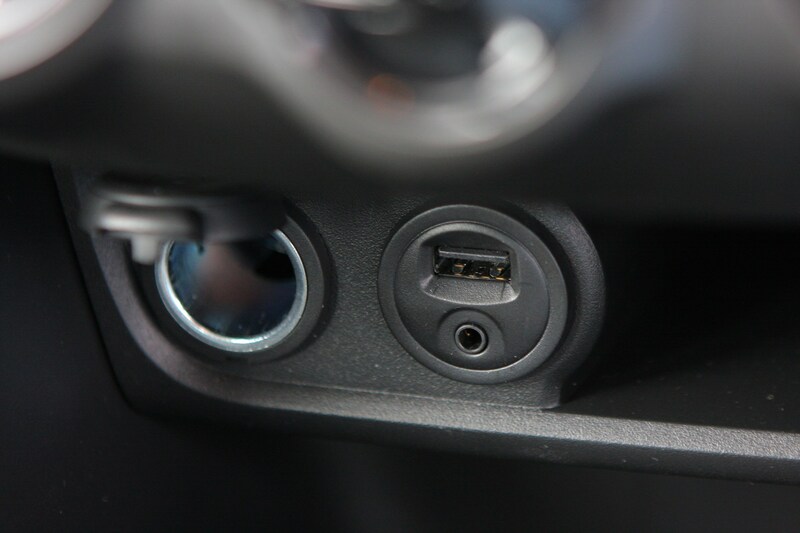 Torque’s boosted to 300Nm, a 25Nm increase, explaining, in part, why the GTi 30th is more responsive, particularly in slower corners. 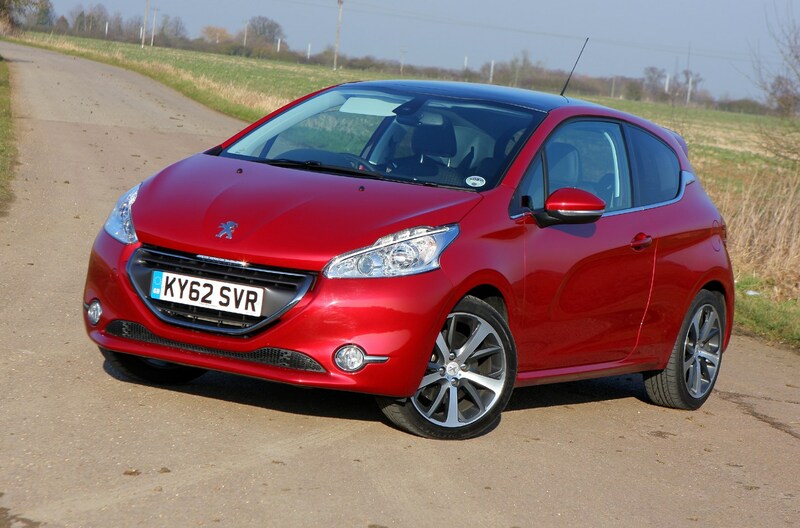 Statistics addicts will be interested to know that with a top speed of 143mph and sprinting from 0-62mph in 6.5 seconds, the 30th edition is 1mph and 0.3 seconds superior, respectively, over the standard 208 GTi. 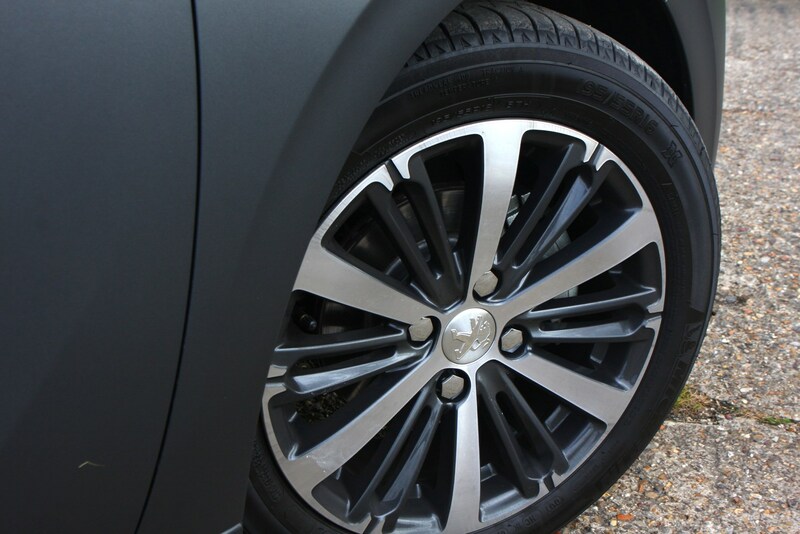 Riding on wider, 18-inch matt black alloy wheels, wrapped in sticky Michelin Pilot Super Sport tyres, the additional grip is significantly enhanced by a Torsen differential, limiting ‘inside’ wheel spin, especially useful in adverse road and weather conditions, promoting more assured and rapid progress around tighter bends. 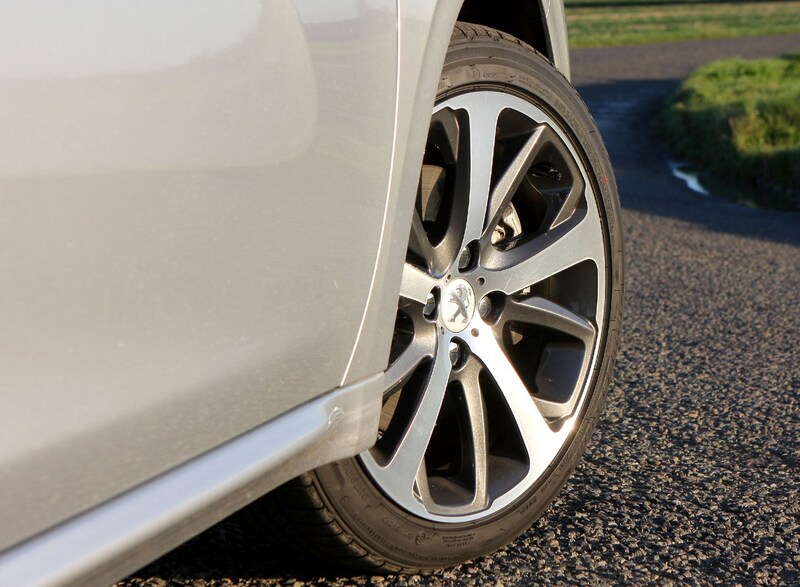 Lowering the suspension by 10mm and widening the distance between the wheels on either side of the car, gives the 208 GTi 30th a squatter, more planted stance, minimising body roll, while the four-piston Brembo front brakes further increase your confidence in the Peugeot’s controllability. 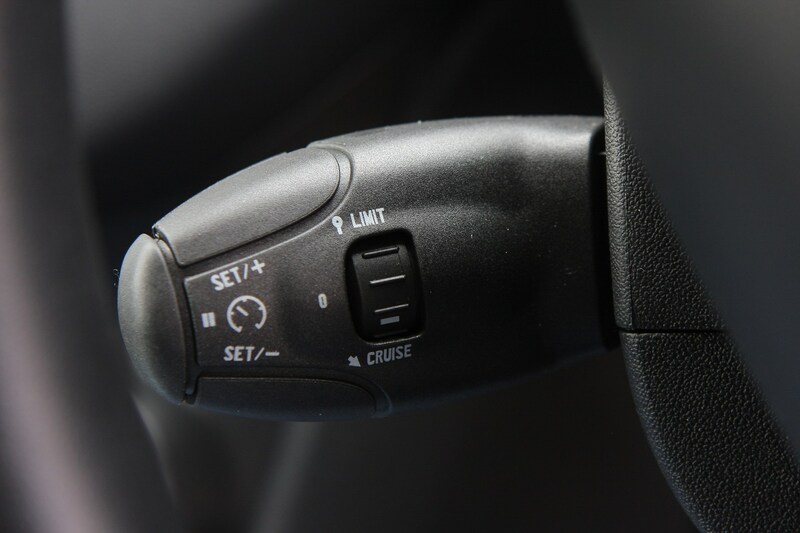 For even more exuberance you can turn off the electronic stability software, but both that and the traction control have been revised to be less intrusive than on the standard GTi; even the automatic harzard warning lights under heavy braking are trickier to trigger in the 30th. 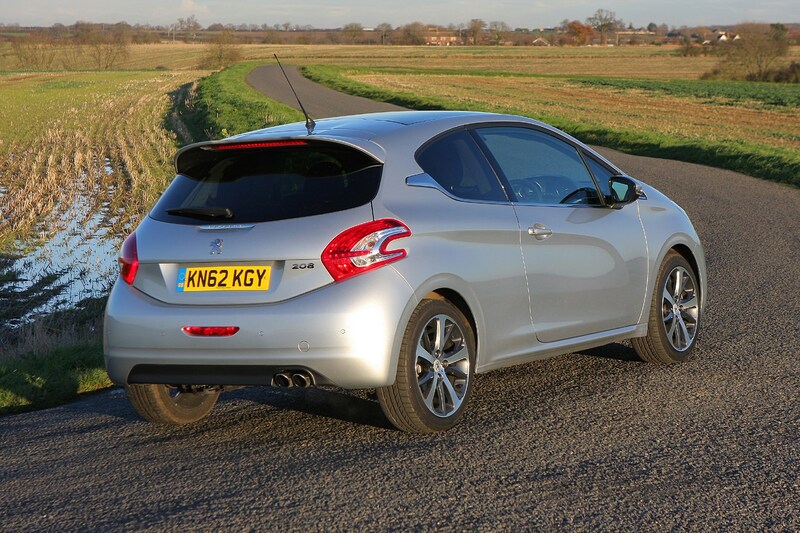 The outcome of this tweakery is that the maturity and relative softness of the 208 GTi has given way to harder-core hilarity. 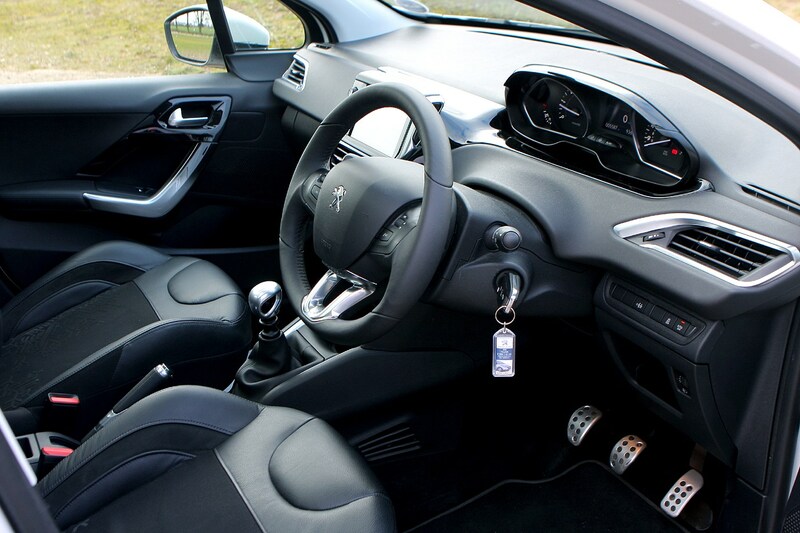 Quickly down-shift through the six manual ratios (the gearbox is from the RCZ R), nudge the brake pedal before squeezing the accelerator as you corner and turn in is sharp, but back off the gas mid-bend and lift-off oversteer kicks immediately in, teasing the back end out of line. 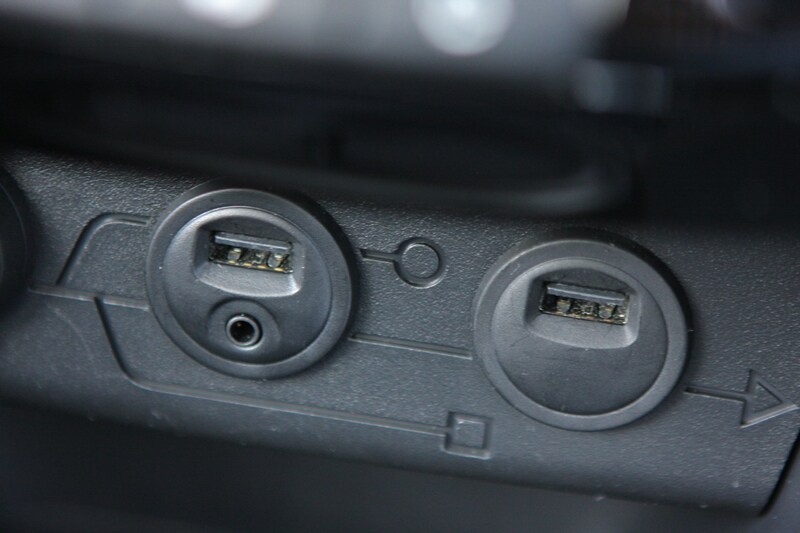 It’s the 1980s all over again. 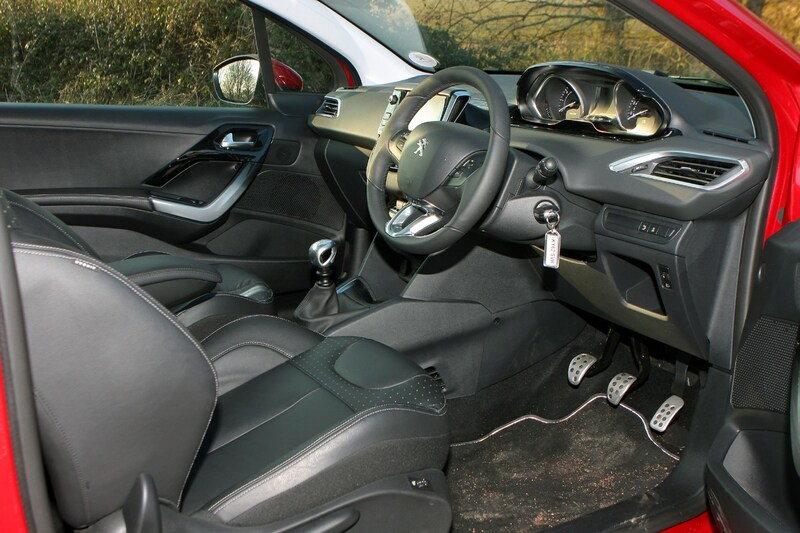 Peugeot’s allocated 100 GTi 30ths for the UK, three-quarters of them in the distinctive coupe franche (straight cut) textured black and gloss red paint scheme, which adds £800 to the special edition’s £21,995 price, already £2,895 more than the standard GTi. 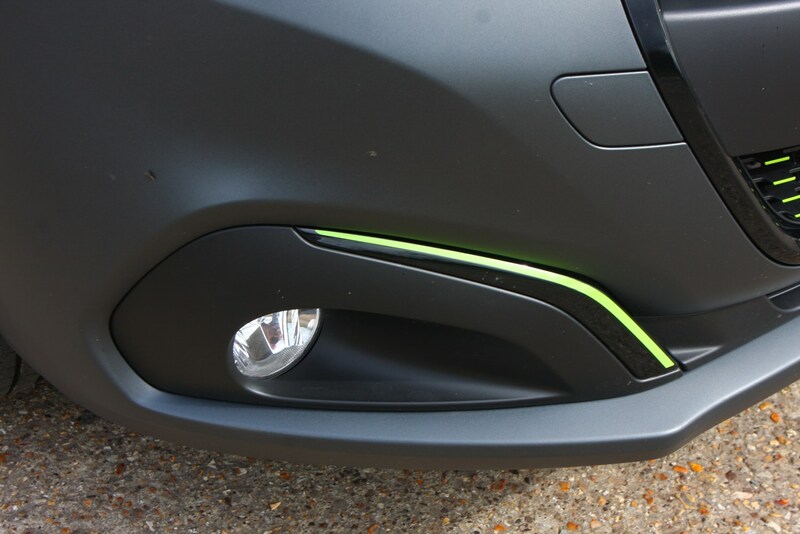 Of the remainder, 20 are Satin White (that’s £150 extra) and five are Rioja Red (no price premium), but whichever colour you choose, all come with black wheel arches and other exterior embellishments. 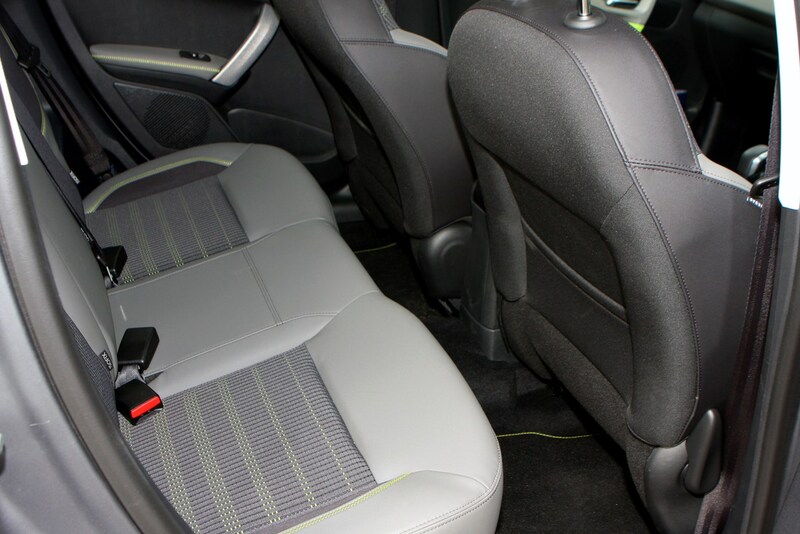 Inside the 30th edition the standard GTi’s red and black theme continues, albeit in more subdued form, with supportive Peugeot Sport seats featuring broad side bolsters and trimmed in Alcantara faux suede. 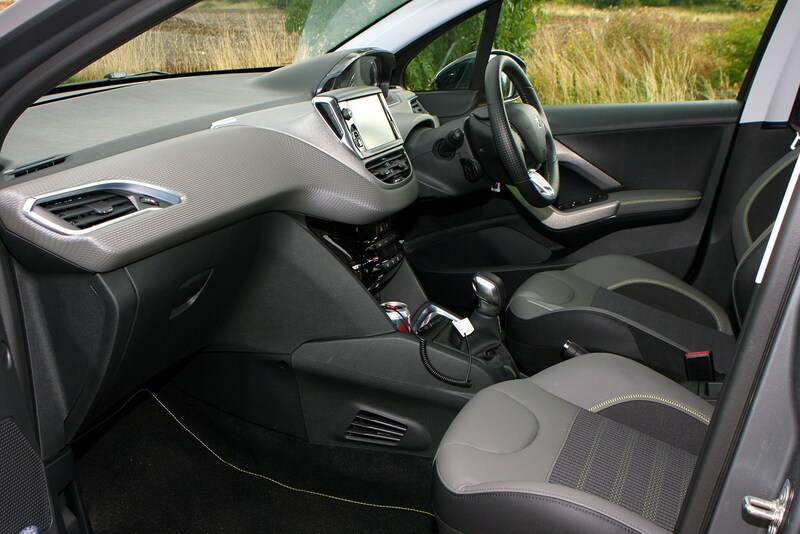 Sat-nav and a numbered plaque complete the interior changes. 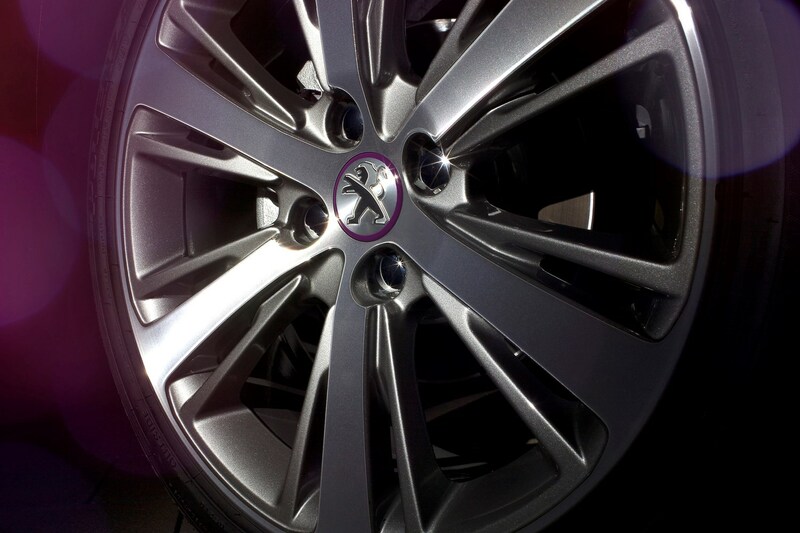 The XY is ‘designed to be the epitome of urban chic’. 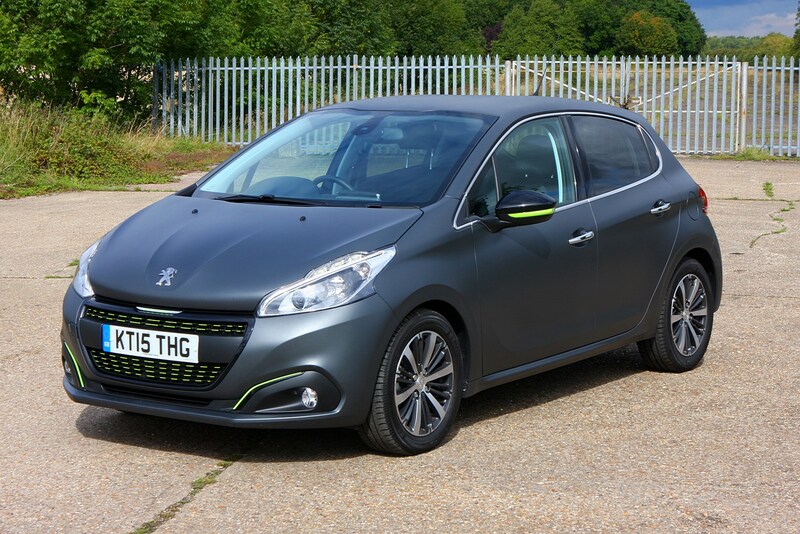 Now, we’re all aware of how incongruous that statement is, but the idea is that this is a stylish answer to those wanting a high-spec 208 that doesn’t look like it belongs to a boy racer. 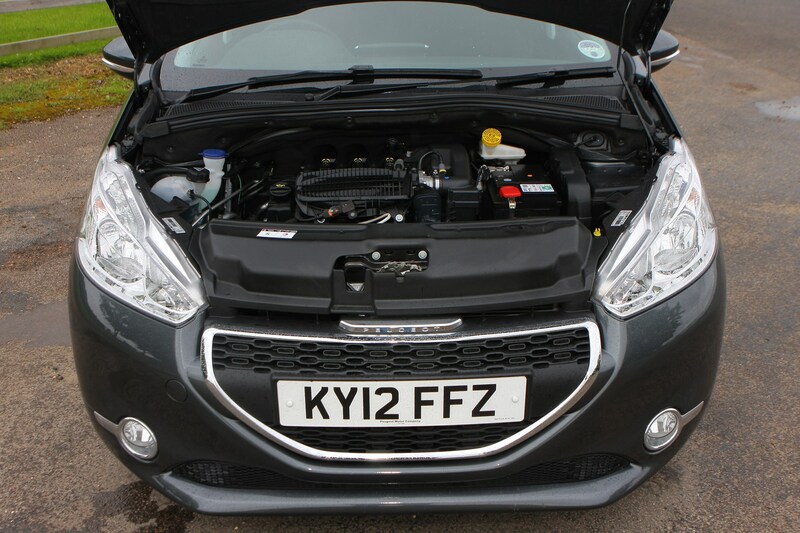 Our example came fitted with a 1.6-litre diesel engine which offers an incredibly high claimed average fuel economy of 74.3mpg. 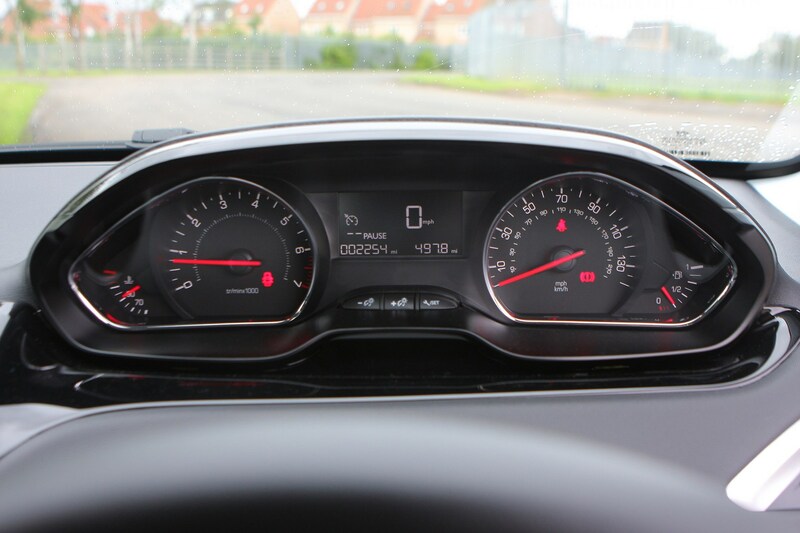 Of course, you won’t get that much in real life, but we were seeing well over 50mpg when driving it. 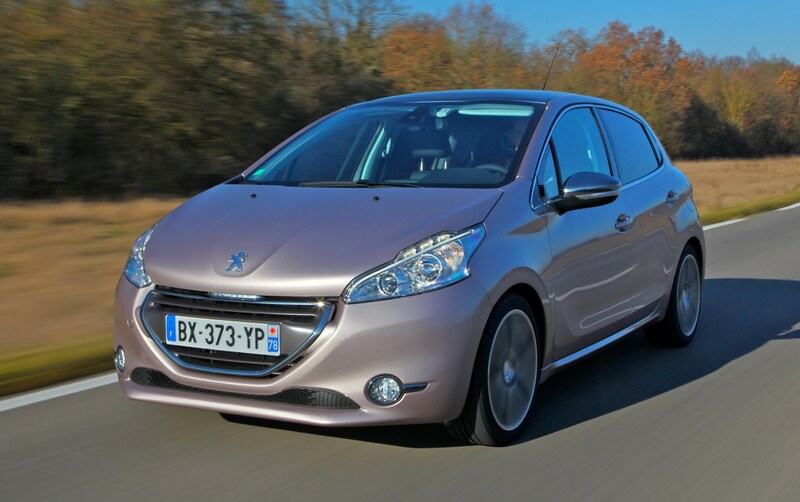 Such low running costs do come at a price though – you’re not going to win any races with the 208 XY. 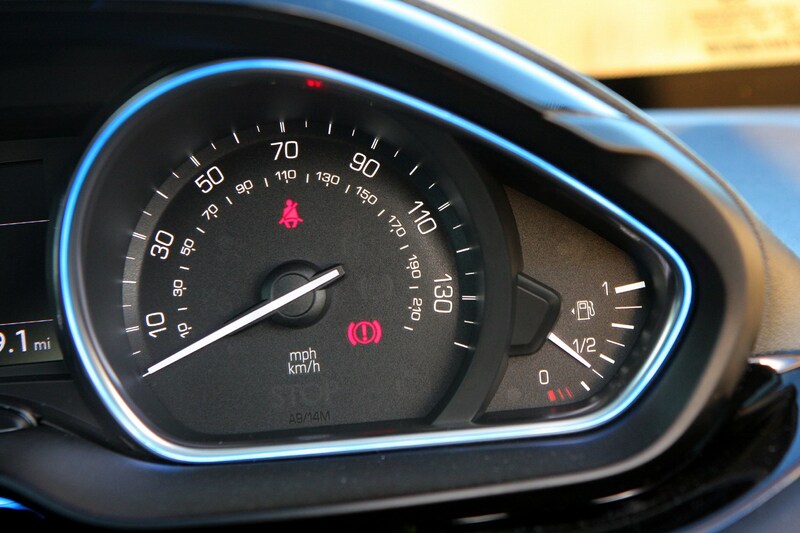 It’ll hit 62mph in 10.8 seconds and go on to a top speed of 118mph, but the engine feels very latent and doesn’t pick up very well if you’re caught in the wrong gear. 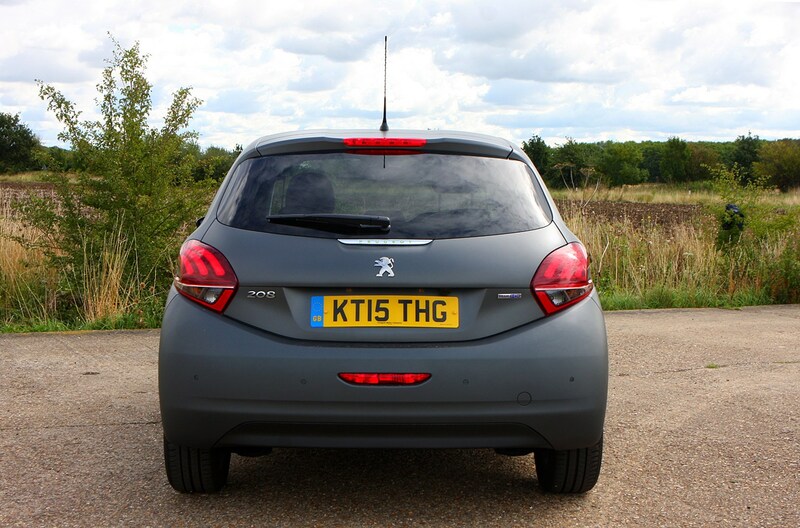 Overall, the 208 XY is a compelling proposition for those looking for a kit-laden supermini which is rewarding to drive. 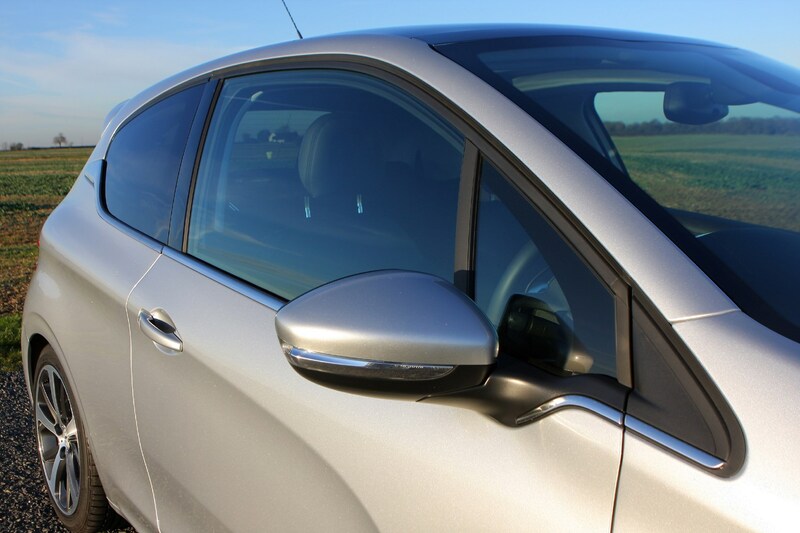 The only potential fly in the ointment comes from Ford and its Fiesta Titanium X – it costs around £1,000 less to buy than the Peugeot. 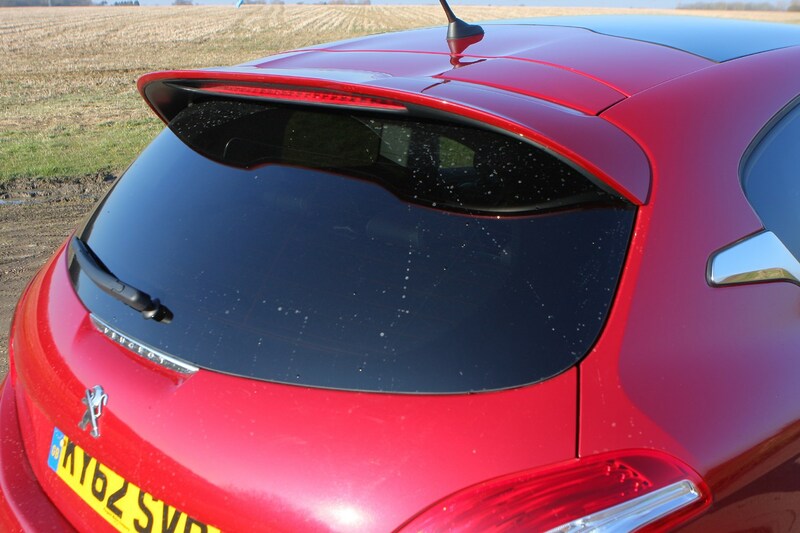 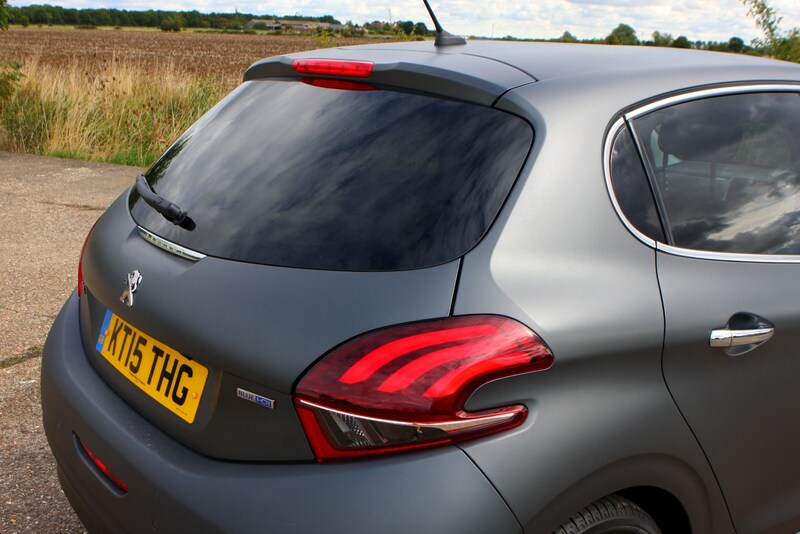 The last few Peugeots to wear those three famous GTi letters on their boot lid have fallen short of enthusiasts’ expectations, but the French company is adamant that with the performance version of the 208 it’s rediscovered its mojo. 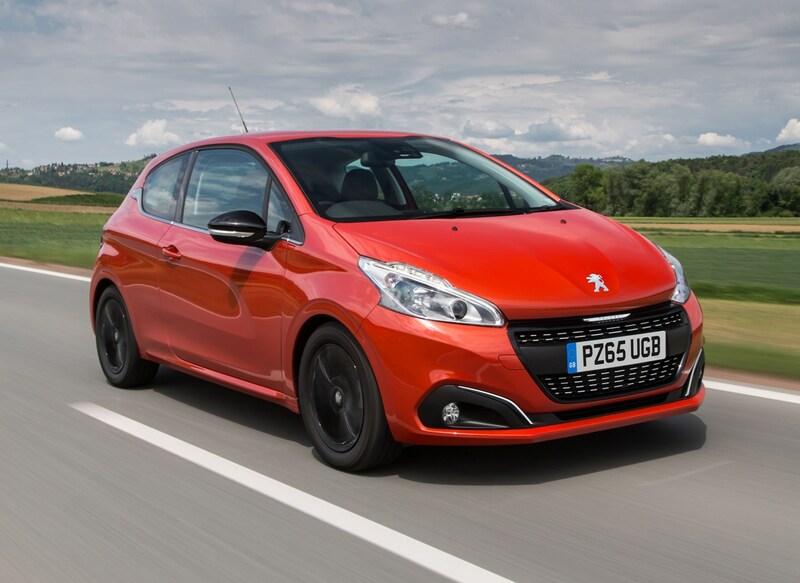 To get the job done, the 208 GTi has been given a powerful engine, firmer suspension and a wider track (the gap between the middle of the tyres across the axle) by 10mm at the front and 20mm at the rear along with an 8mm lower ride height to make the car more agile. 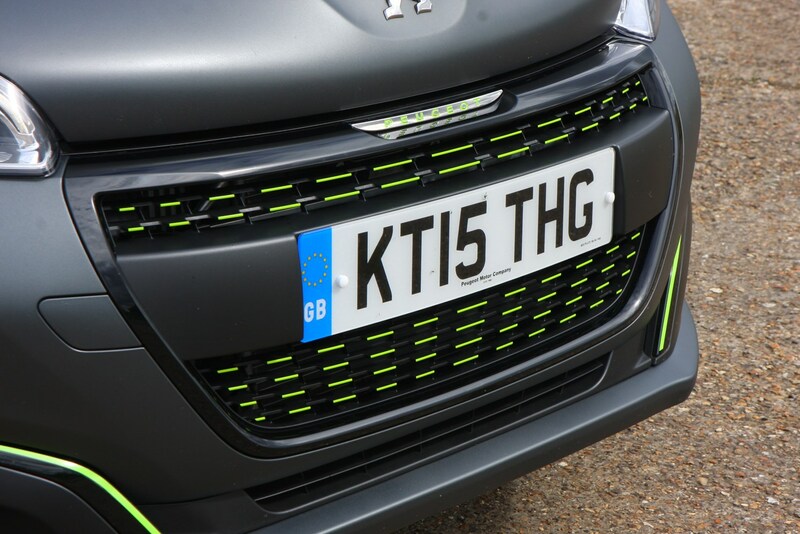 On the outside, the GTi is set apart from the rest of the 208 range by a 'chequered flag' grille, boot spoiler, chunkier side sills and a subtle set of wheelarch extensions housing a set of 17-inch satin-grey alloy wheels. 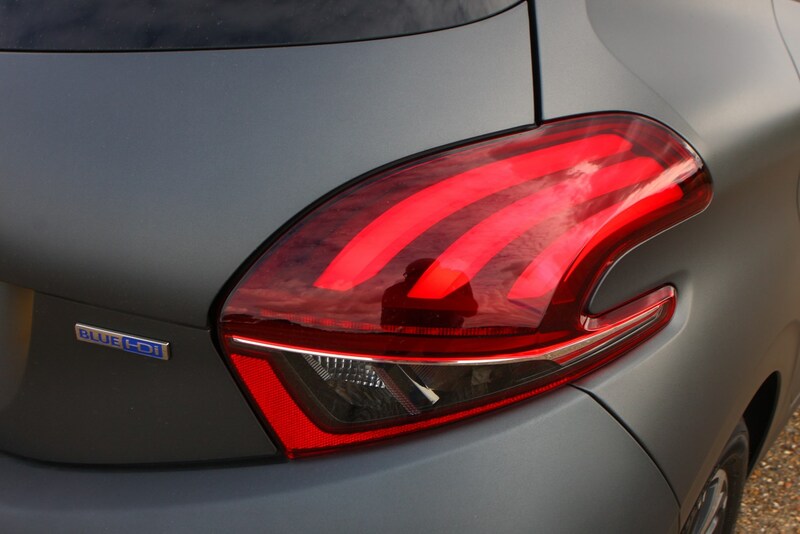 It also wears a couple of nods to the much loved 205 GTI of the 1980s, with red ‘GTi’ emblems on its rear pillars and a red pinstripe along its chin. 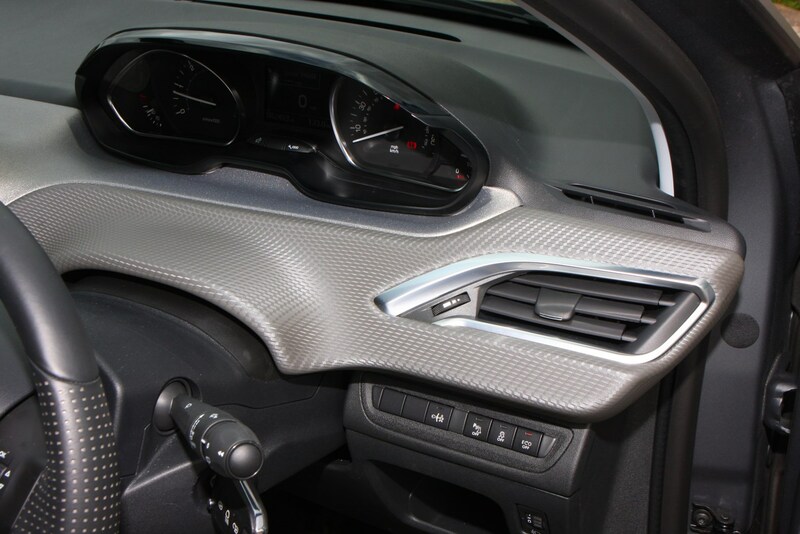 That scarlet theme continues inside, with red stitching and a graduated red finish for the central vent surrounds, gearknob and door pulls to remind you you’re driving a GTi. 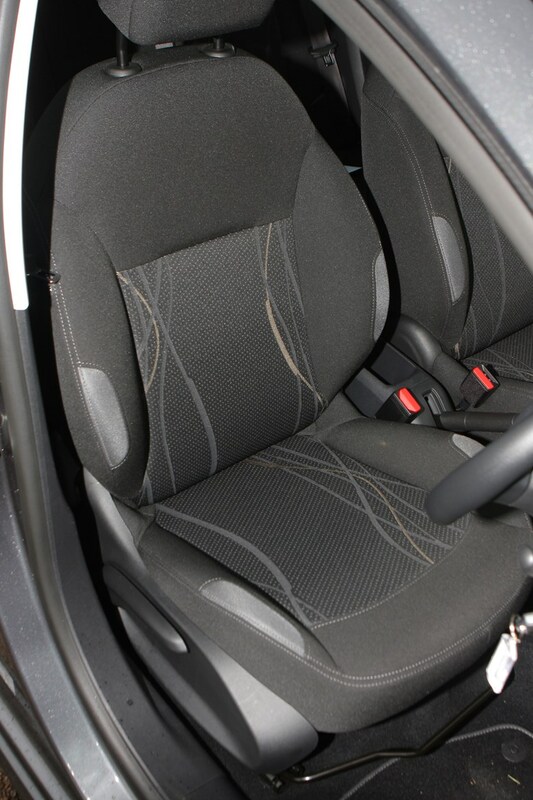 Even the seatbelts have a red pinstripe. 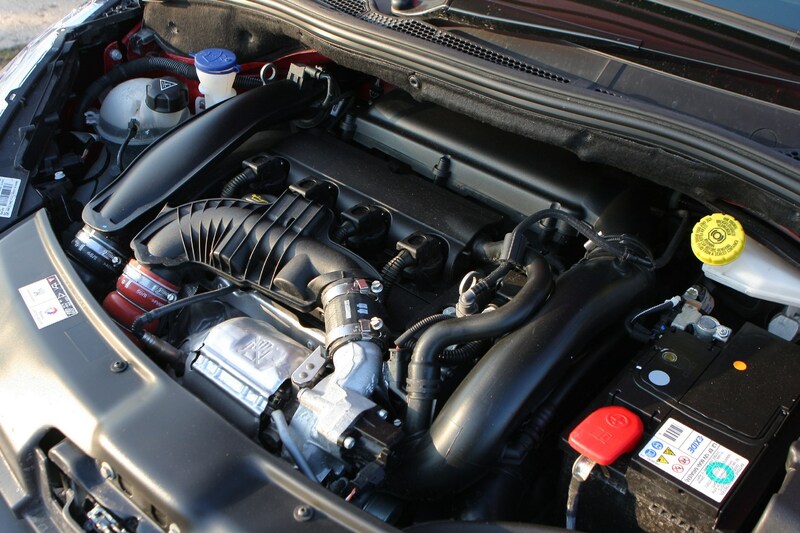 Under the bonnet is the same 1.6-litre turbocharged petrol engine you’ll also find in the MINI Cooper S Hatch and the Peugeot RCZ sports coupe. 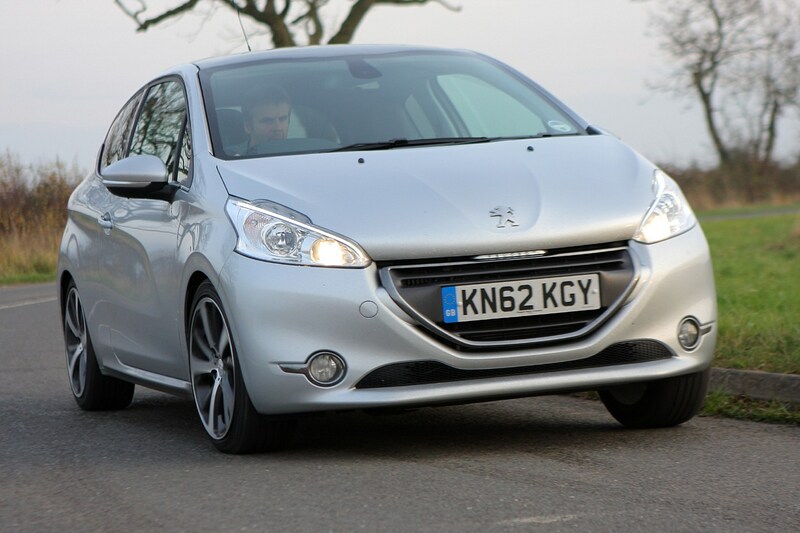 Pushing out 200hp and 275 Nm of torque, it can pull the 208 from 0-62mph in 6.8 seconds and on to a top speed of 143mph. 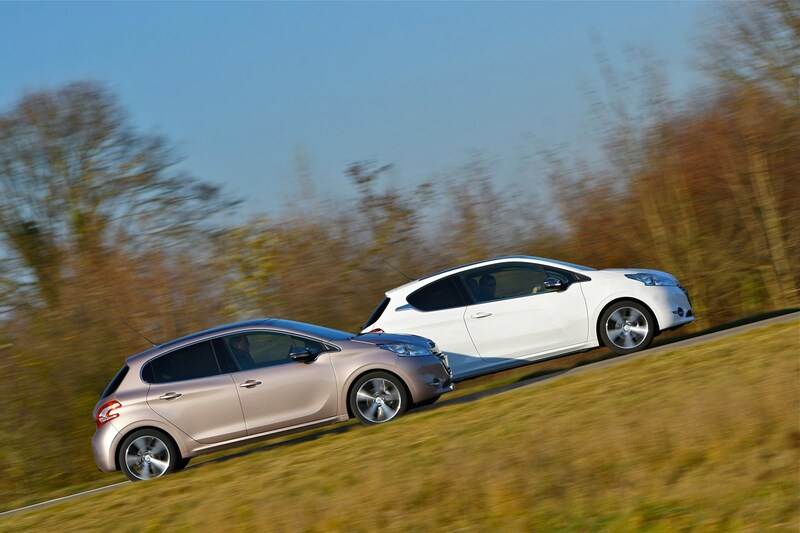 These figures compare well with the GTi’s principal rivals, the Ford Fiesta ST (0-62mph in 6.9 seconds, also a 1.6-litre turbo with around 200bhp on overboost) and the Clio Renaultsport (0-62 in 6.7 seconds, also – you guessed it – a 1.6-litre turbo with around 200bhp). 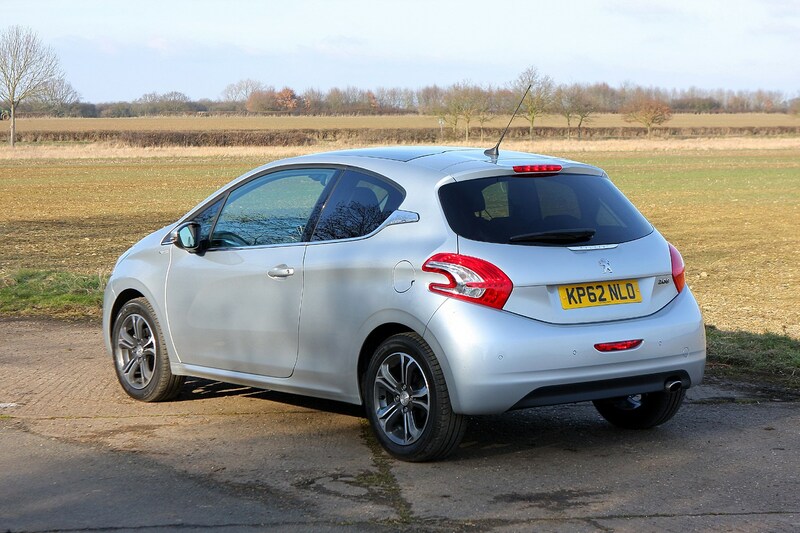 The proof of the pudding is in the driving, however, and almost immediately it’s clear that the 208 is designed to be more of a comfortable all-rounder than an out-and-out performance car. 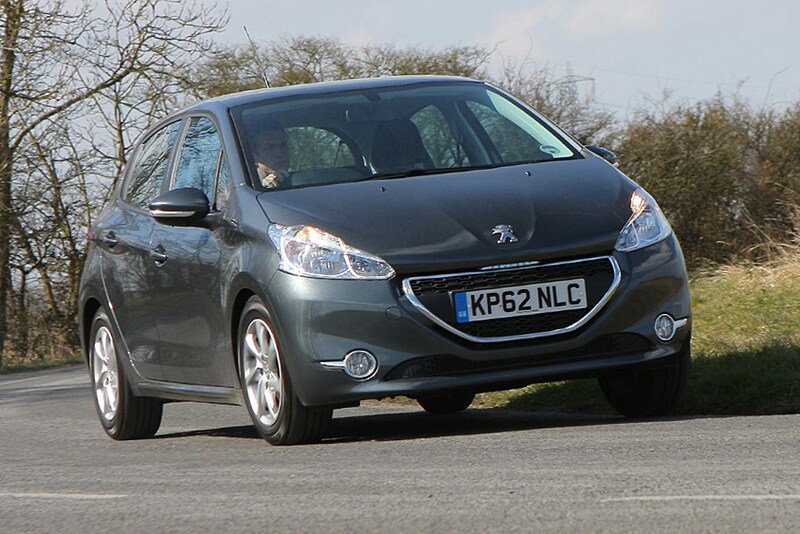 Although the suspension has been made firmer than the standard 208, it’s still a very supple and pliant riding car. 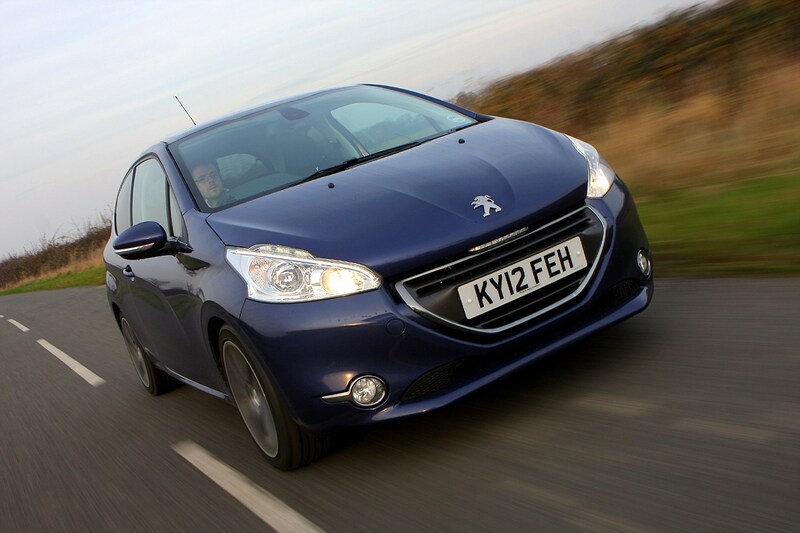 Show it a rippled B-road and the Peugeot ensures occupants barely notice. 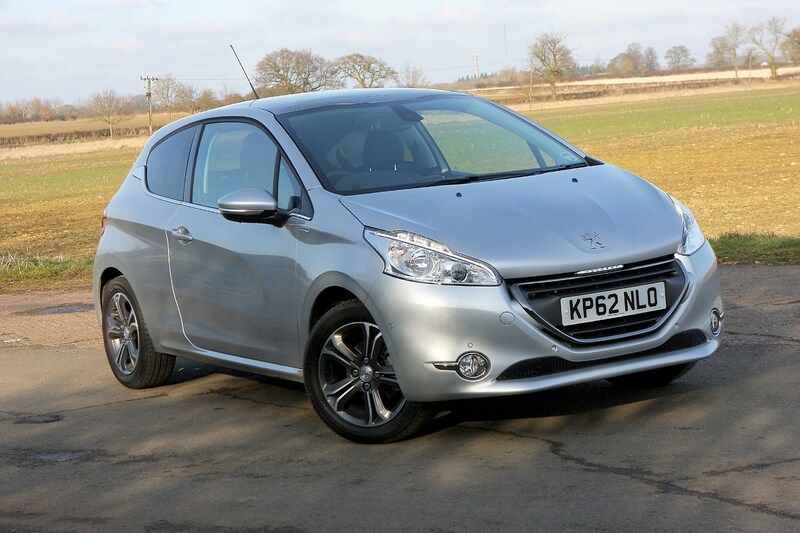 Most enthusiasts, however, would happily trade a little ride comfort for a more involving drive and the 208 never really feels anything other than remote. 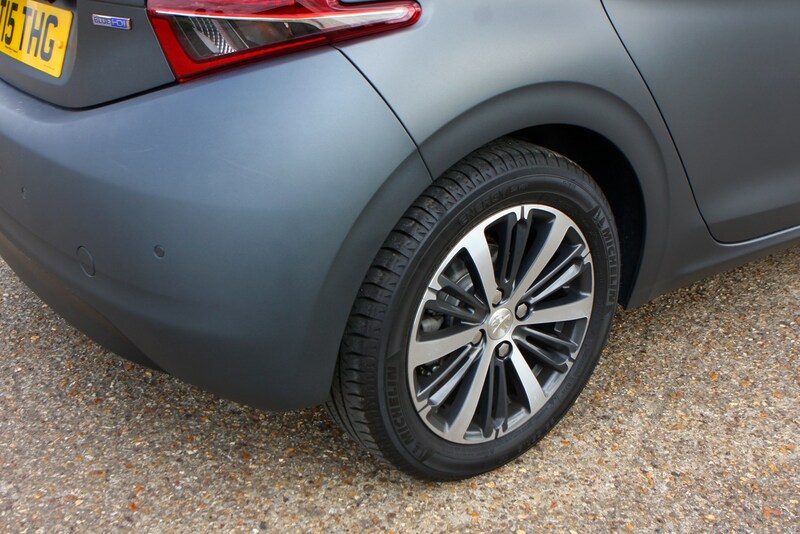 The steering is light and could offer more information about what the front tyres are up to, although there’s no doubt there’s tons of grip on offer and the 208 can corner extremely hard if you want it to. 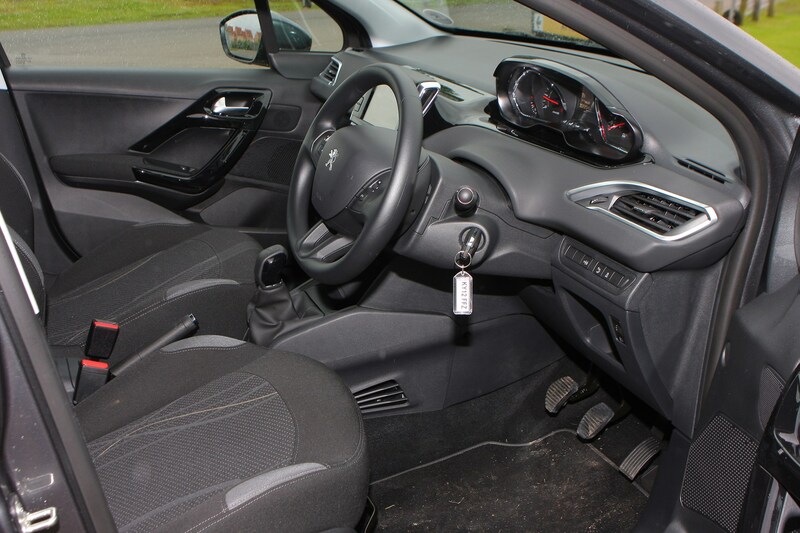 The six-speed manual gearbox’s ratios feel well-chosen, although frustratingly it has the same slightly slack feel to use as other manual models in the 208 range. 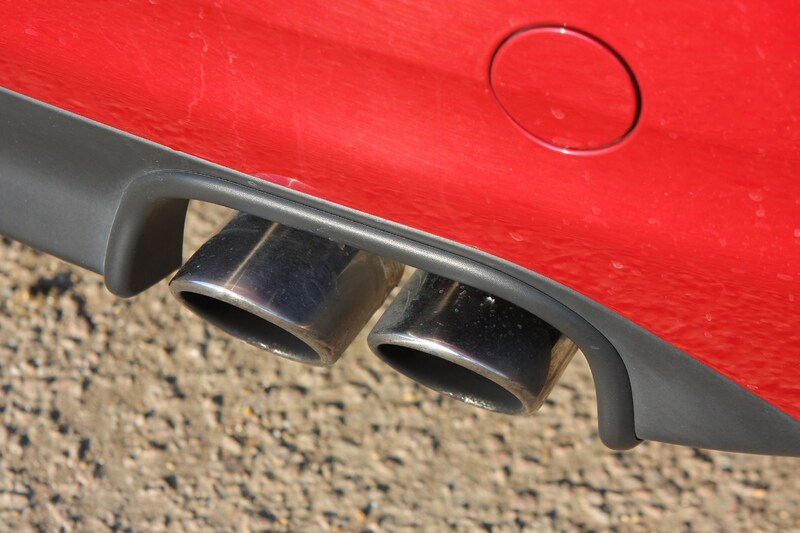 A sportier exhaust note would be nice, too, as the GTi doesn’t sound all that inspiring. 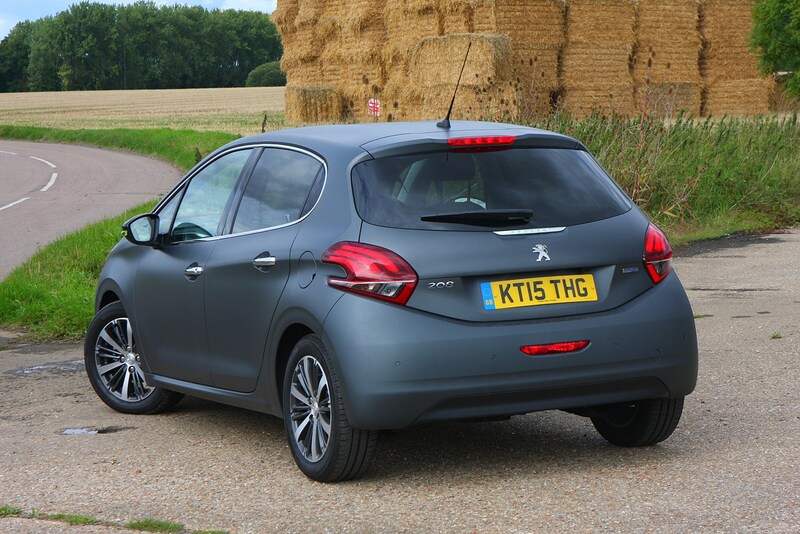 It’s certainly quick, though; the 208 can blast along at a surprising rate, and the powerful brakes get it stopped quickly too, although their initial response is rather sharp and abrupt. 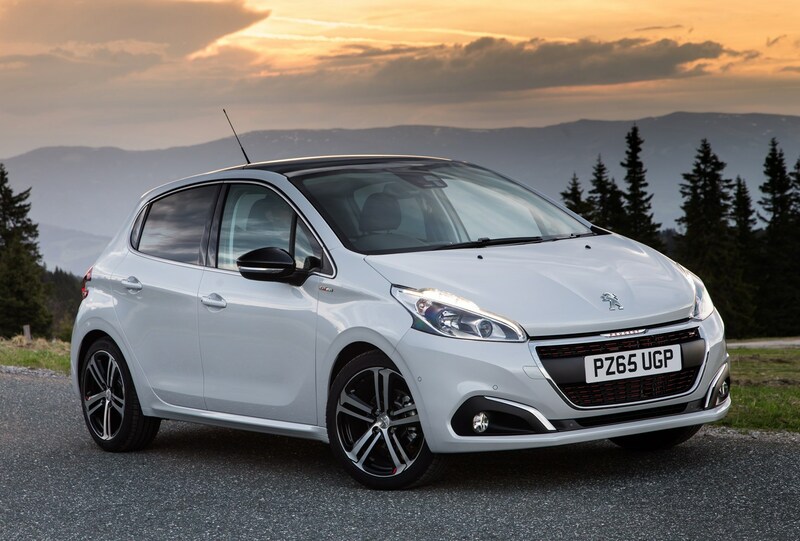 Pity it doesn't feel far enough removed from the rest of the 208 range to feel truly special – the way a hot hatch should. 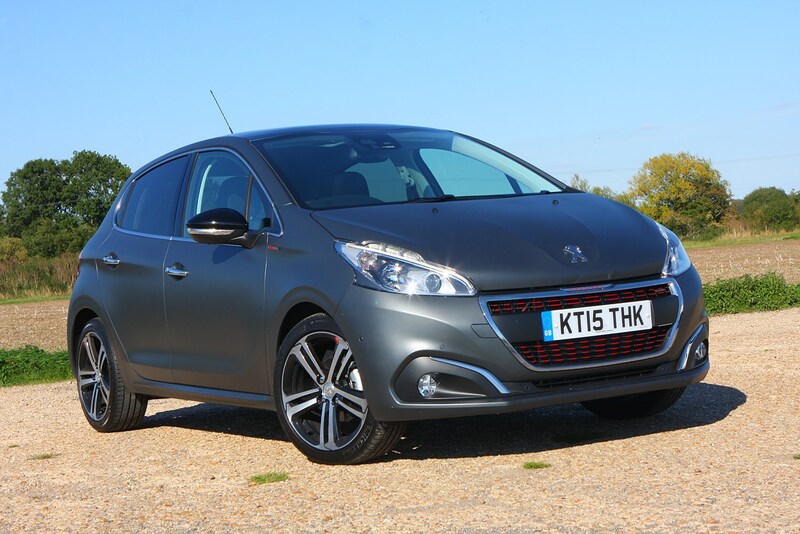 A mixture of hot hatch and pampering luxury, the 208 XY takes much of its inspiration and plenty of parts from the new 208 GTi, in a bid to drag the brand further upmarket. 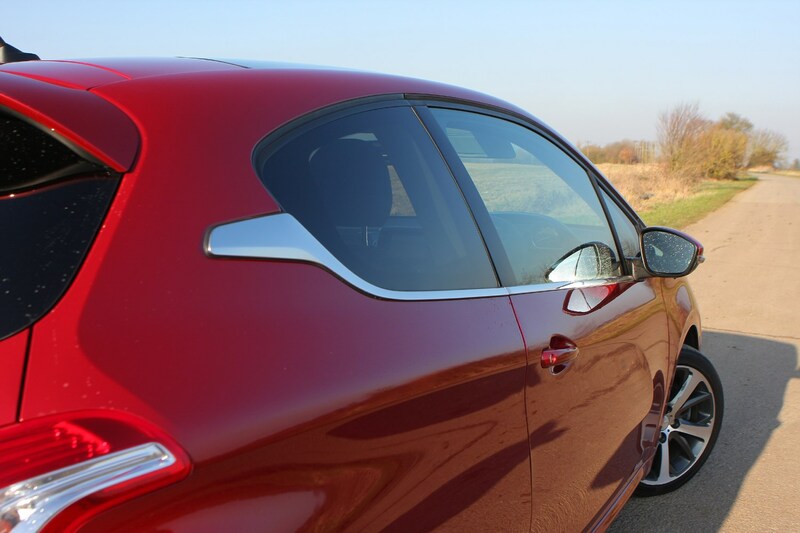 Indeed, this three-door-only model shares much of its design language with the firm’s range-topper, meaning it benefits from the GTi’s subtle bodykit and, in the case of the 1.6THP tested here, rear wing too. 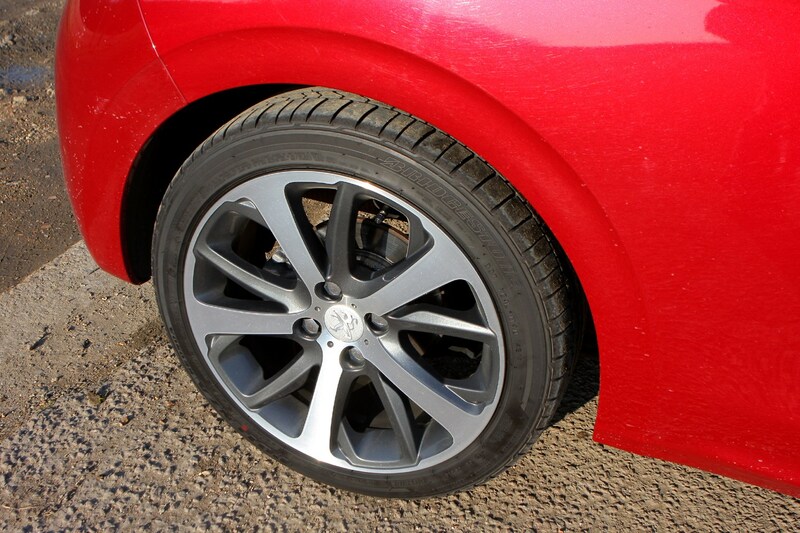 Underneath the XY is the same basic suspension set up as the GTi, including the wider track, albeit with springs and dampers focused on comfort rather than outright roadholding. 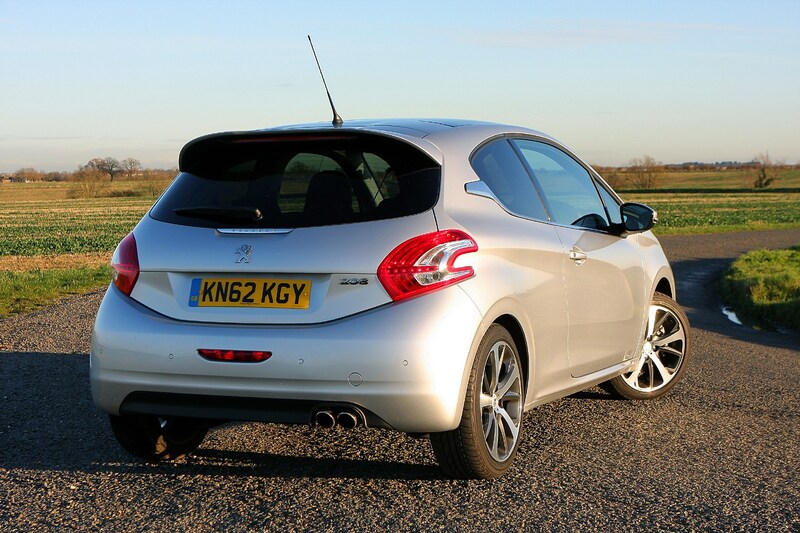 The result is a car that, in 1.6 THP form at least, could be argued to be almost as talented as its supposedly more capable hot-hatch brother. 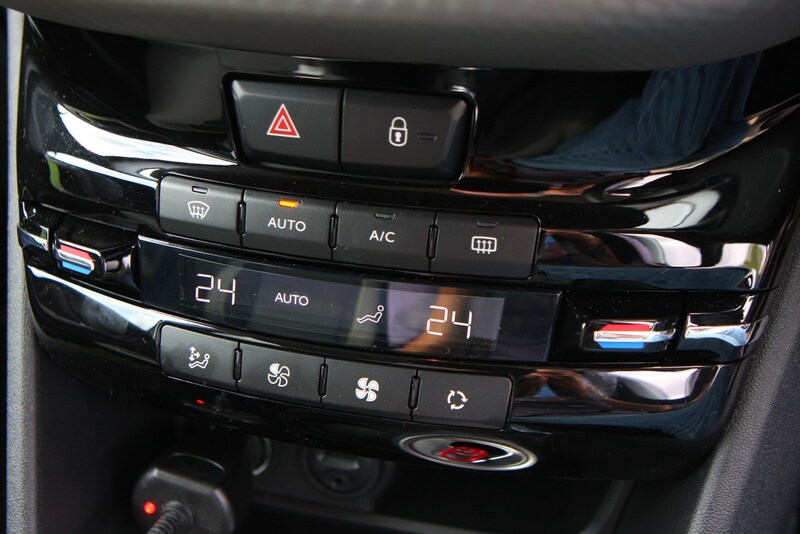 Turn in is sharp, but while the XY’s ride comfort is fractionally superior to the GTi, it loses none of that car’s real-world handling prowess. 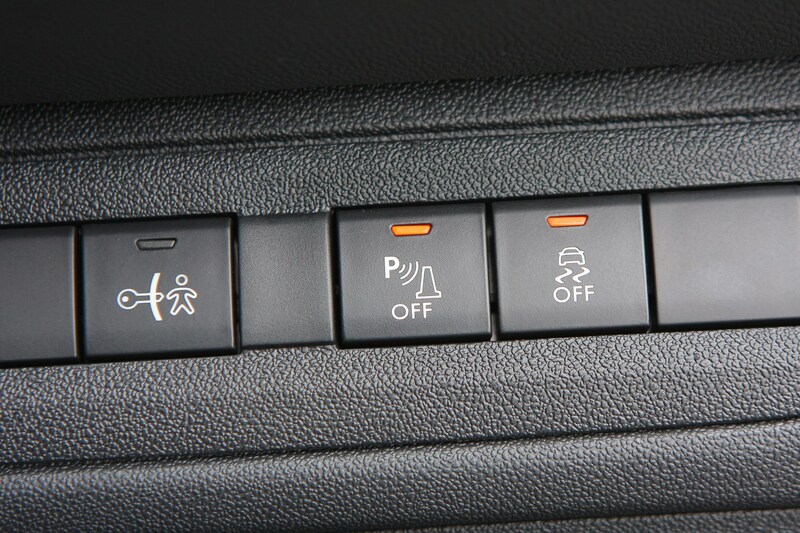 Body roll is almost non-existent. 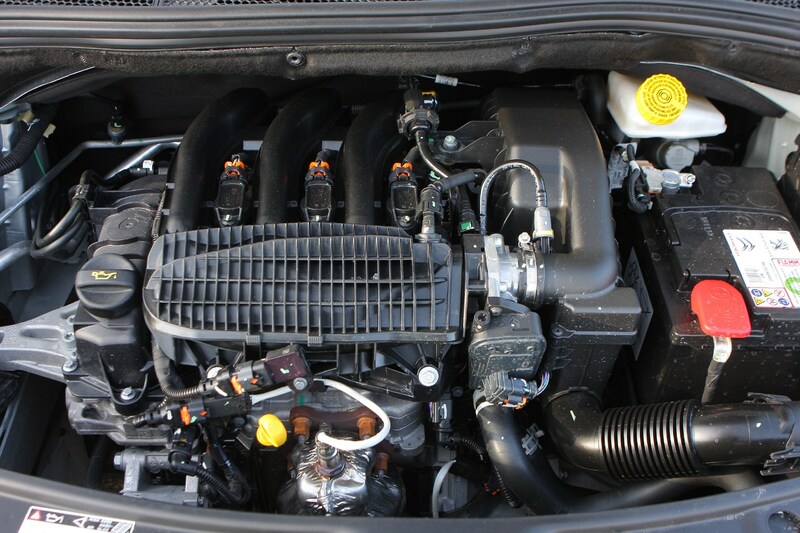 And while it can’t quite match it for outright pace, the 1.6-litre THP 156 engine under the bonnet of the XY is a close relation to the 200hp version found in the GTi. 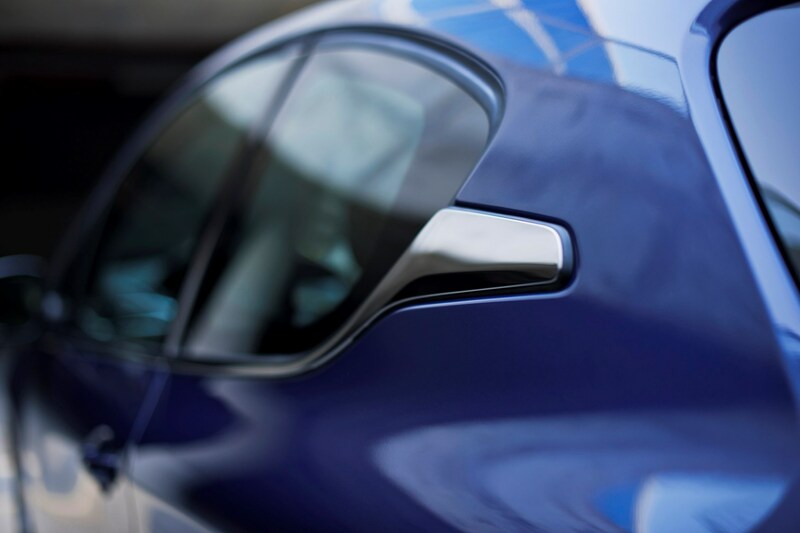 Its blend of subtle styling, capable chassis and high levels of luxury mean it is one of the most rounded models in the firm’s recent history. 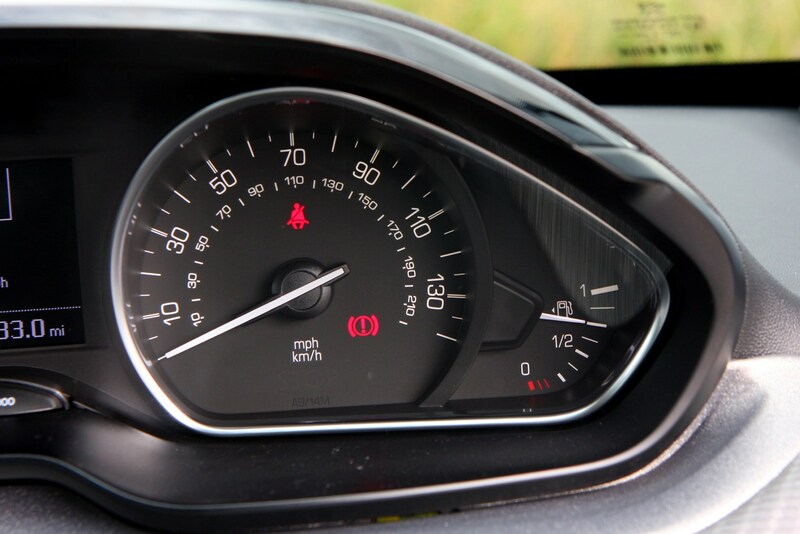 The little engine is very quiet at idle – to the point where you’ll wonder whether it’s running at all – but becomes much more vocal on the move, with a gruff, grumbly exhaust note. 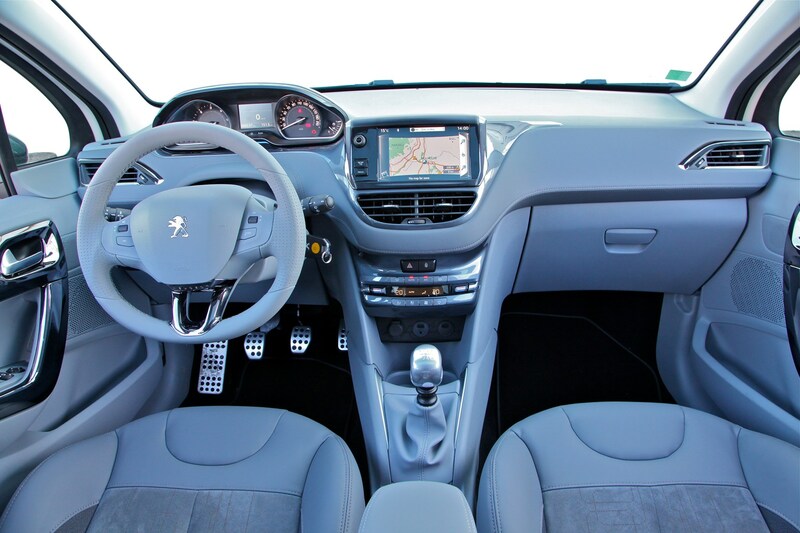 It’s a noise you’ll become quite familiar with because to make decent progress you have to work the engine quite hard. 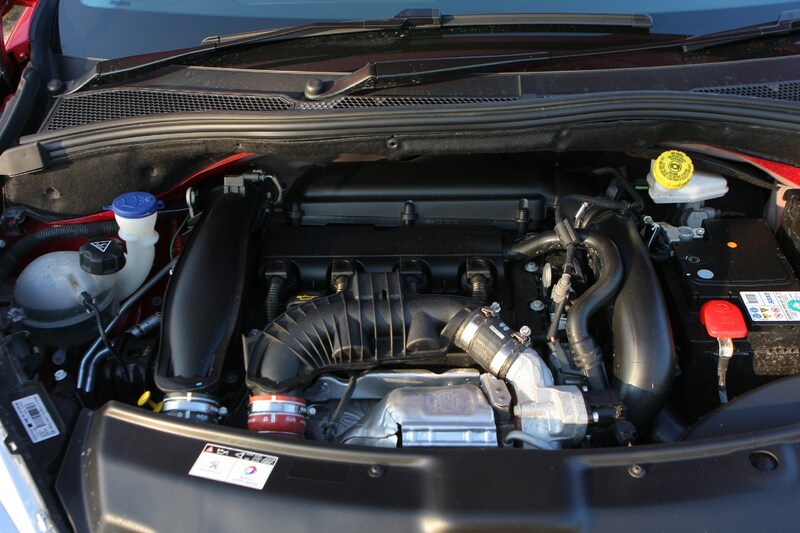 It turns out 68hp, which is enough to push the car from 0-60mph in 14 seconds and on to a top speed of just over 100mph. 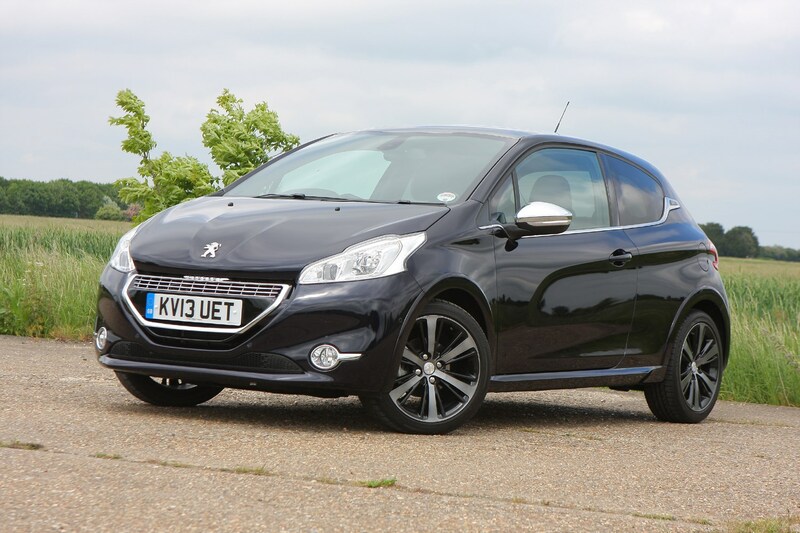 Its relatively slight 95Nm of torque means it takes a while to build up steam and despite the 208 being quite a light car (975kg for the five-door version tested here) it feels sluggish. 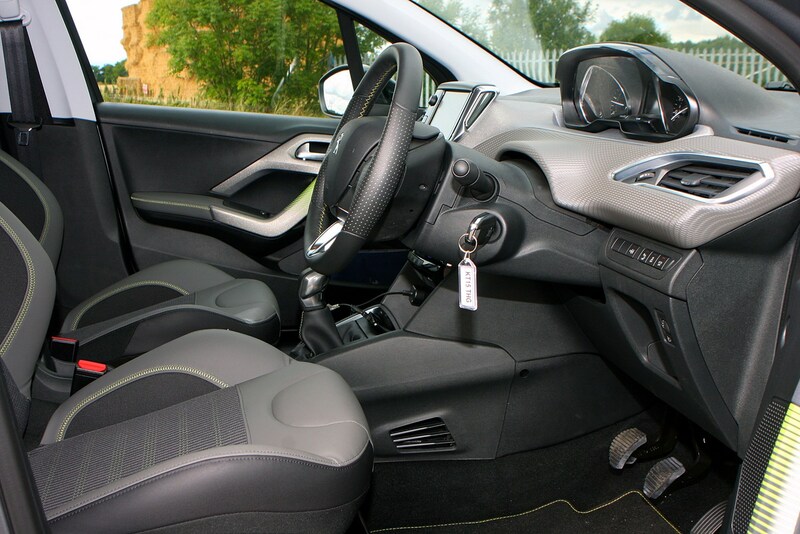 The engine’s matched with a five-speed manual gearbox, which has a light but disappointingly slack-feeling shift action: the six-speed gearbox feels a little nicer to use. 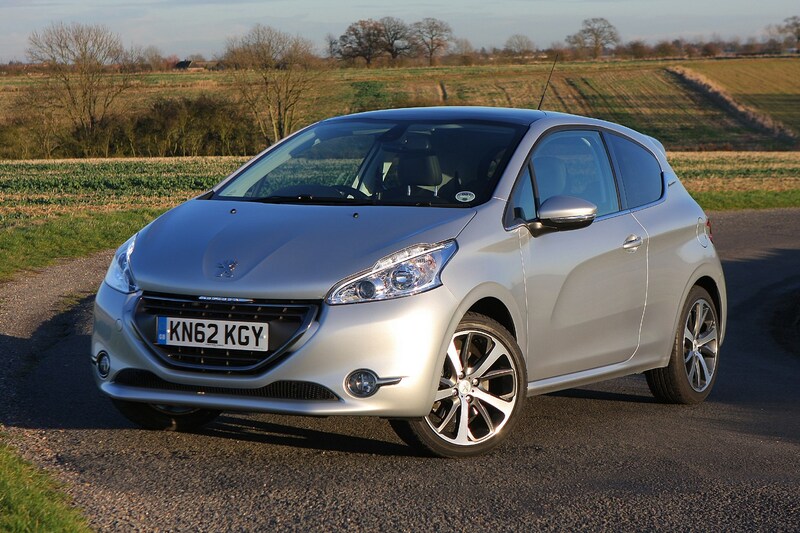 Overall, this 208 is worth considering as a reasonably well-equipped rung on the 208 ladder with low running costs. 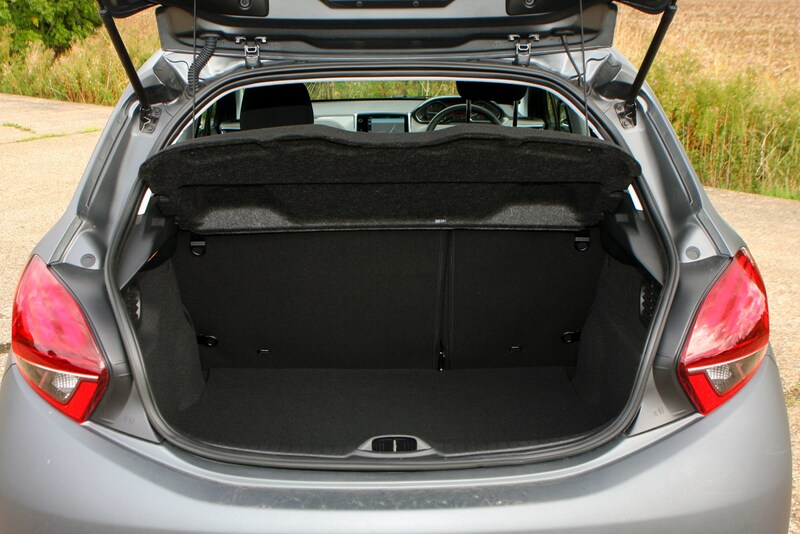 That said, as with most cars if you’re able to stretch to a larger engine and a higher trim level you’ll have a more appealing car overall. 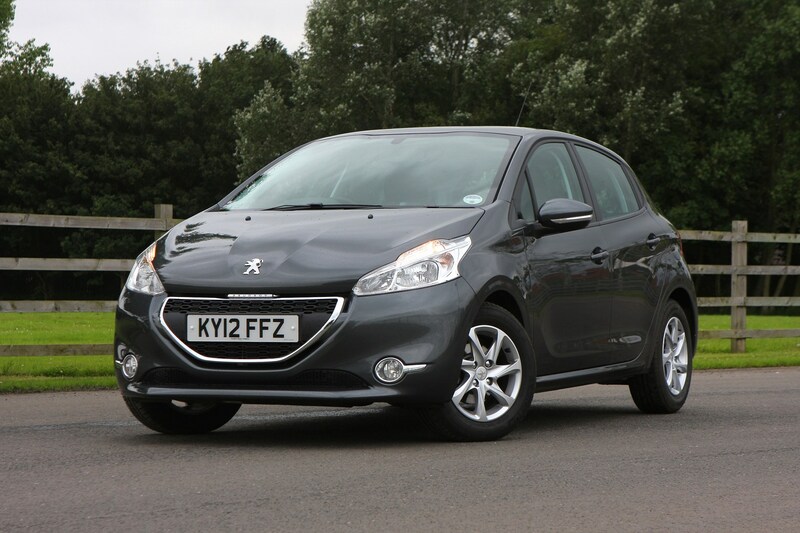 While the keenest drivers will be keeping an eye out for the hotly-anticipated GTi version, if you’re looking for the pick of the mainstream Peugeot 208s for driving fun it has to be the 1.6-litre petrol THP 156. 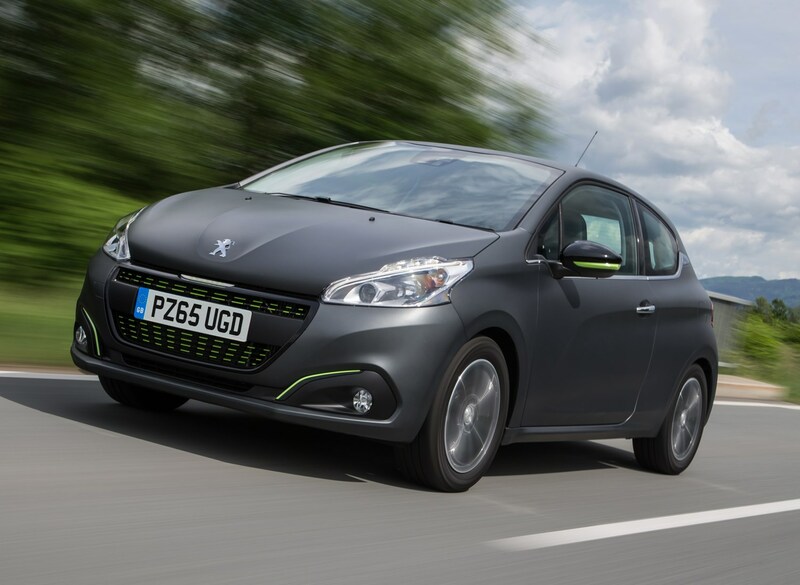 As the name suggests, it churns out a healthy 156hp making it the most powerful 208 in the range to date and it’s paired with a six-speed manual gearbox. 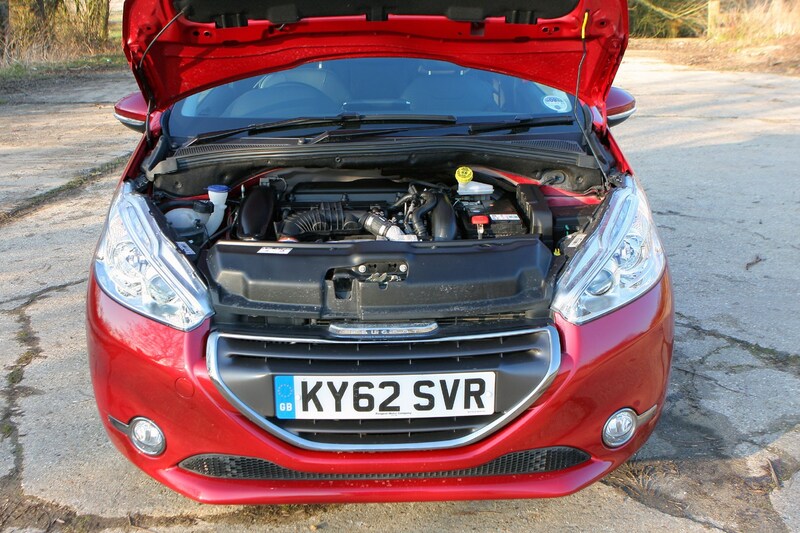 The engine’s pulling power is spread pretty evenly across its rev range, which makes it a smooth, easy car to make progress in with plenty of shove available when you need it. 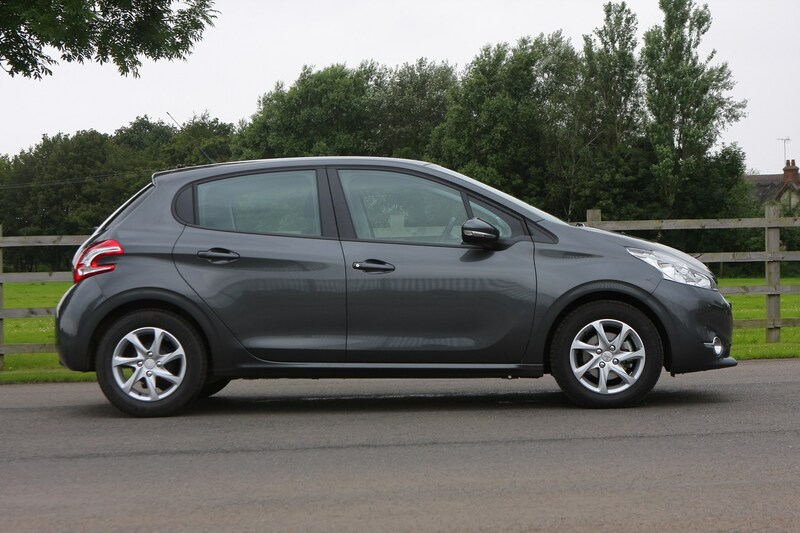 With the THP engine, the 208 has a kerbweight of just over a tonne, which is reasonable compared with other cars in its class. 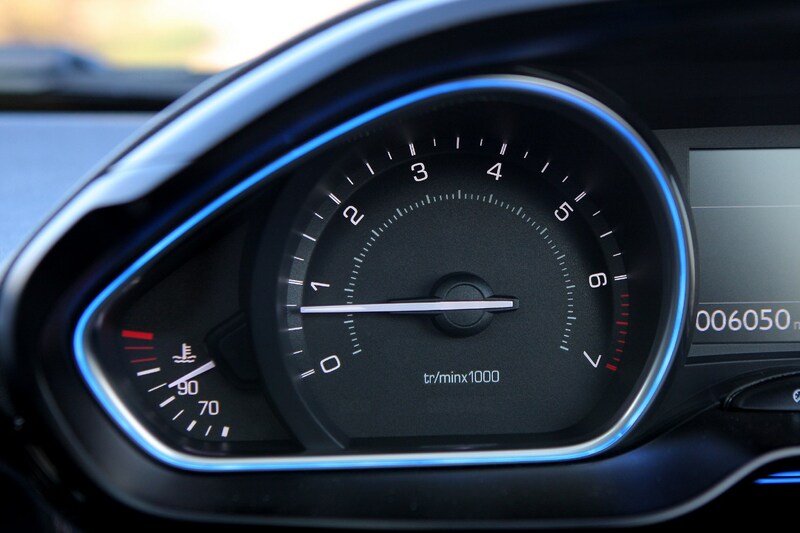 It takes a none-too-shabby 7.3 seconds to reach 62mph from rest and top speed is 134mph. 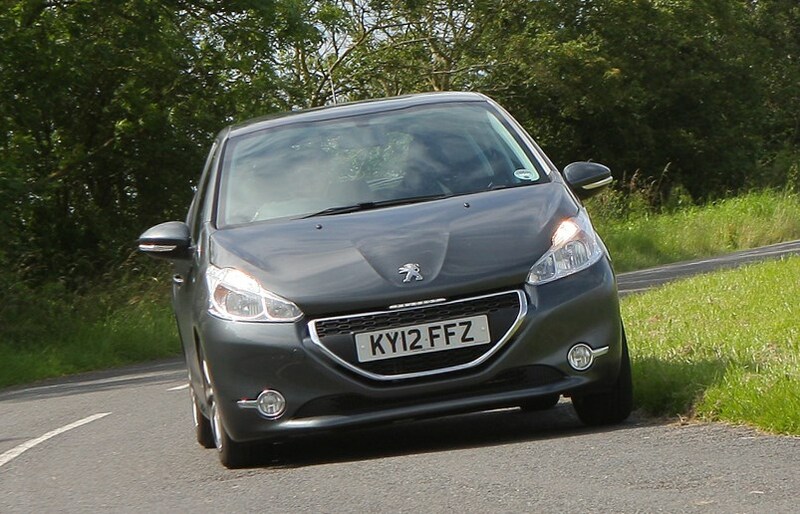 On the whole, the 208 feels pretty well-sorted when cornering. 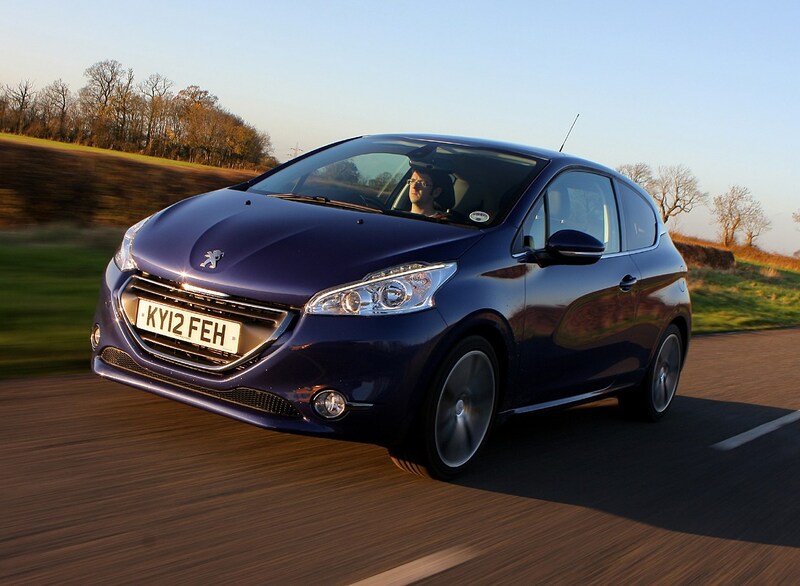 It’s a reassuring car to have on your side on a twisty road, and although it arguably doesn’t feel quite as involving as some of its competitors such as the Ford Fiesta and Suzuki Swift, or even some Peugeots of old such as the 306, it’s still a car that you’ll enjoy driving on a favourite road. 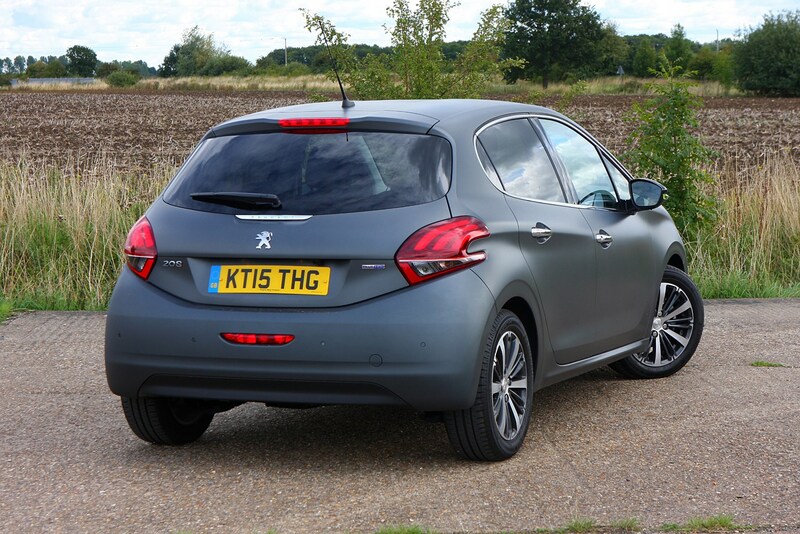 The 1.6 e-HDi in Feline guise, which is loaded with kit, demonstrates the 208’s new big-car feel perfectly. 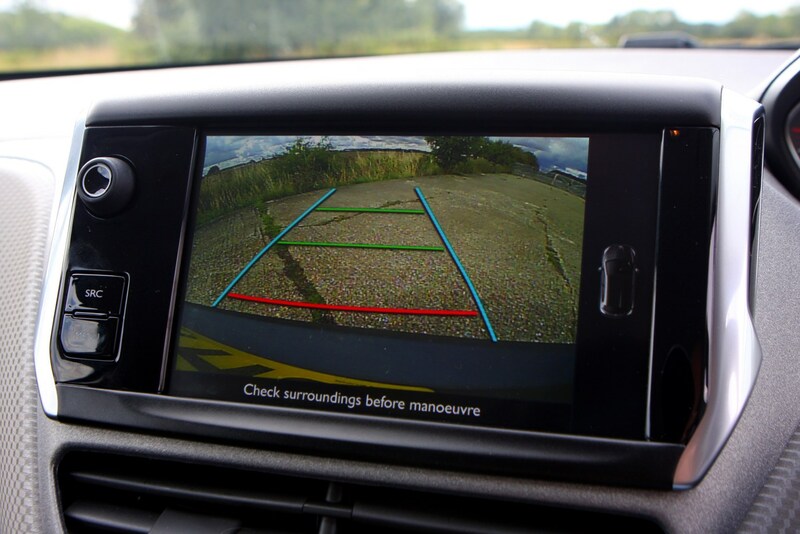 The main benefit of the Feline model is the colour sat-nav. 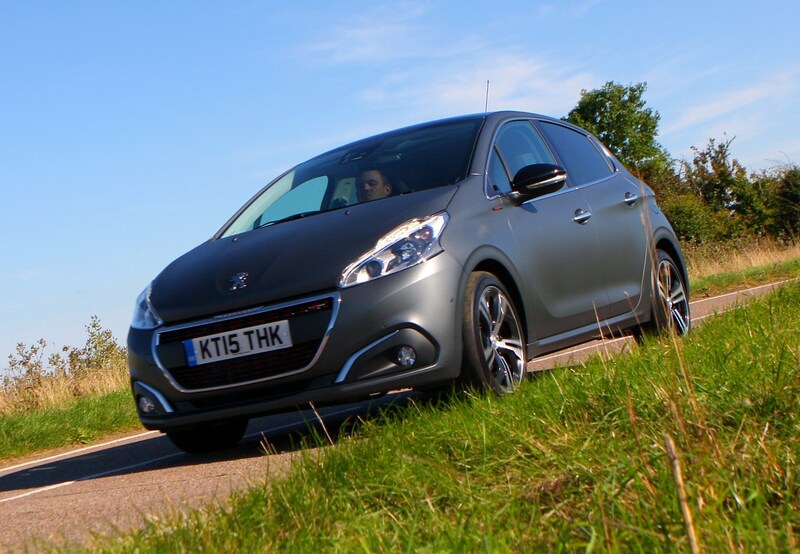 Peugeot’s new Connect App offers real-time traffic information, service station locations, parking and even a Yellow Pages directory for local businesses. 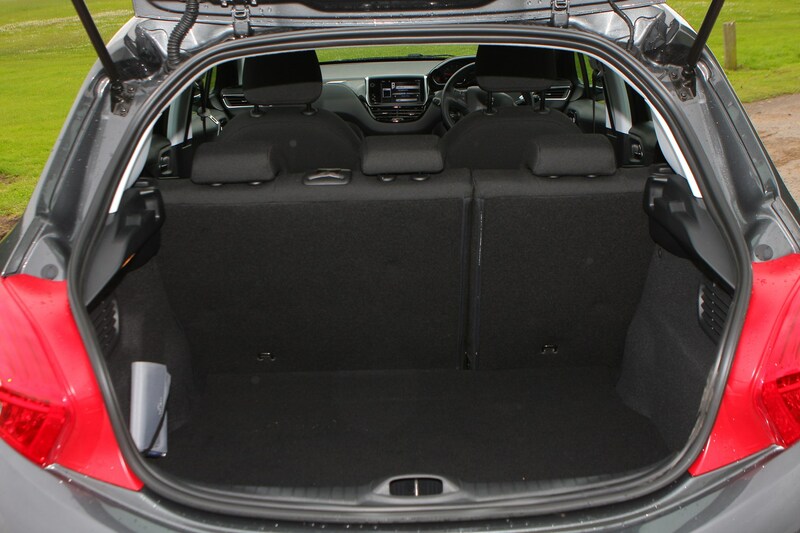 The whole experience is made all the more pleasurable thanks to the 1.6-litre e-HDi 115 diesel engine. 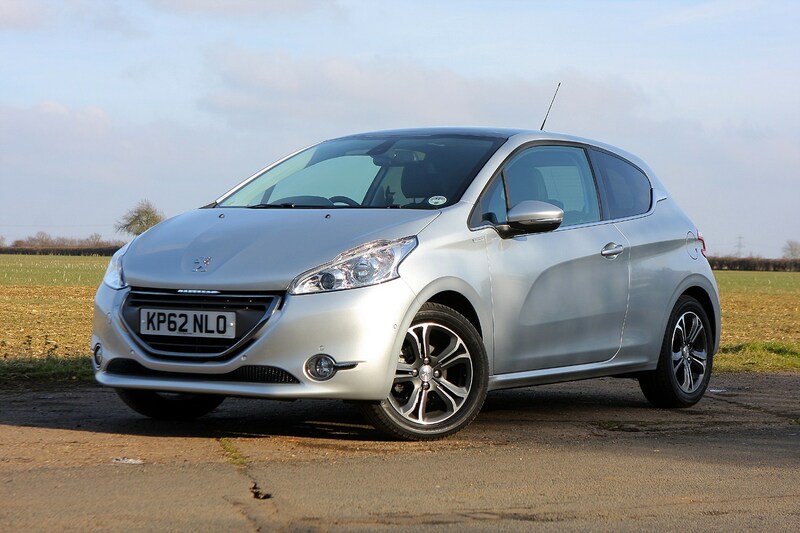 With 115hp and 270Nm of torque from only 1,750rpm, the 208 proves a willing performer, both around town and on the motorway. 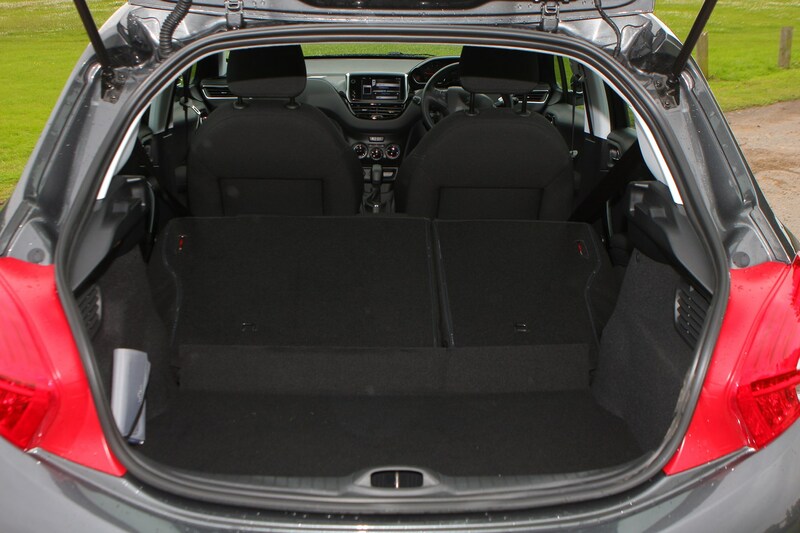 The real reason the 208 Feline e-HDi 115 fits the company car driver’s specification so perfectly, however, is how efficient it is. 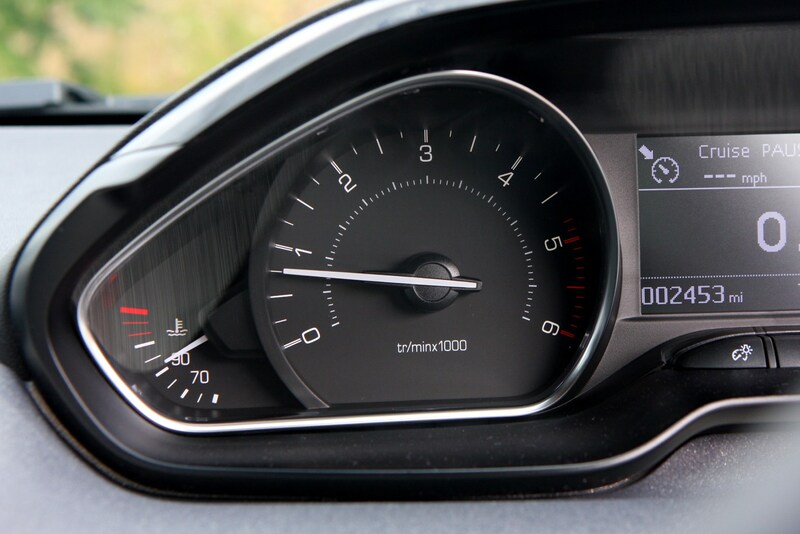 Thanks to the standard-fit stop/start system the diesel emits only 99g/km of CO2 and can return up to 74.3mpg on the combined cycle. 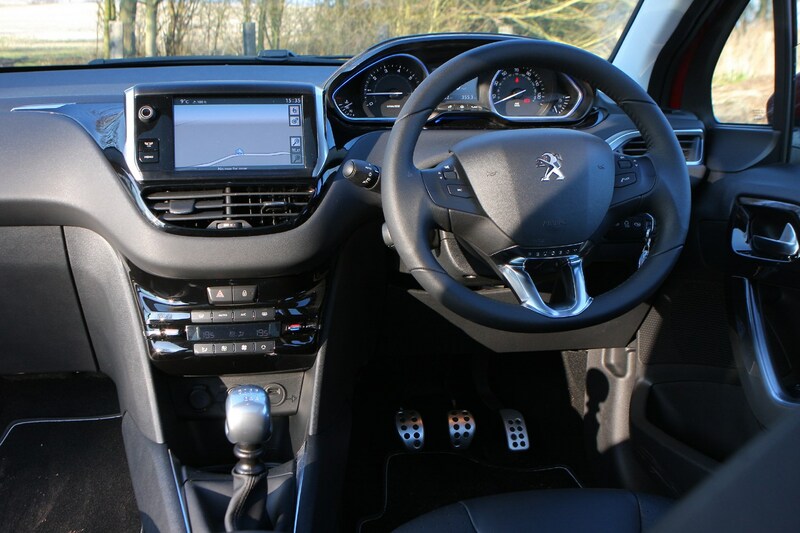 Remember that it manages to do all of that while offering sharp looks, a comfortable interior, plenty of standard kit and enough performance for sustained periods behind the wheel at higher speed. 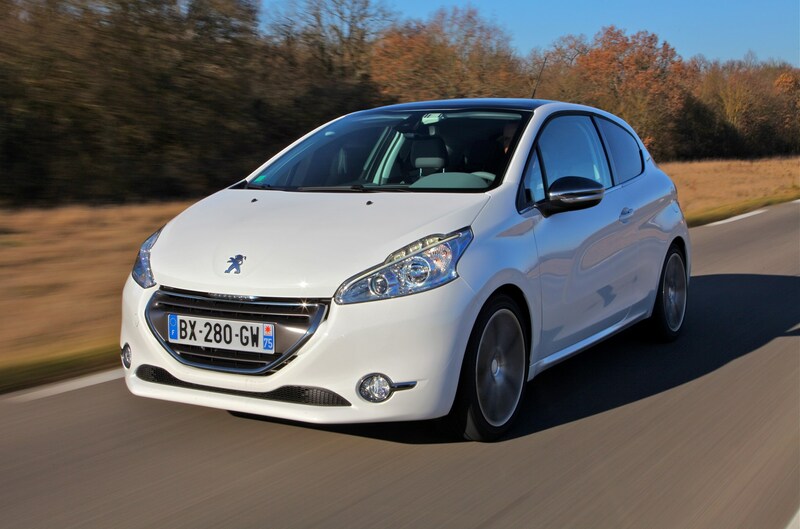 This 208 has a 1.2-litre, three-cylinder petrol engine which produces 82hp and 118Nm of torque. 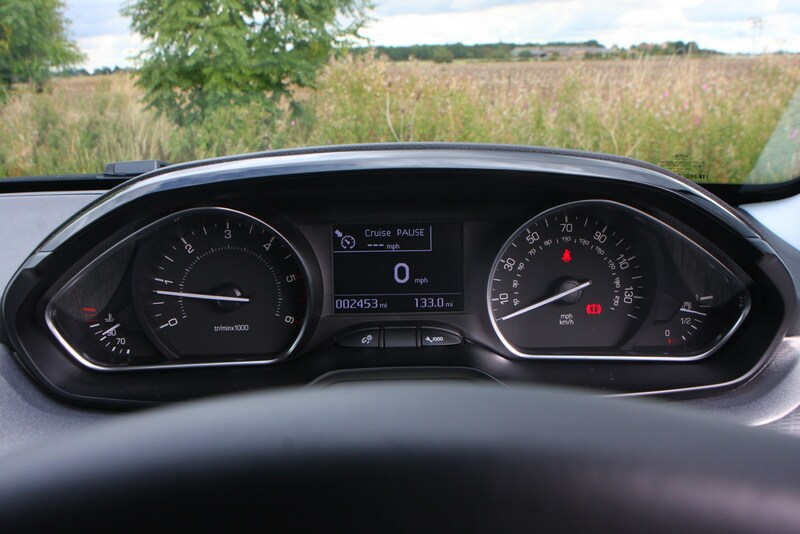 That’s enough for a jaunt from 0-62mph in 14 seconds, with a top speed of 109mph. 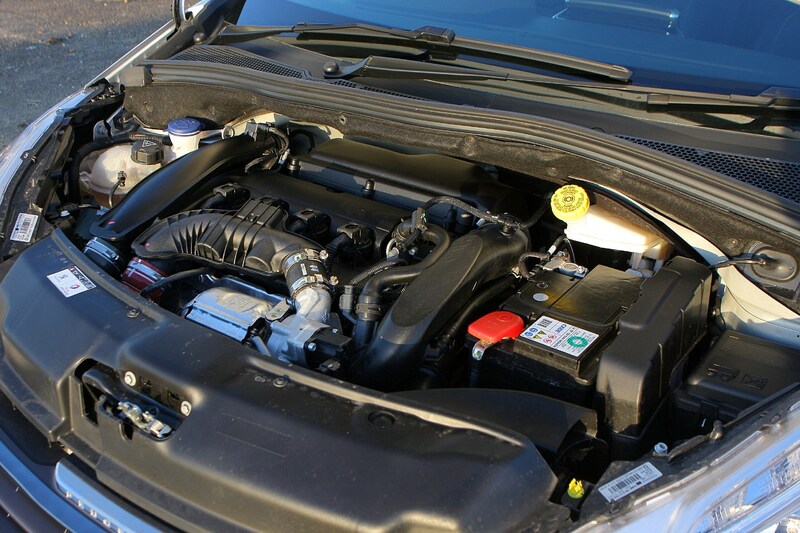 It’s a characterful engine, but has to be worked extremely hard in order to make real progress. 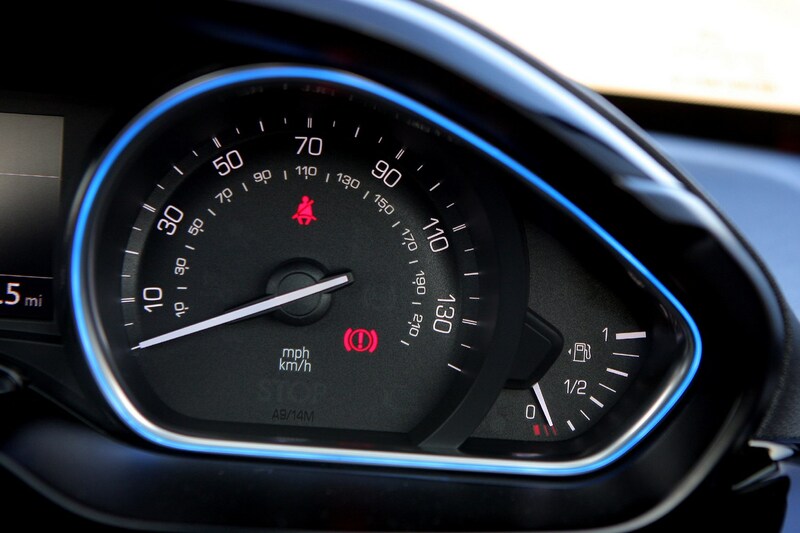 Of course, excellent efficiency is to blame for the performance deficit. 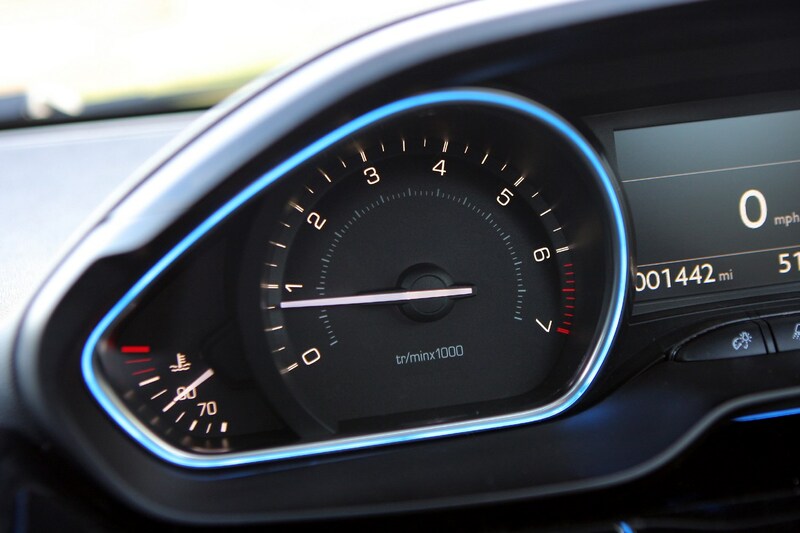 This car emits 104g/km of carbon dioxide. 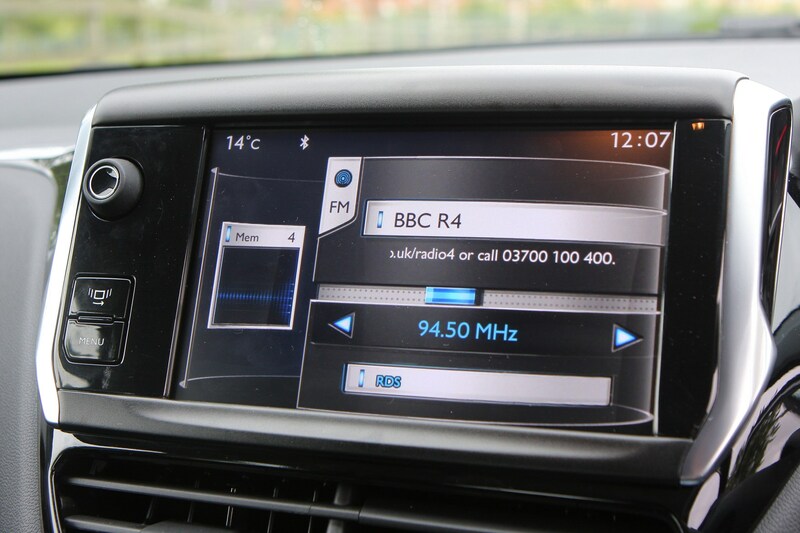 Fuel economy on our car is a claimed 62.8mpg on the combined cycle, although our test team was seeing closer to 50mpg according to the trip computer over mixed driving. 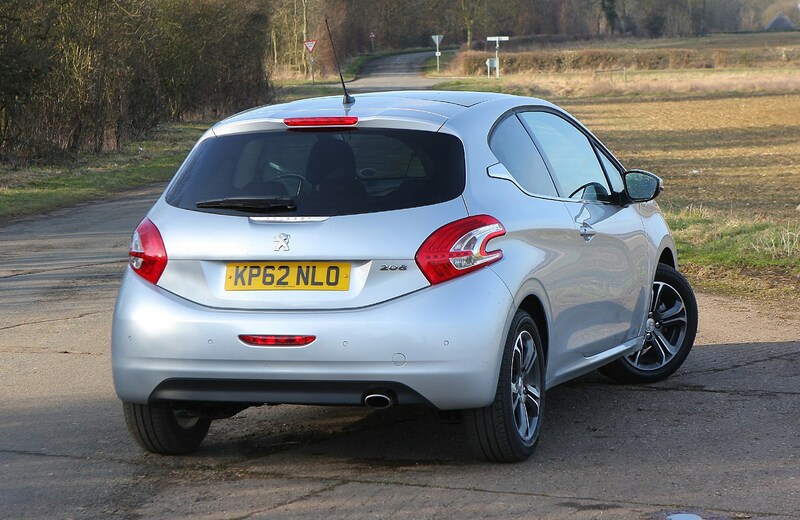 Although the 208 is a fairly comfortable car on the open road, this one does roll around quite a lot in corners. 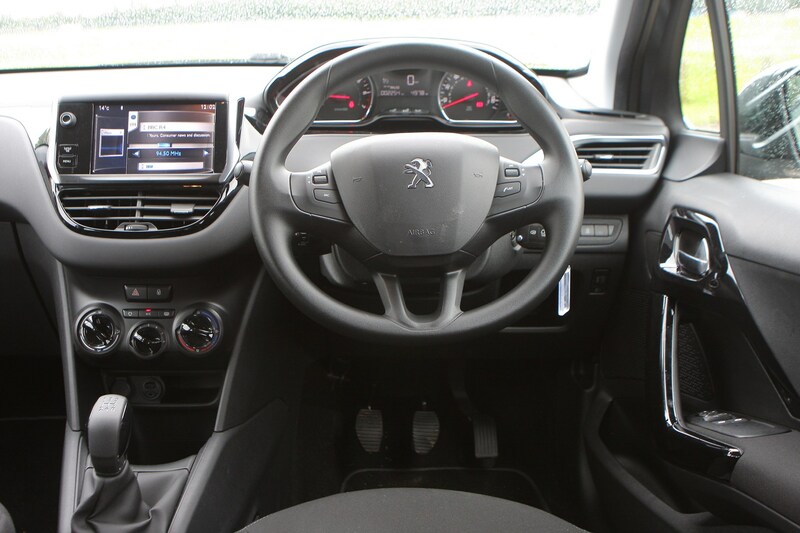 It also lacks any kind of feedback through the steering wheel, although the wheel itself is very small which gives the car a bit of a fun factor. 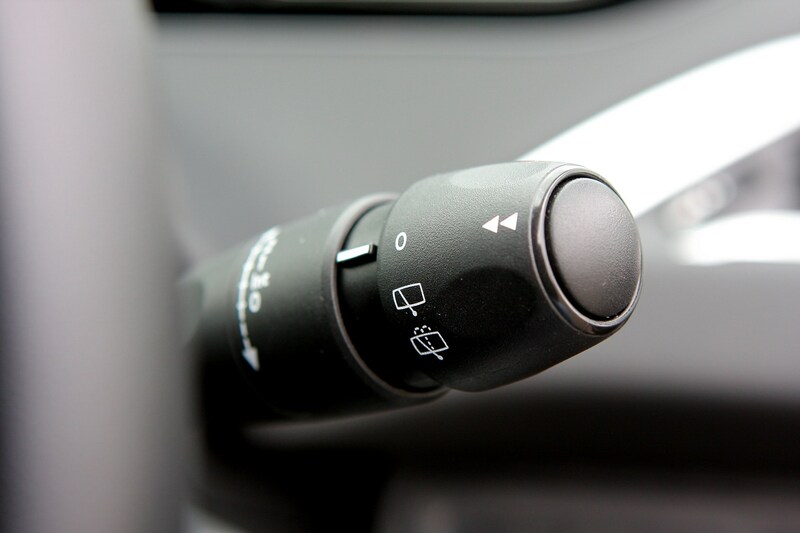 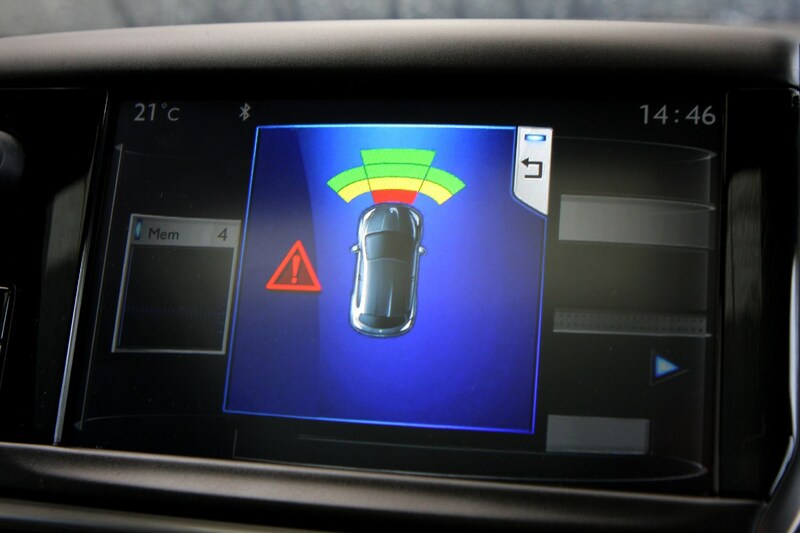 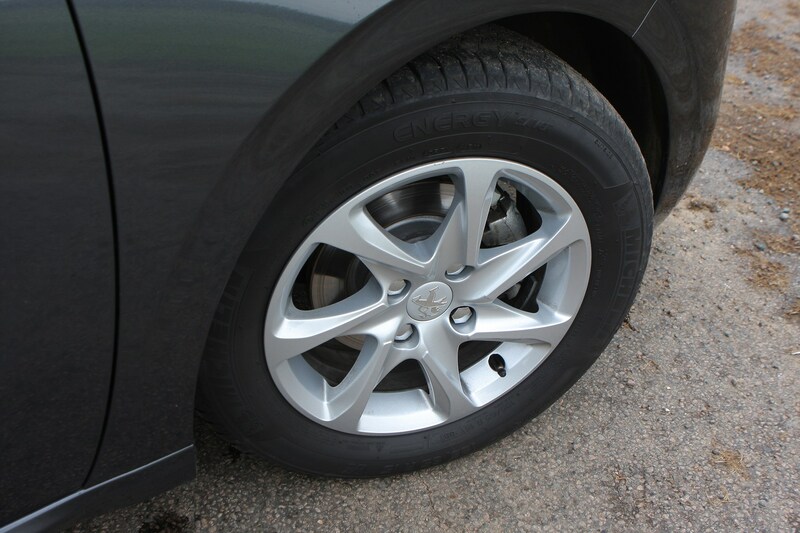 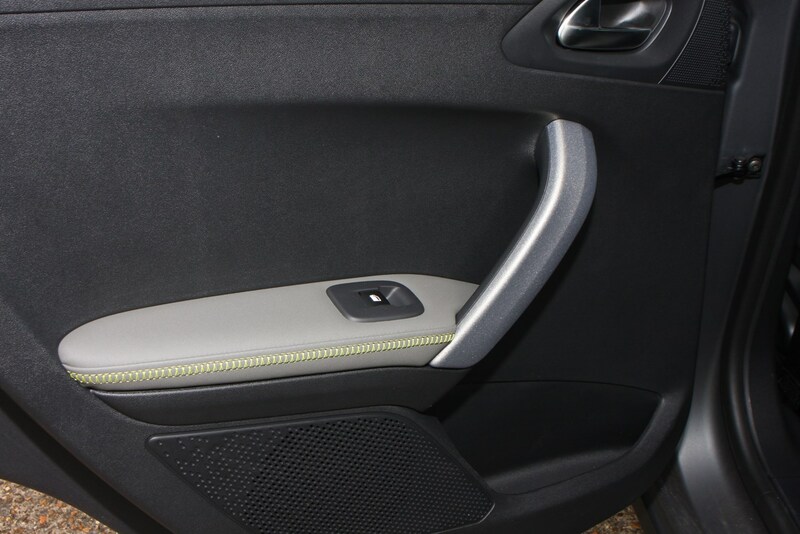 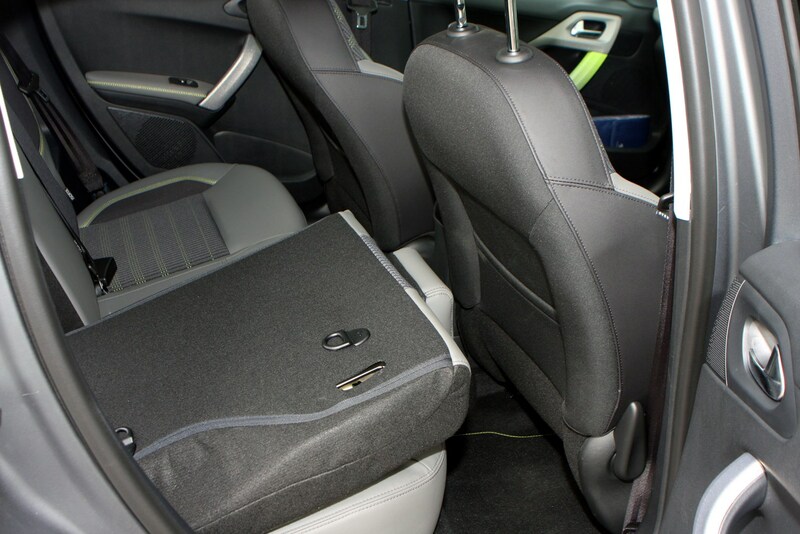 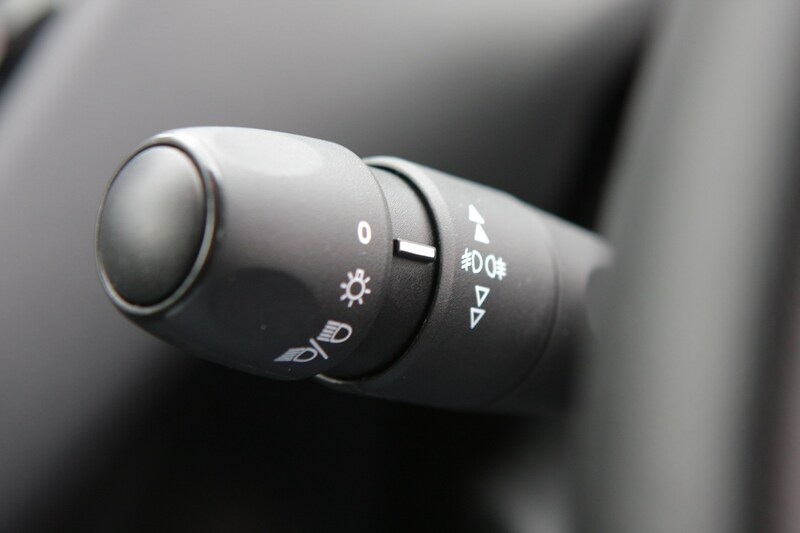 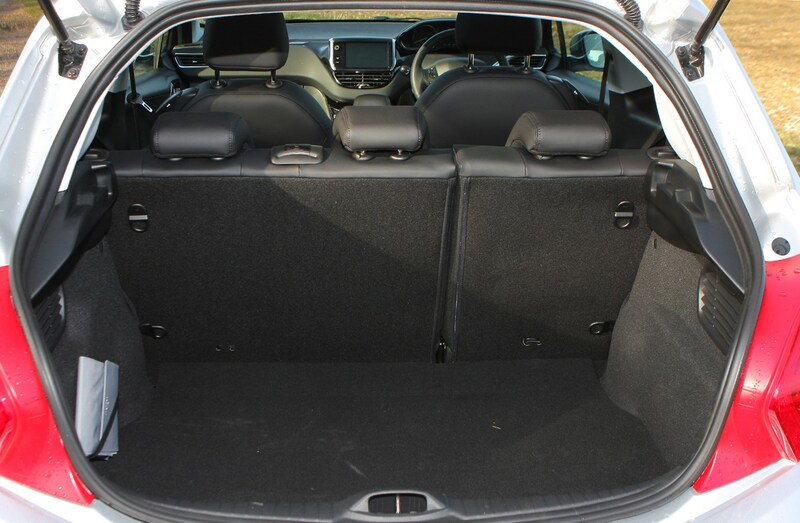 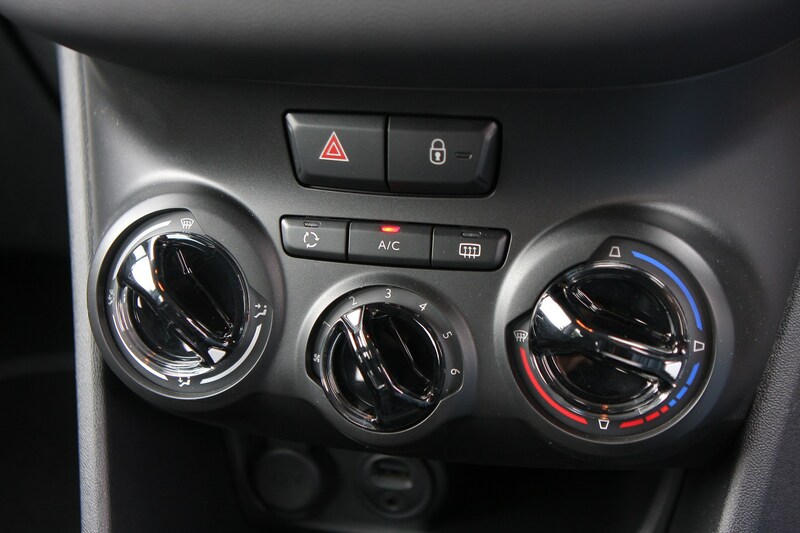 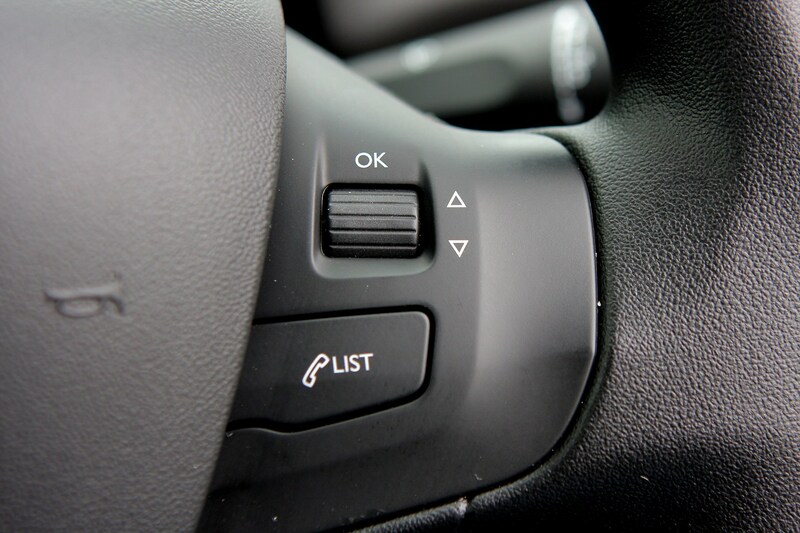 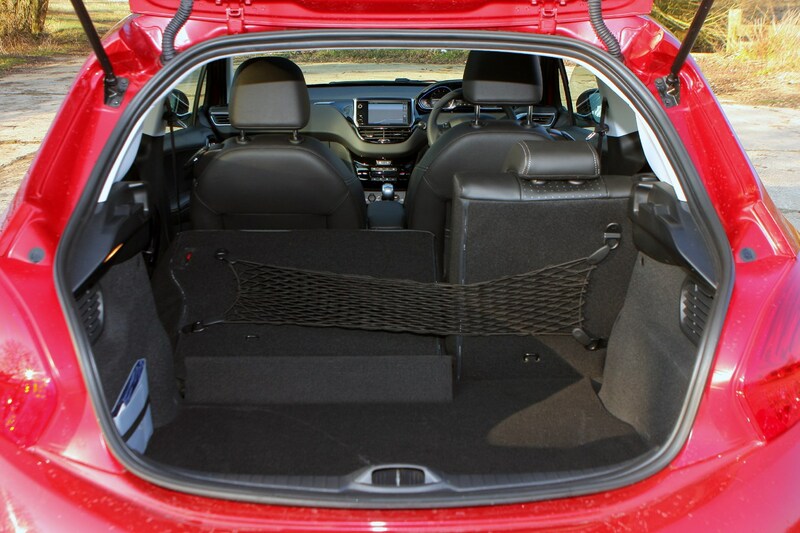 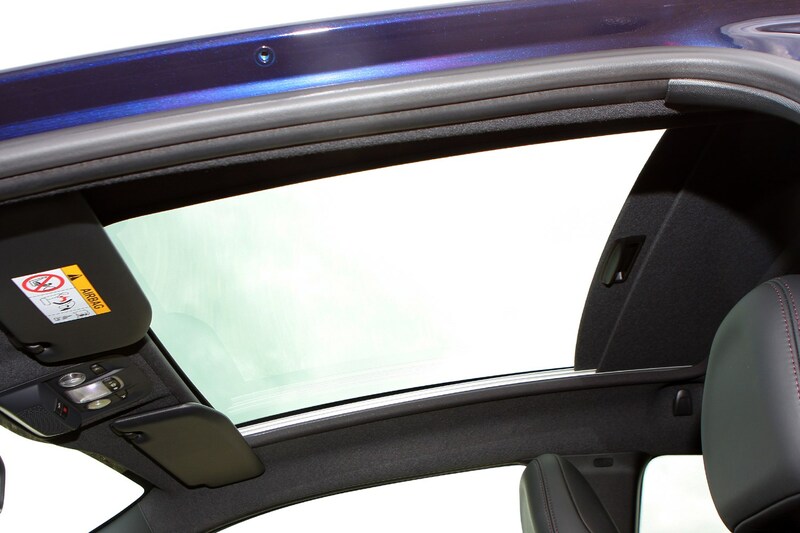 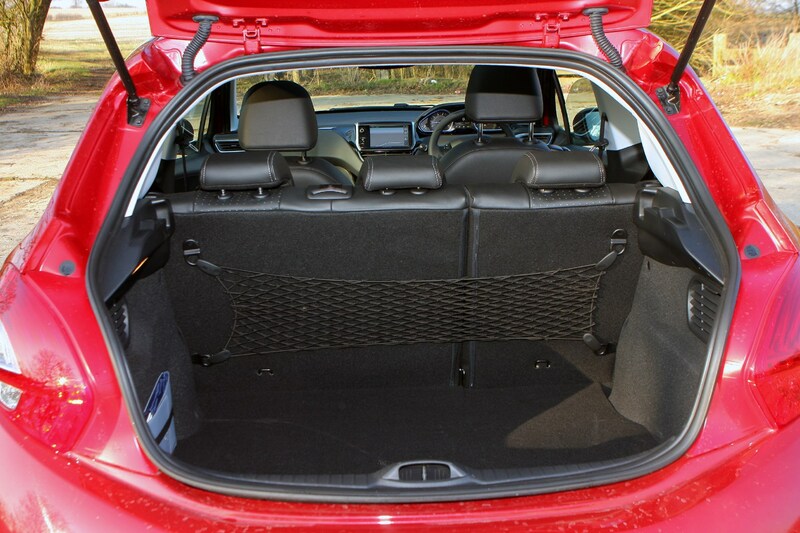 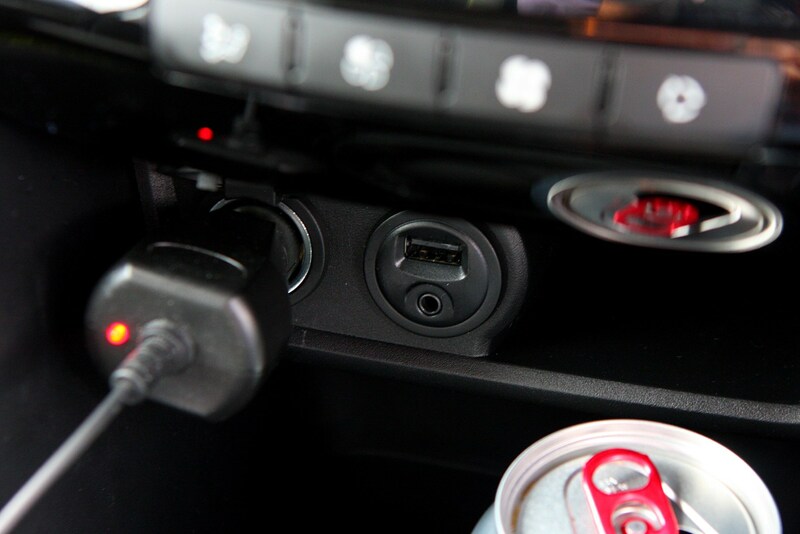 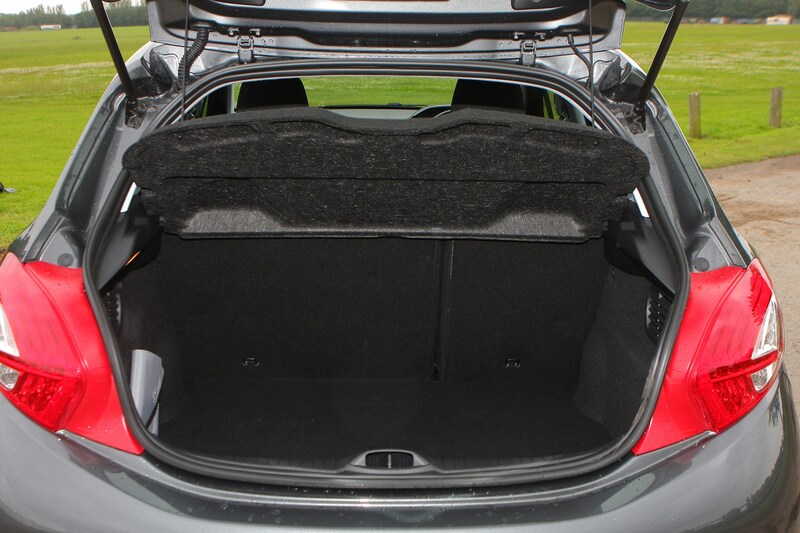 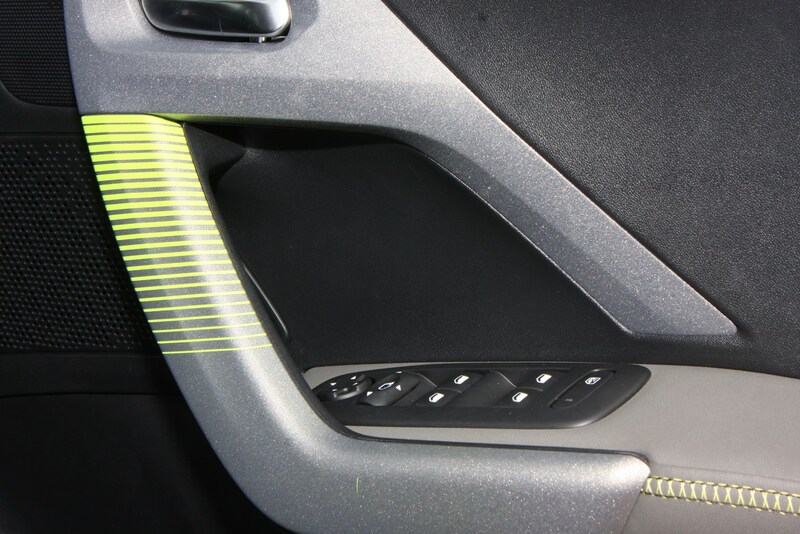 Our car is in Active trim, which means on top of Access+ equipment – which includes electric windows, cruise control and air conditioning - you get 15-inch alloys, front fog lights, a multifunction touchscreen display, a USB connection point and Bluetooth connectivity. 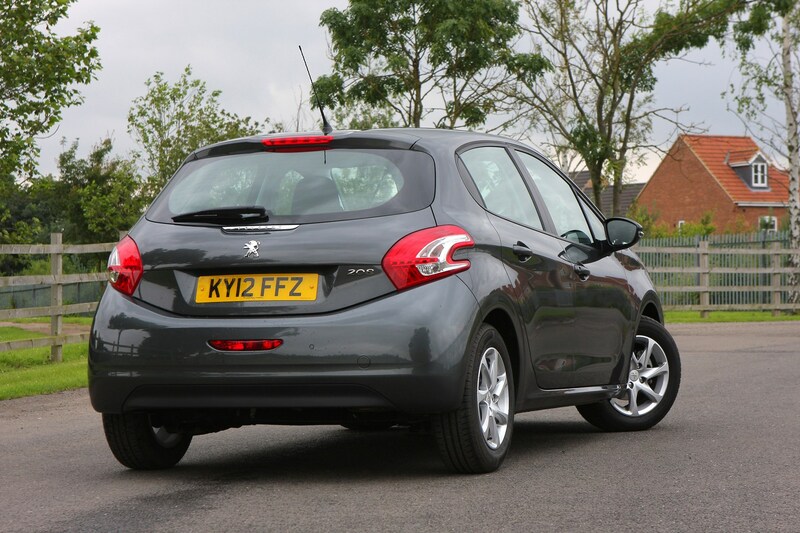 If you’re in the market for a new small hatchback with fairly low running costs and a decent amount of kit, the Active version of the Peugeot 208 could be for you. 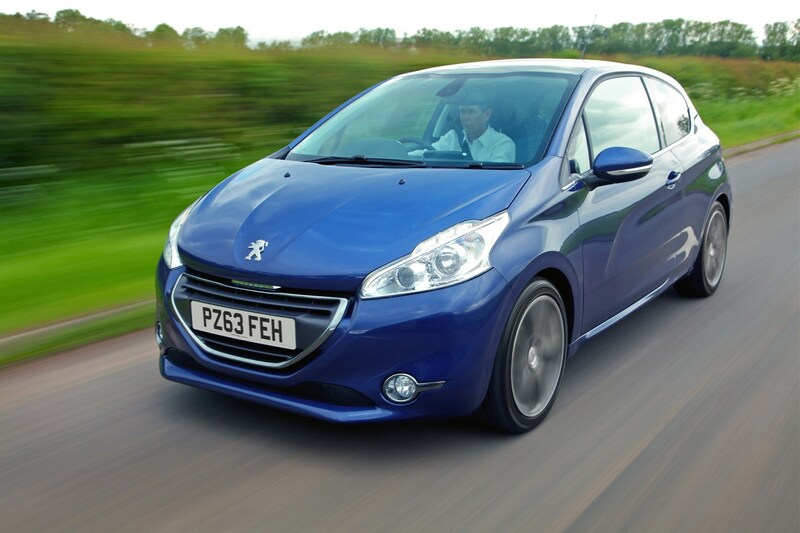 April 2012 – Three- and five-door hatchback range replacing the 207 available to order for June delivery. 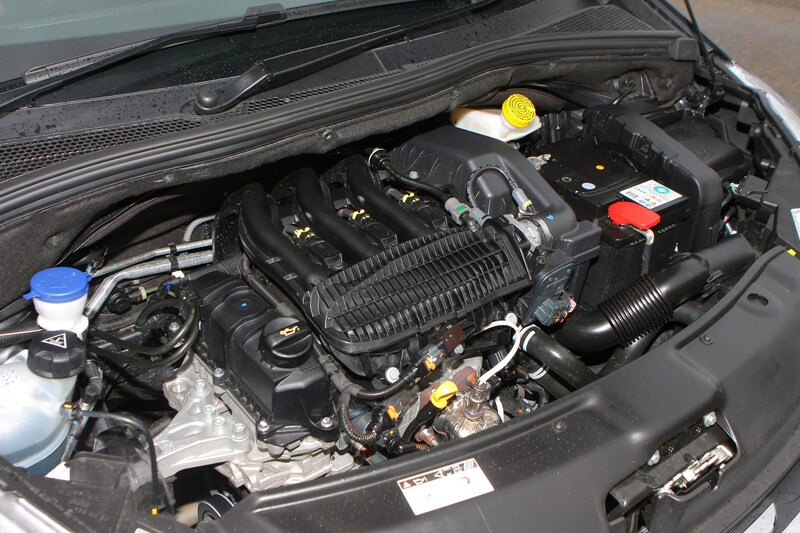 Large range features a wide selection of petrol and diesel engines across a familiar spectrum of Access, Access+, Active, Allure and Feline specifications. 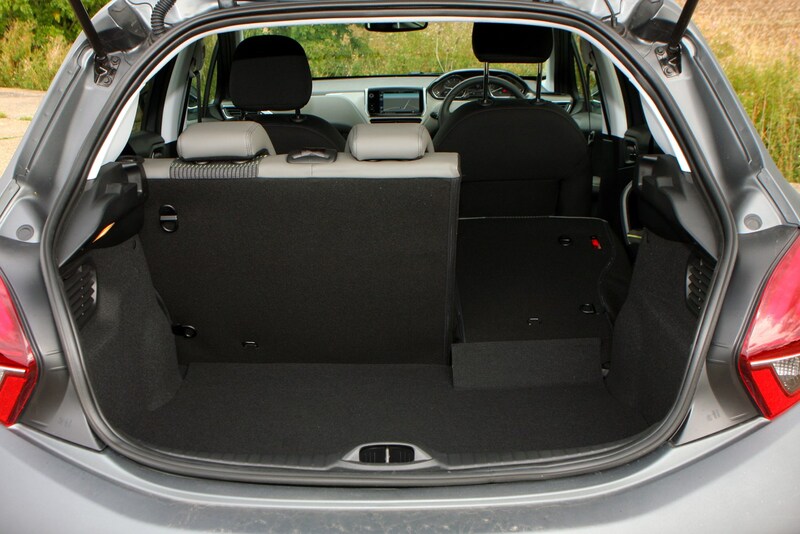 Range is initially topped by the limited edition Ice Velvet three-door, solely available with the 1.6 VTi 120 petrol engine. 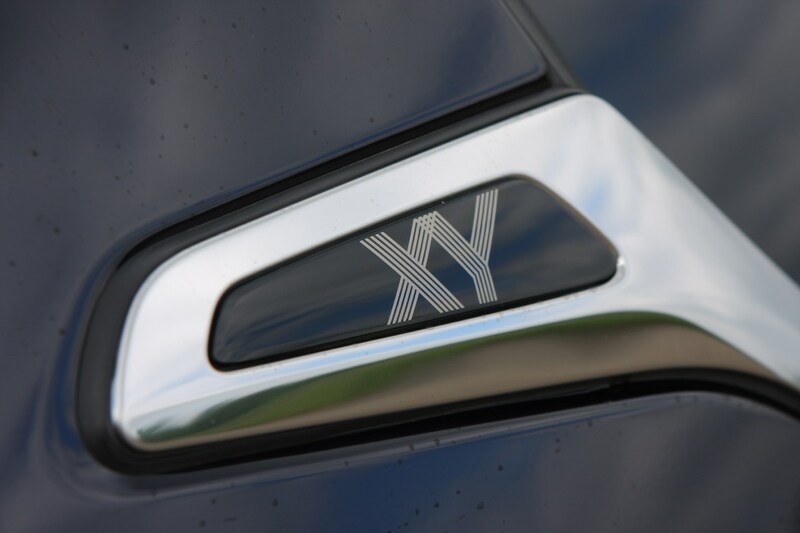 September 2012 – Announced ahead of deliveries beginning the following spring is the XY limited edition three-door models. 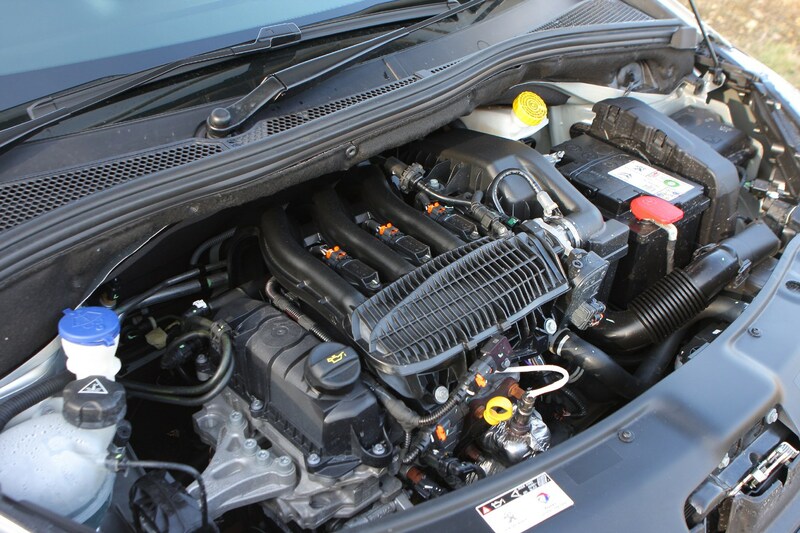 Broad choice of engines feature the petrol 1.6 VTi 120 and 1.6 THP 156, with diesels available in 1.6 e-HDi 92 FAP and 1.6 e-HDi 115 FAP forms. 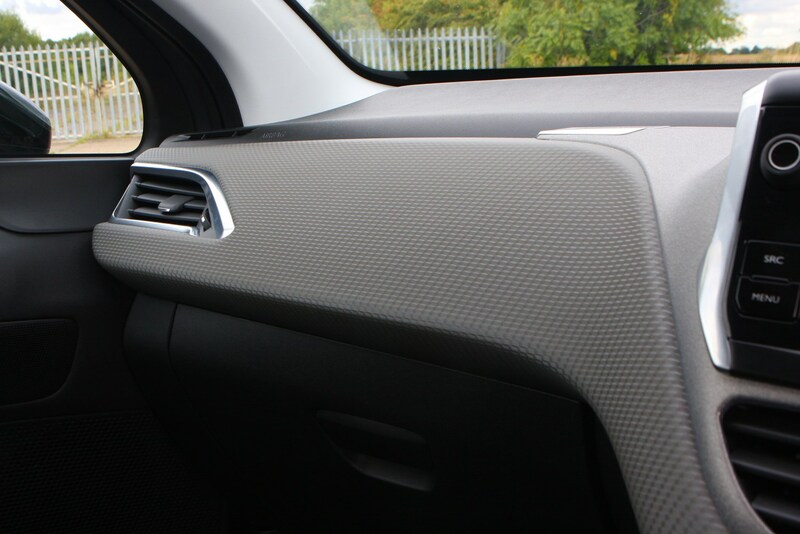 Restricted to just 29 examples, the GTi Limited Edition is available to order with deliveries expected in April 2013. 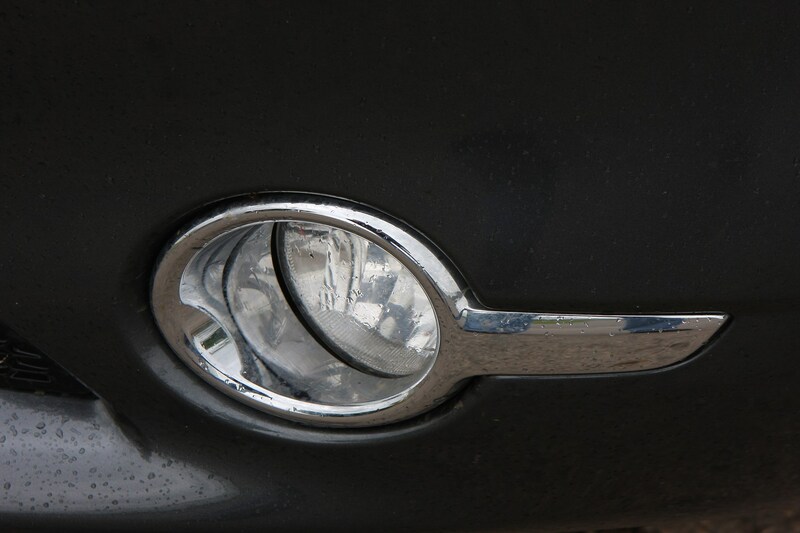 All models have a numbered plaque and a Union flag badge on the grille among other distinguishing features. 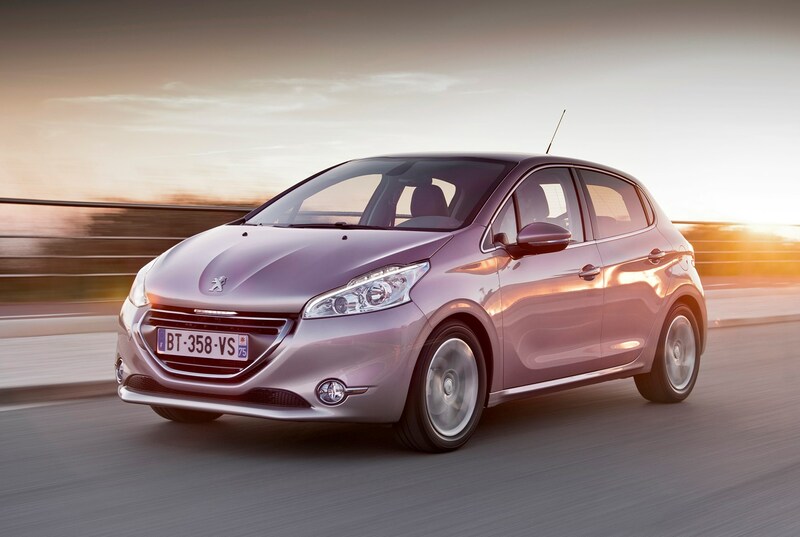 January 2013 – Intuitive limited editions launched in three- and five-door forms. 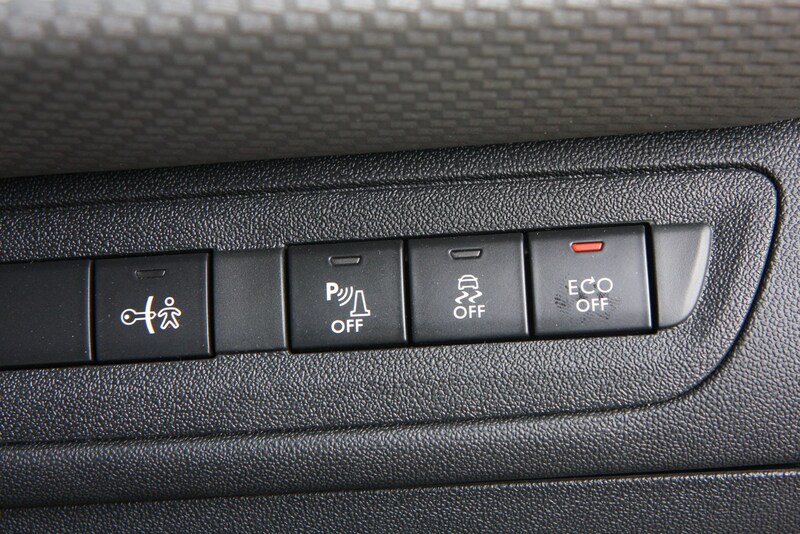 Engine choices are restricted to the petrol 1.2 VTi 82 and diesels in the forms of the 1.4 HDi 70 and 1.6 e-HDi 92. 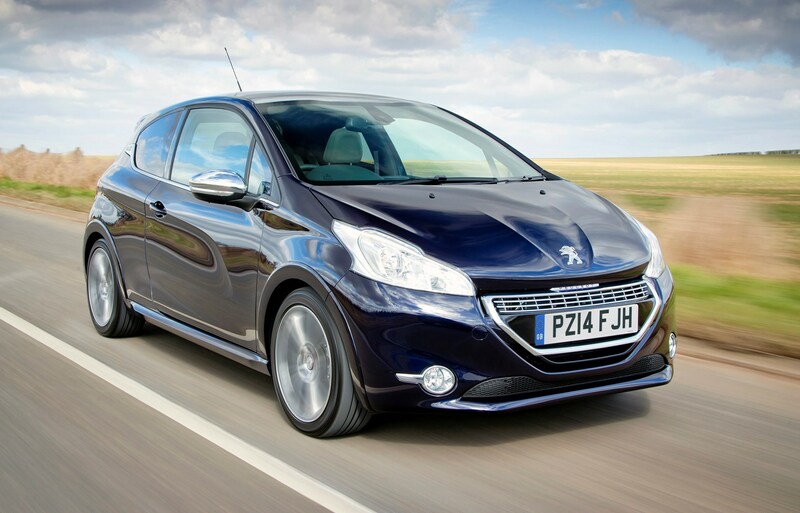 March 2013 – GTi version available to order for April delivery, powered by a 200hp version of the 1.6-litre THP engine. 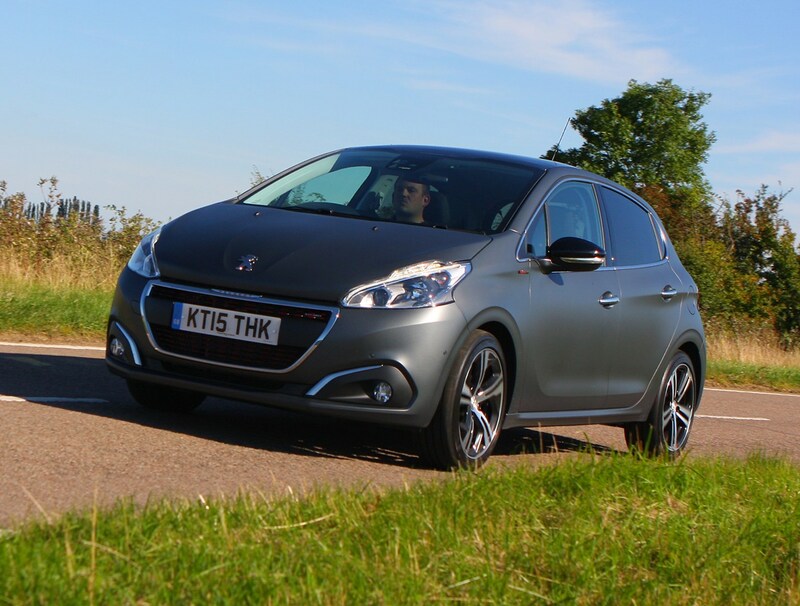 October 2014 – Uprated 208 GTi 30th limited edition available to order, with a series of enhancements to make it more engaging to drive. 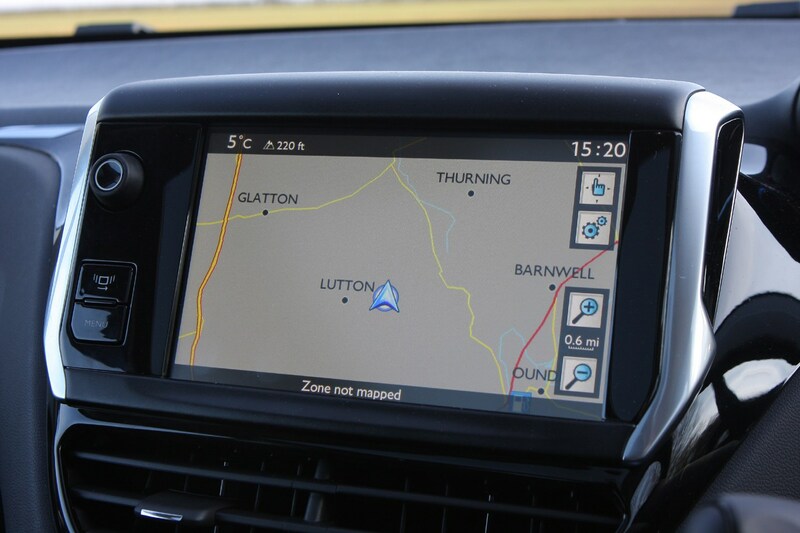 April 2015 – GT Line specification introduced to replace Feline, available in 1.2 PureTech 110, and 1.6 BlueHDi 100 and 120 forms. 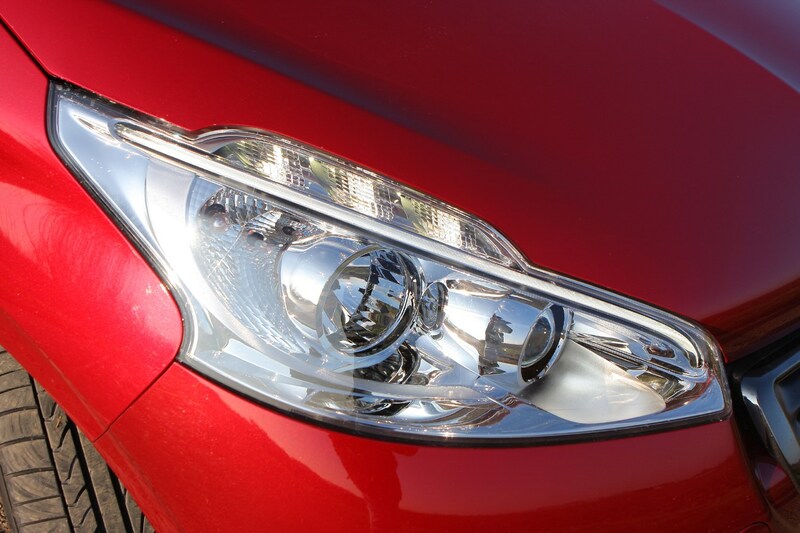 July 2015 – Facelifted range available to order for September delivery, with all models featuring reprofiled bumpers, a reshaped grille and greater employment of LEDs in the lights. 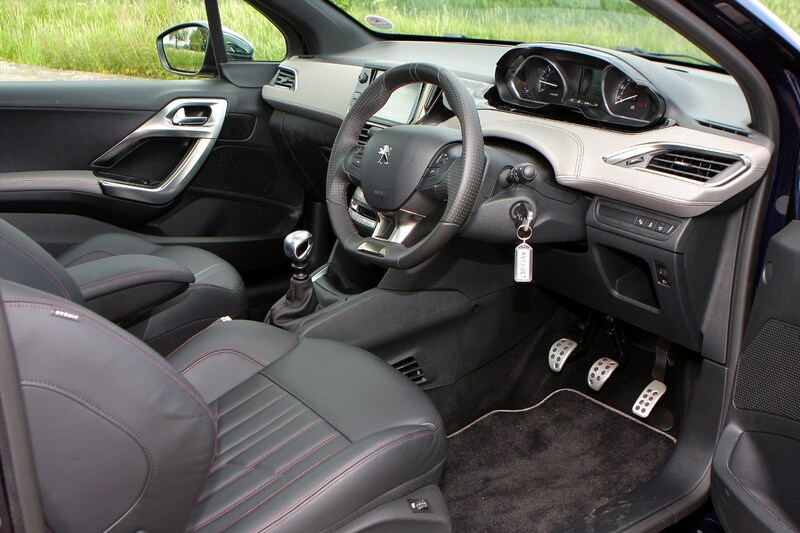 Equipment levels upgraded across the range, with the new trim hierarchy being Access, Active, Allure, GT Line, GTi, GTi Prestige and GTi by Peugeot Sport. 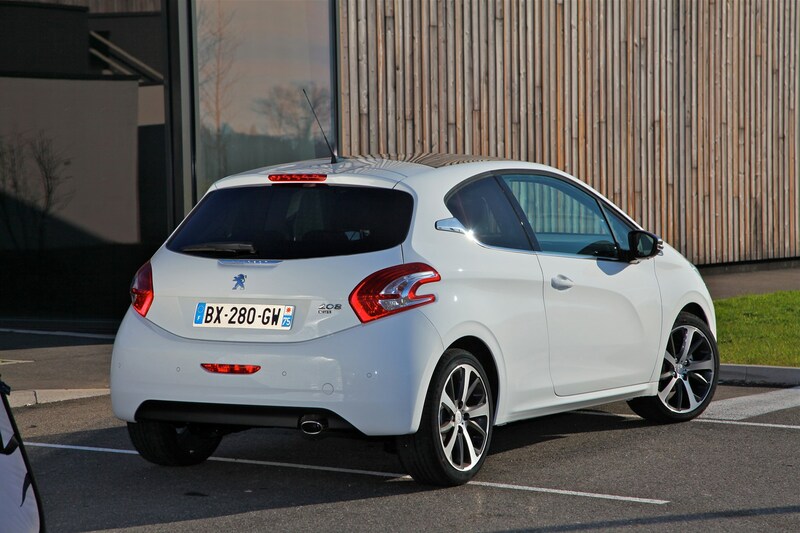 February 2016 – Revised 1.6 BlueHDi diesel engine range with CO2 emissions as low as 79g/km. 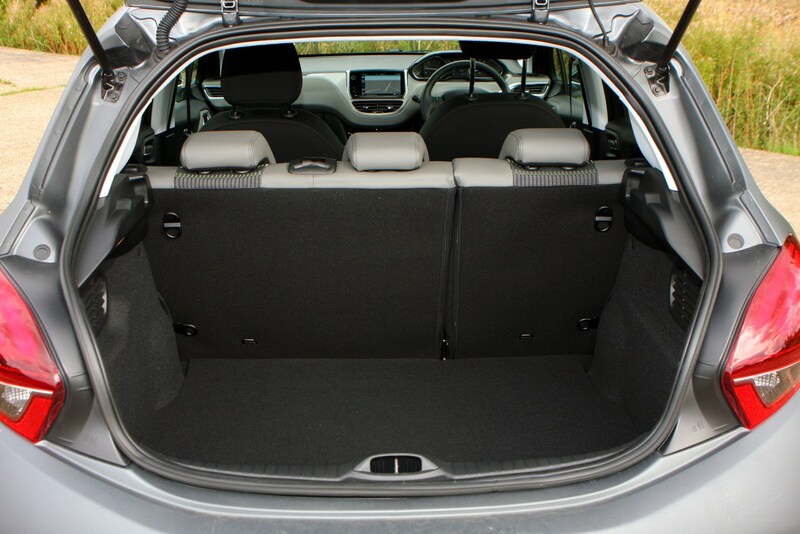 March 2016 – Sporty looks for the limited edition XS, available in three- or five-door forms with the 1.2 PureTech 82 petrol engine. 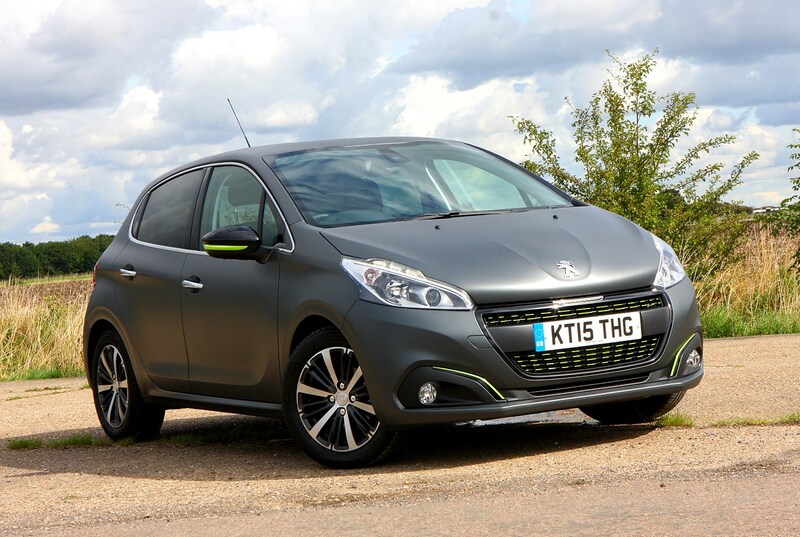 June 2016 – Luxurious Roland Garros limited edition launched with a choice of 1.2 PureTech 110 petrol and 1.6 BlueHDi 100 engines. 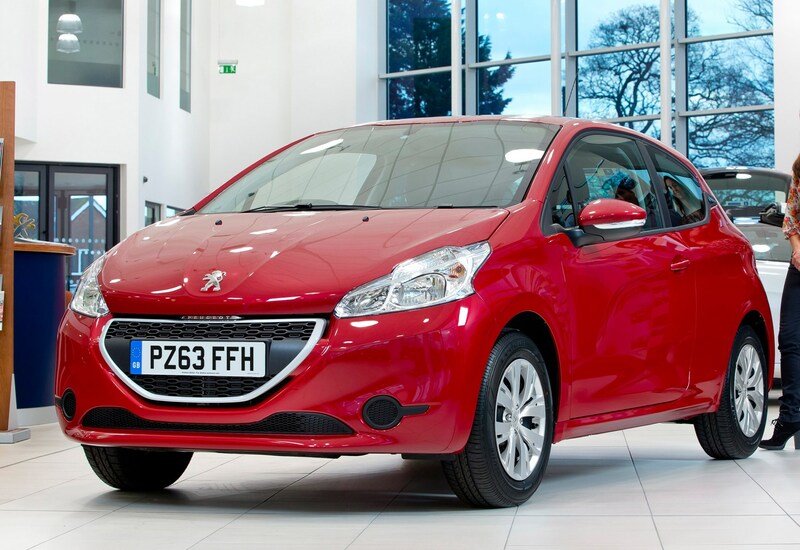 August 2016 – Limited editions launched, both paired with the 1.2-litre PureTech engine: Active Design is available as a three- or a five-door, Allure Premium only with the more practical bodyshell. 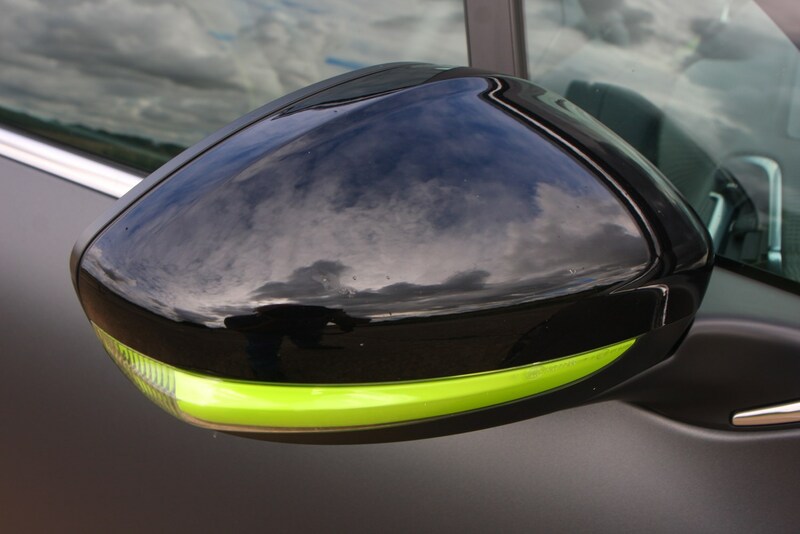 August 2017 – A pair of limited editions introduced: Allure Premium and Black Edition. 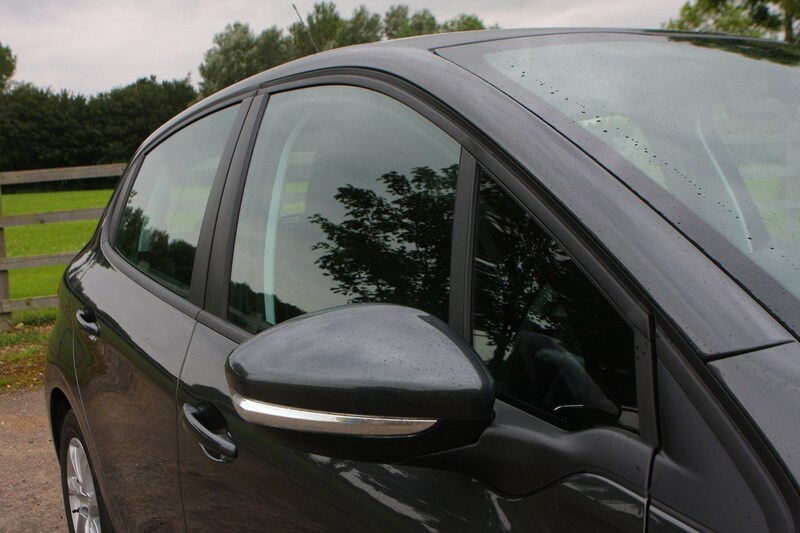 The former has 16-inch Titane matt black alloy wheels, a Cielo panoramic glass roof, rear privacy glass, parking sensors and a reversing camera. 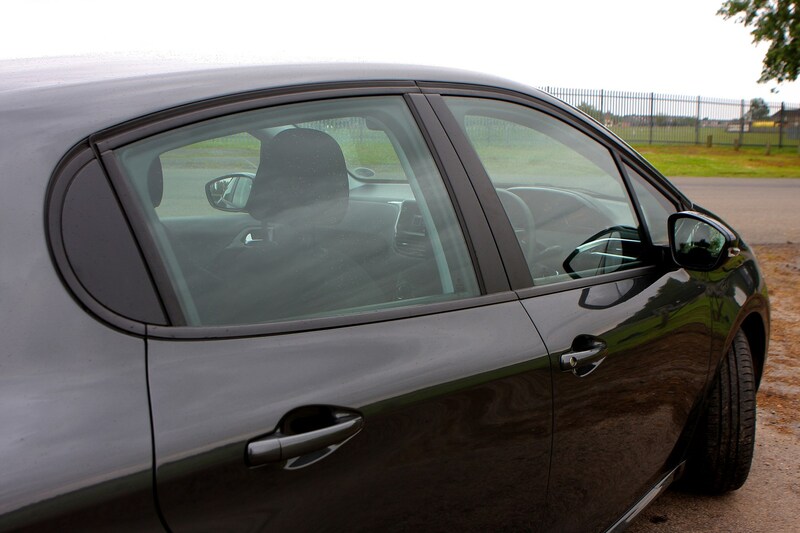 The Black Edition a gloss black finish to its alloy wheels, grille and door mirror caps, with rear privacy glass finishing the darkened appearance. 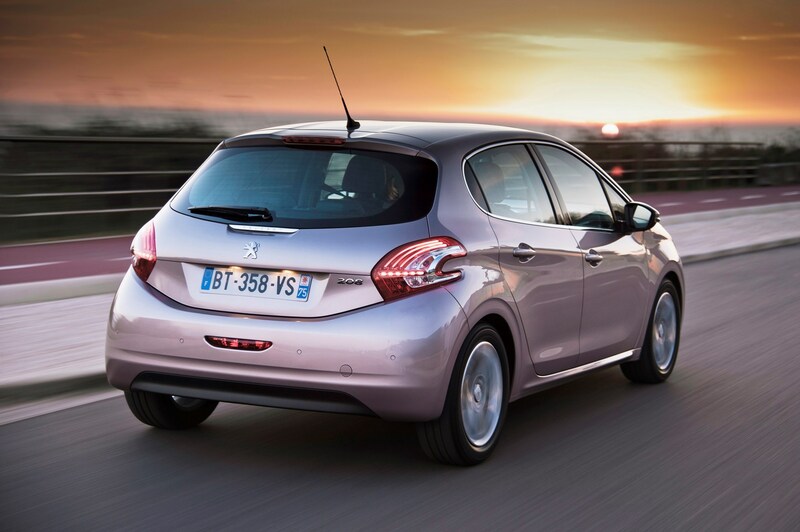 The majority of 208s are sold with petrol engines, with Allure trim proving to be the most popular. 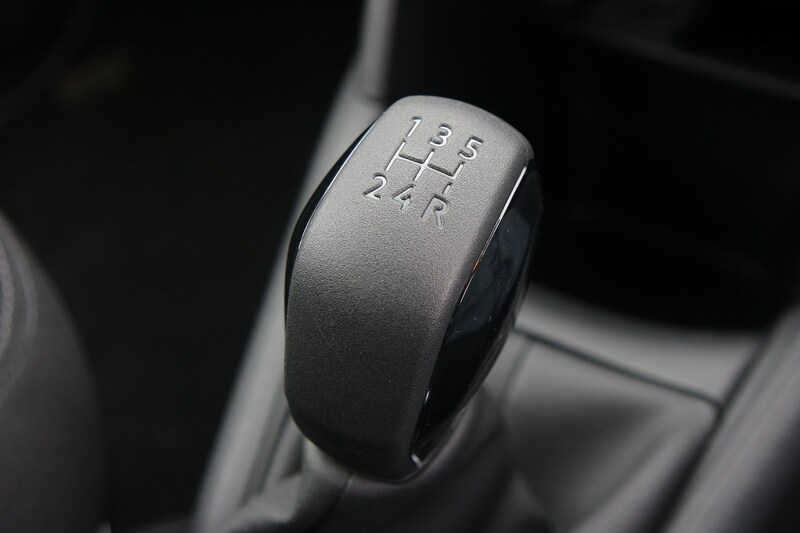 We wouldn’t recommend the semi-automatic EGC models because they are not particularly good, and they won’t add any value when you come to resell – if you need an automatic, go for the better EAT6 transmission. 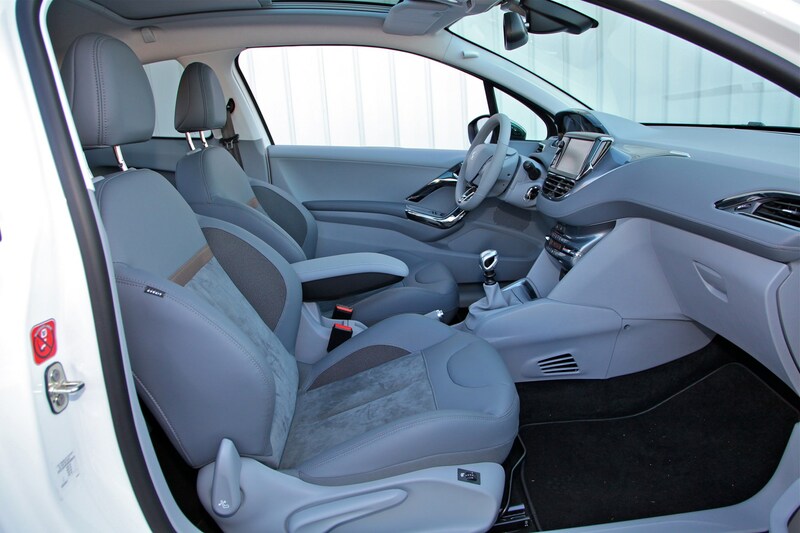 Although the diesels may seem attractive, because of the higher fuel economy, we think the petrols are the best option – particularly the 110hp 1.2-litre PureTech. 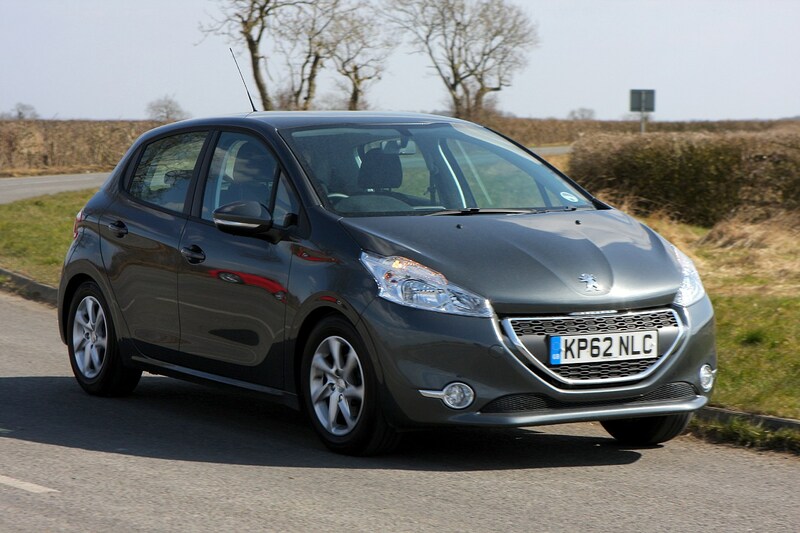 The petrols are cheaper to buy, and unless you are doing a lot of motorway miles, we don’t expect the diesels will achieve close to the official combined fuel economy. 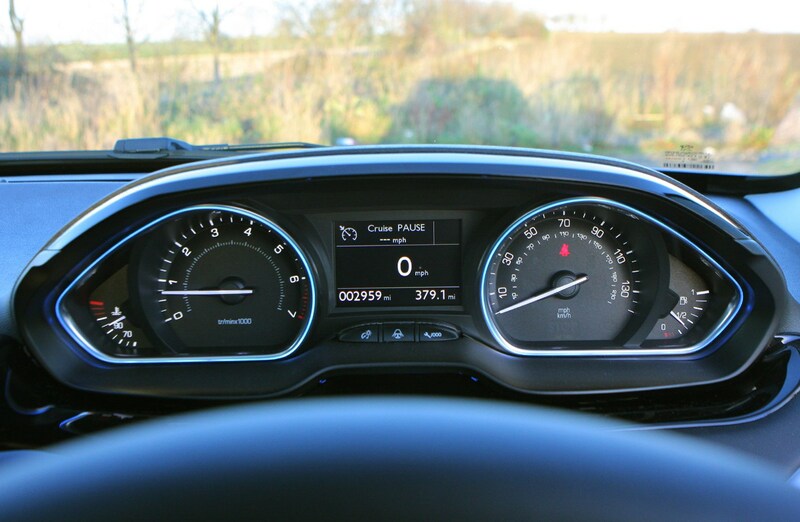 You will get better resale values with the diesels, however, but not so much to make their purchase worth it as the equivalent petrol model will be cheaper. 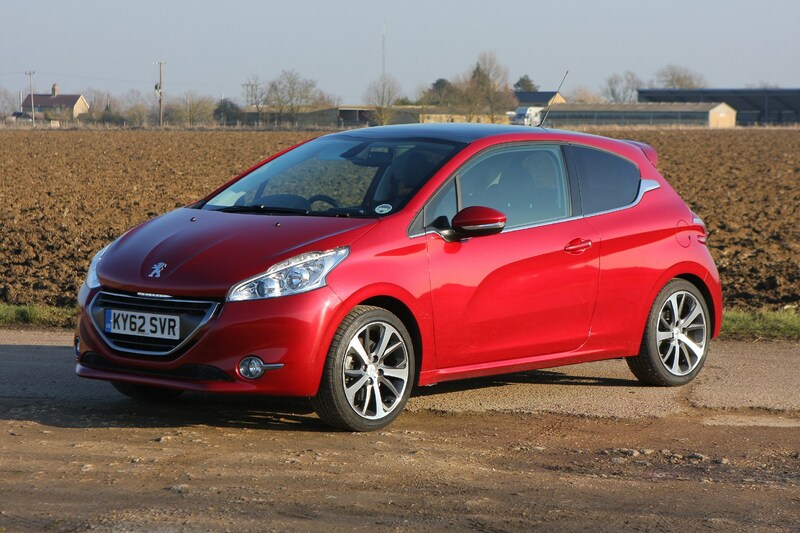 As the 208 first appeared back in 2012 and many newer rivals have come onto the scene since then, striking a favourable deal should be relatively straightforward. 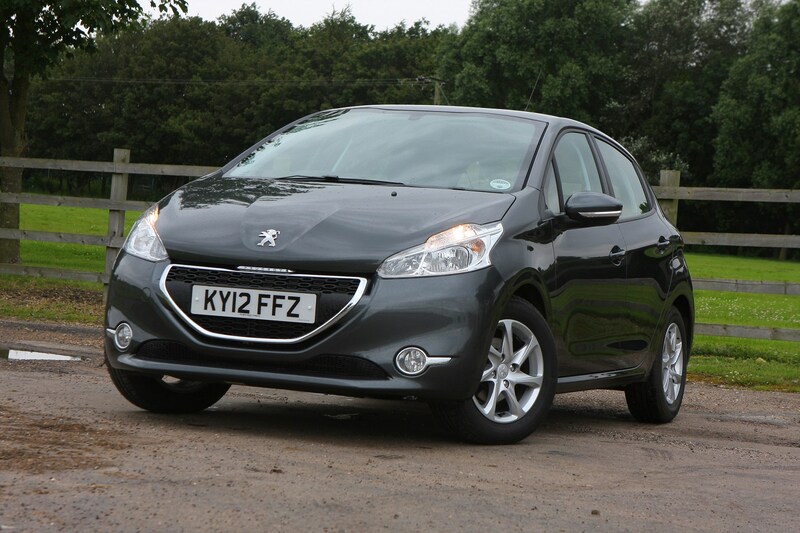 Superminis dominate the sales charts and while the Peugeot 208’s not the most popular of its breed, there’ll still be a significant number to choose from on the used market. 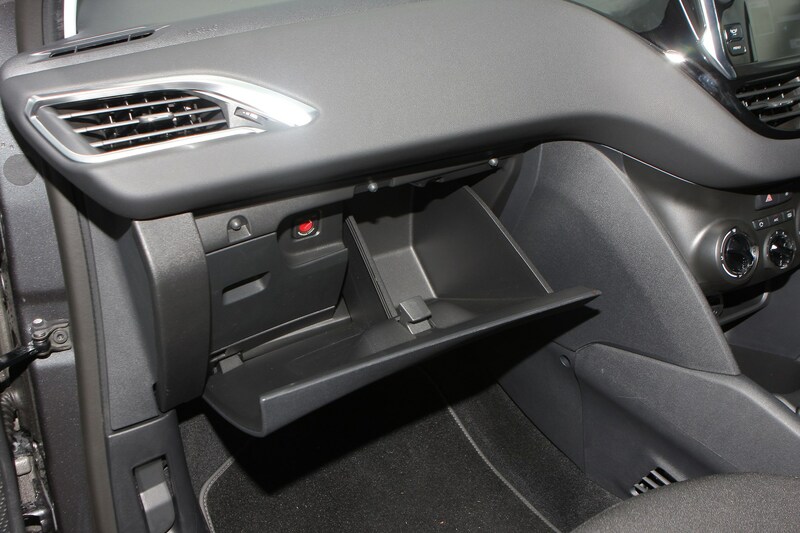 As ever, it’s important to pore over all the paperwork to ensure it corresponds with a detailed service history, as well as making sure all of the car’s equipment works as it should. 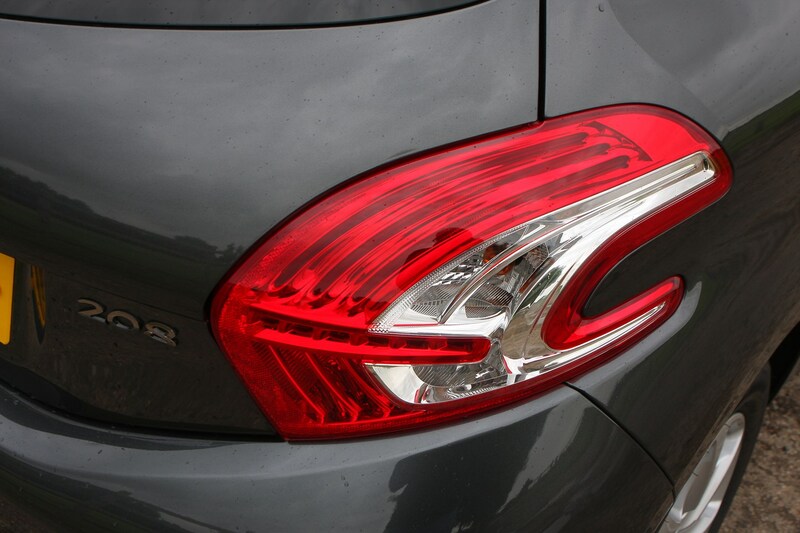 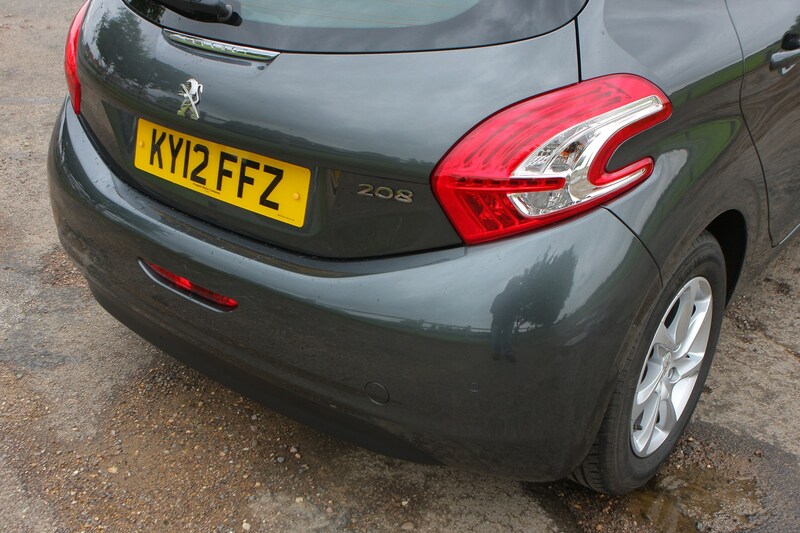 Given how many recalls the 208’s been subjected to it’s also worthwhile checking with a Peugeot dealer to ensure all of the remedial work was undertaken. 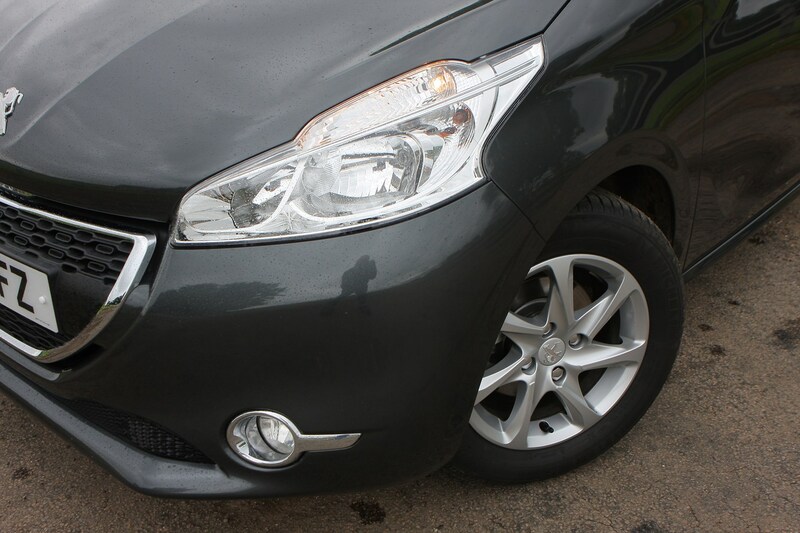 Check the car for superficial damage such as scuffed bumper corners and kerbed wheels too. 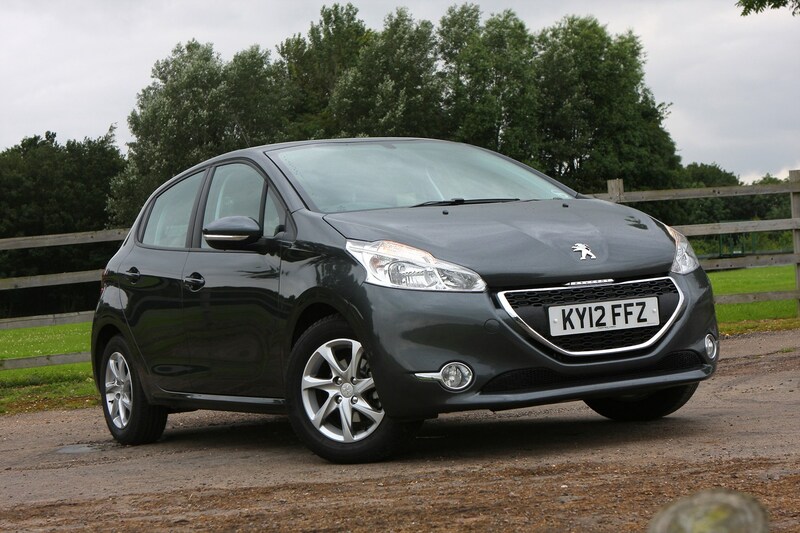 It’s likely that used diesels will command a price premium so stick to petrols unless you cover huge mileages. 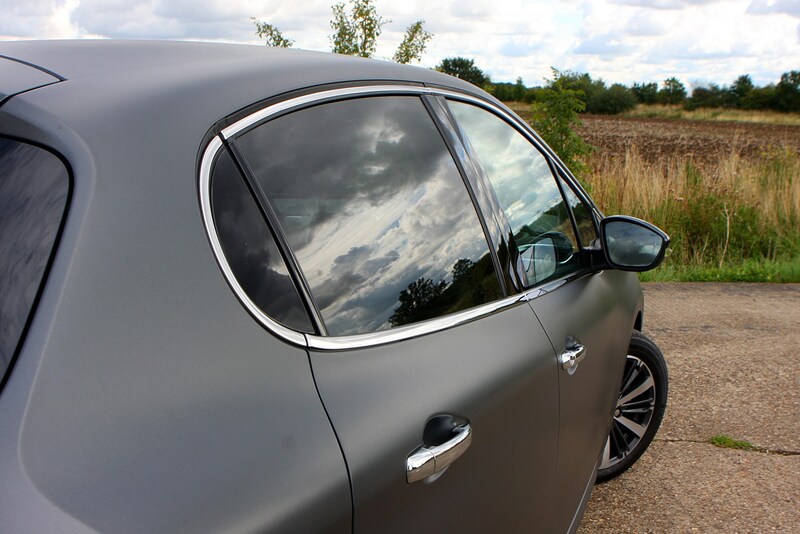 If you can stretch to a higher specification, such as Feline or GT Line, then do so and enjoy the niceties there. 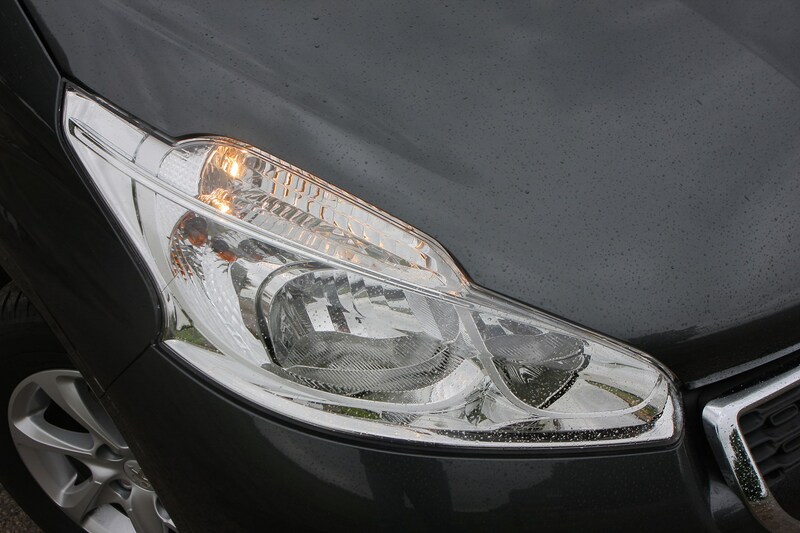 To help your car appeal to potential buyers, make sure that it is maintained according to the manufacturer’s schedule and have the paperwork to hand for any prospective buyer to pore over. 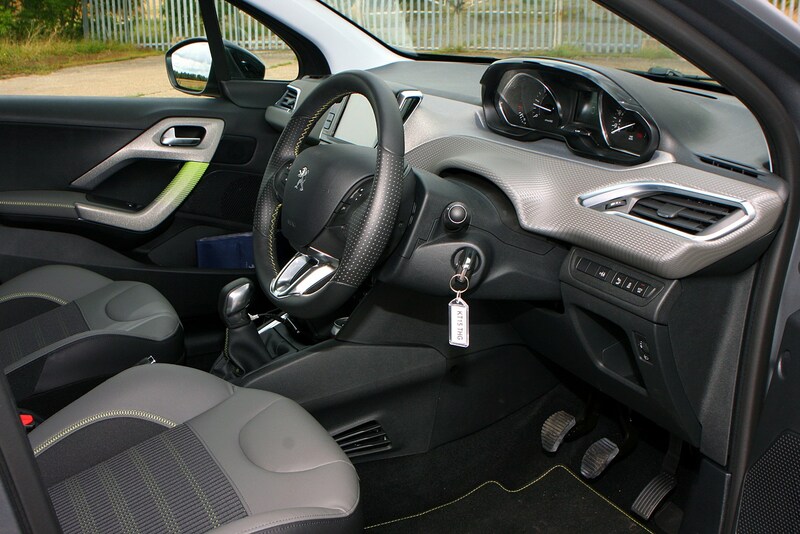 There are plenty of 208s for sale, so keeping yours in the best possible condition will help it stand out when the time comes to sell it. 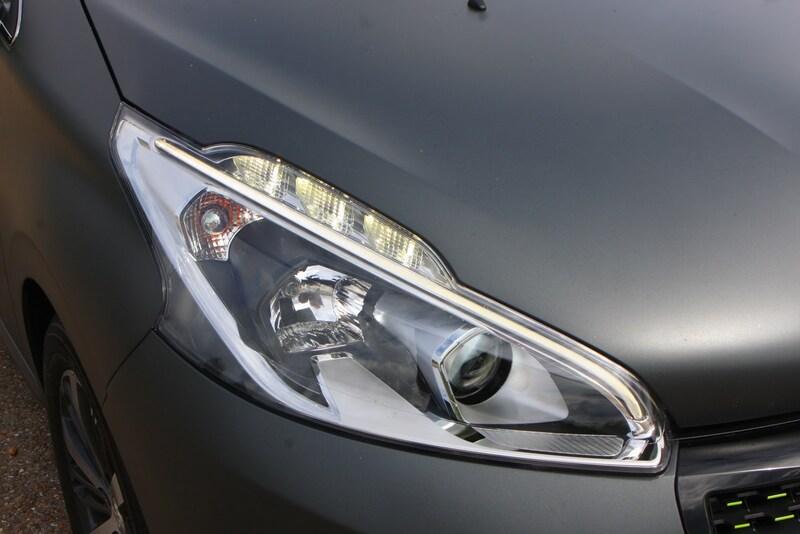 This includes fixing any bodywork or equipment maladies and ensuring it’s been fully valeted. 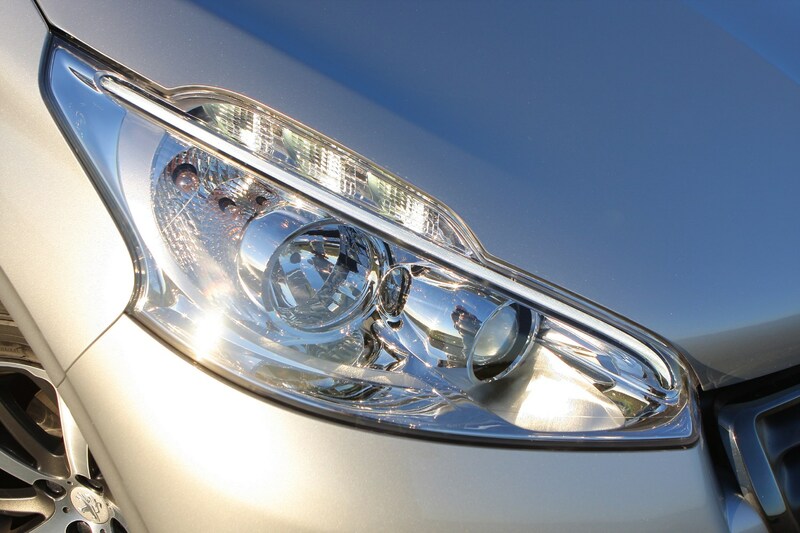 Price your car sensibly using the Parkers valuation tool and if you’re selling a GTi version, consider promoting it on an owner’s forum for greater exposure.